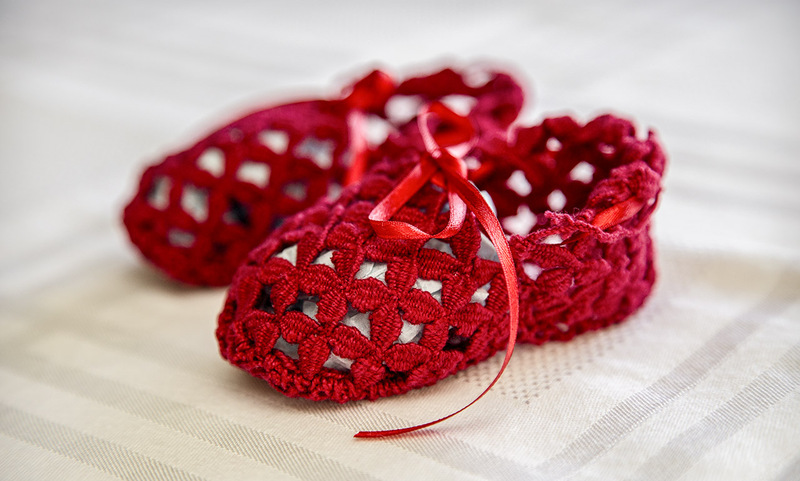 Description: Rio Vermelho lacemakers group. 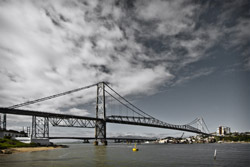 Description: The bridge connects the mainland and the island town of Florianopolis part. 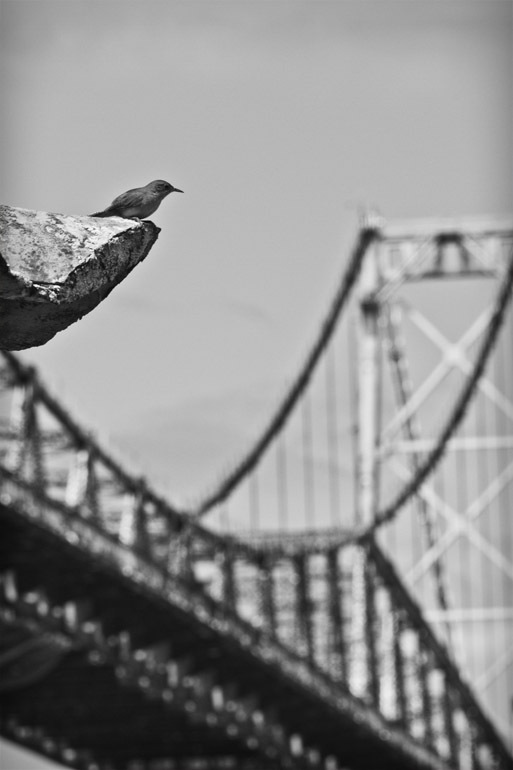 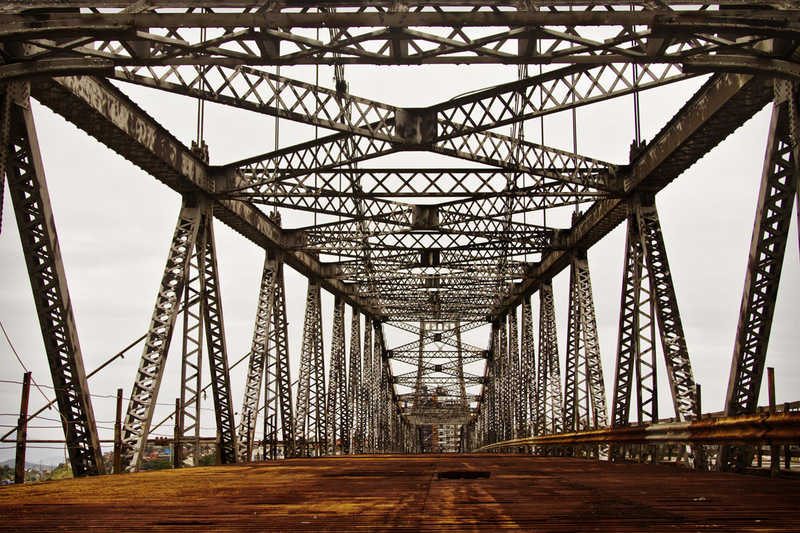 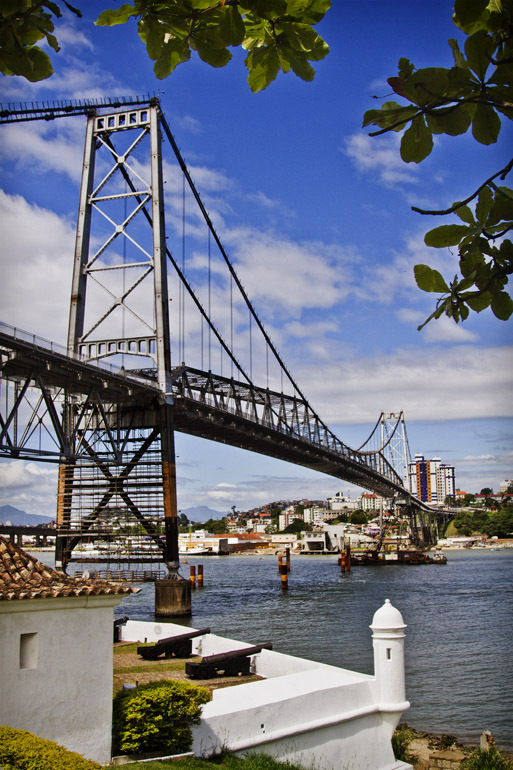 It is one of the largest suspension bridges in the world and the largest in Brazil. Its construction began on November 14, 1922 and was inaugurated on May 13, 1926. 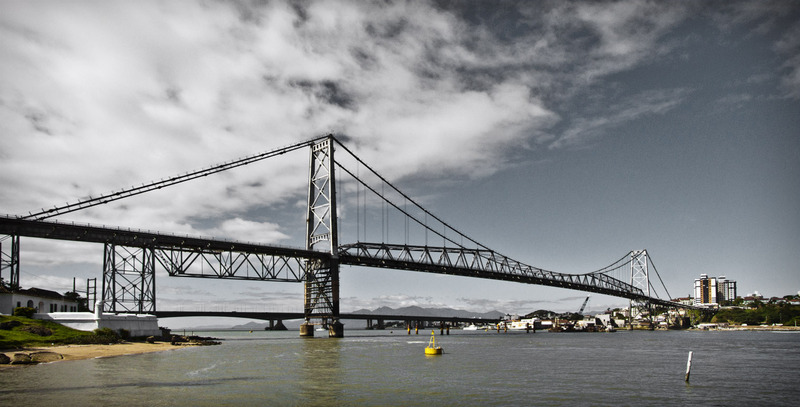 He is currently closed for the passage of people or vehicles due to a reform of its structure. 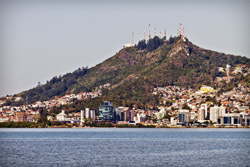 Description: View of constructions of Journalista Rubens de Arruda Ramos Avenue and the Cross Hill in the region of Agronômica neighborhood. 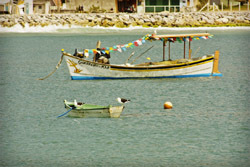 Description: Place: Costa da Lagoa neighborhood. 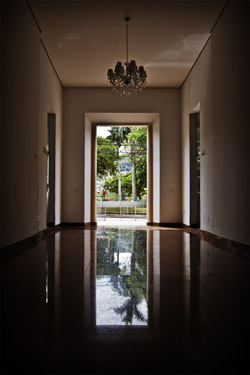 Description: Oil on canvas, the work of Brazilian artist Almir Tirelli born in the state of Maranhão. 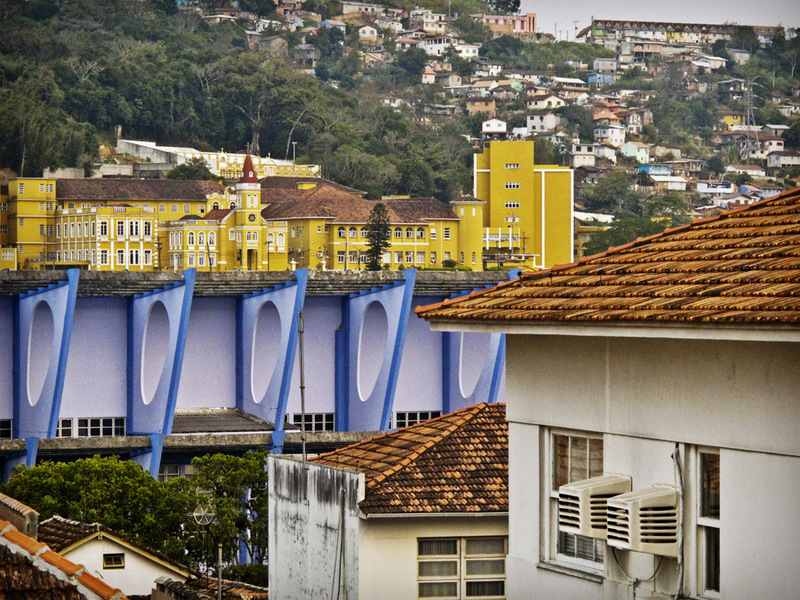 Collection of the Headquarters of the General Command of the Military Police of Santa Catarina. 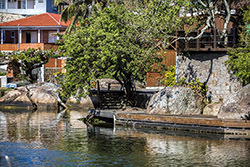 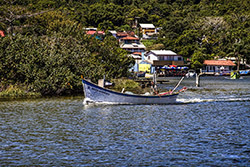 Description: Barra da Lagoa channel. 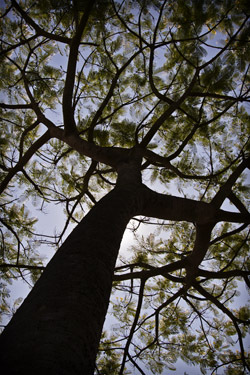 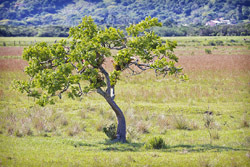 Description: It is the tree symbol of Florianópolis. 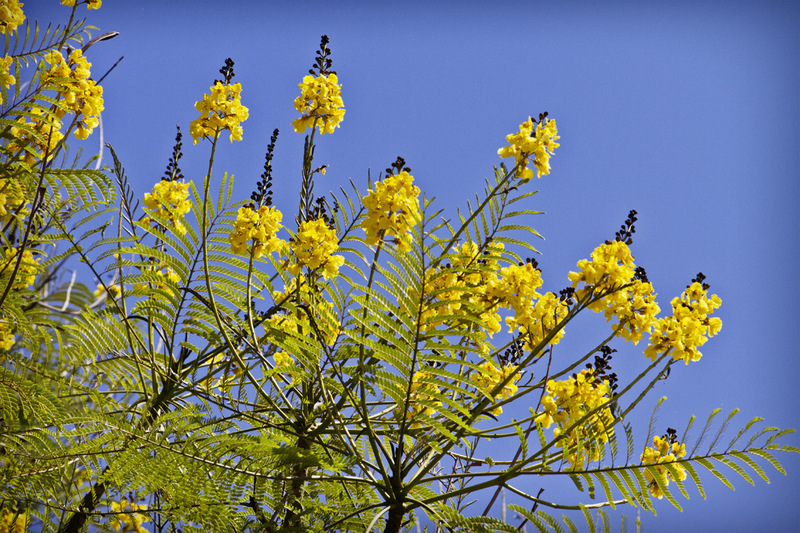 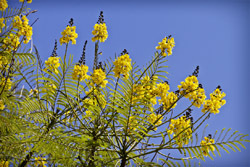 Its flowers are bright yellow coloring. 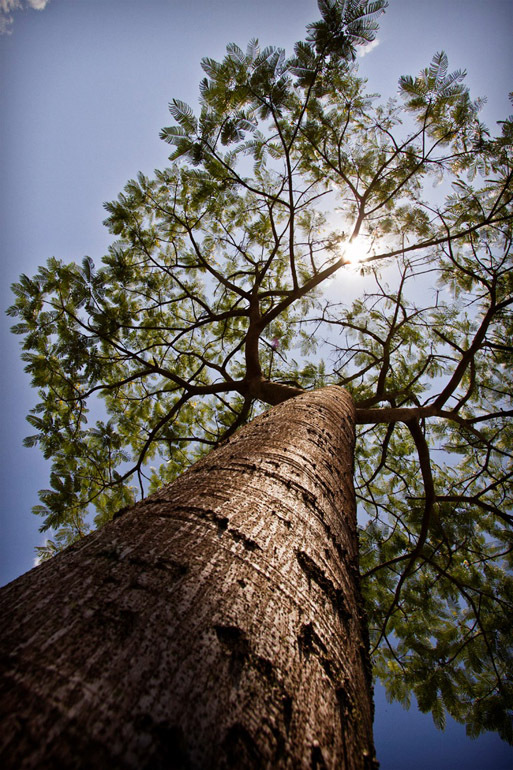 Trees can measure 30 meters high and in the past were widely used in making canoes for fishing. 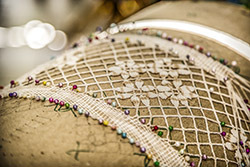 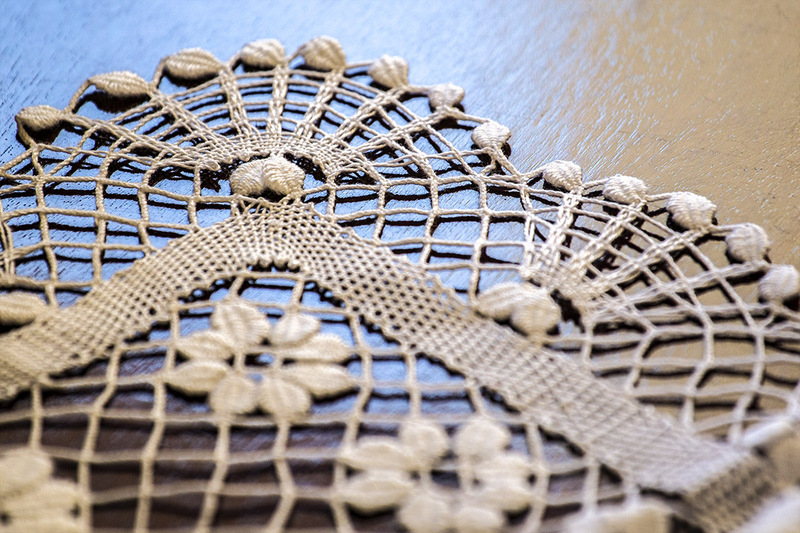 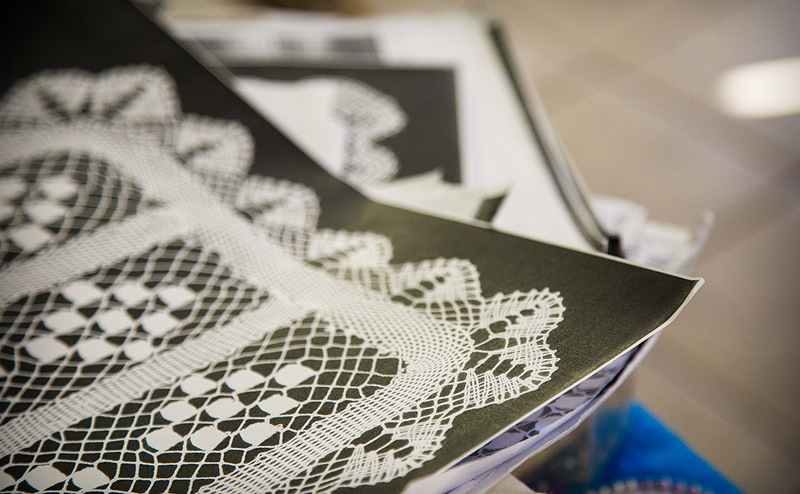 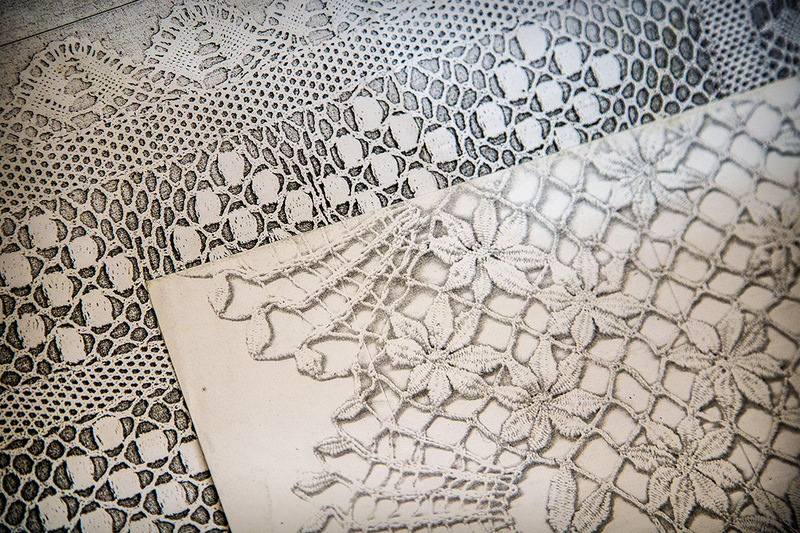 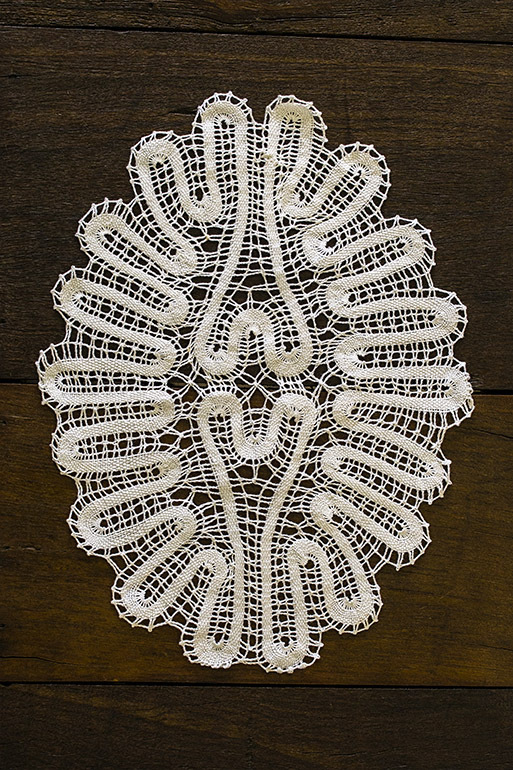 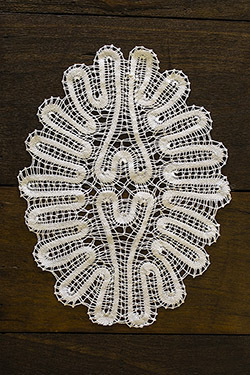 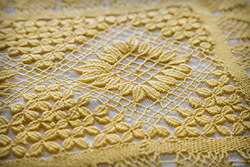 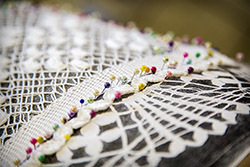 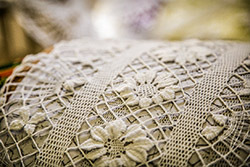 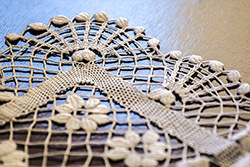 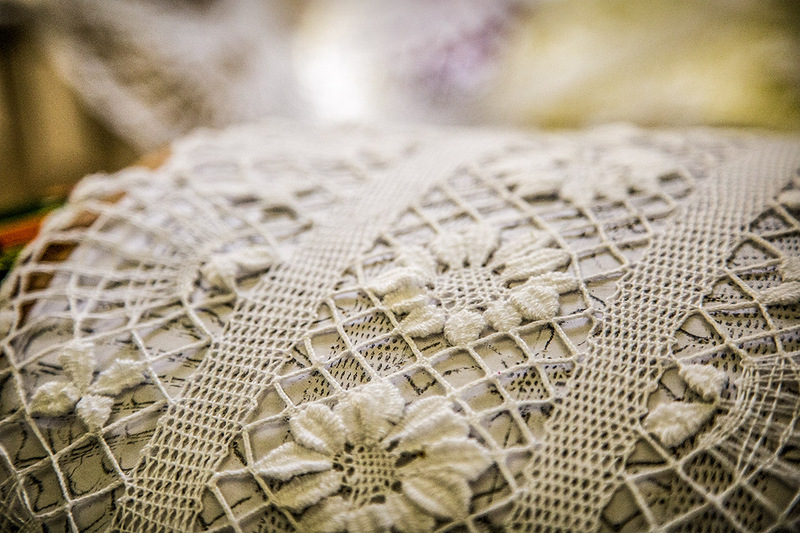 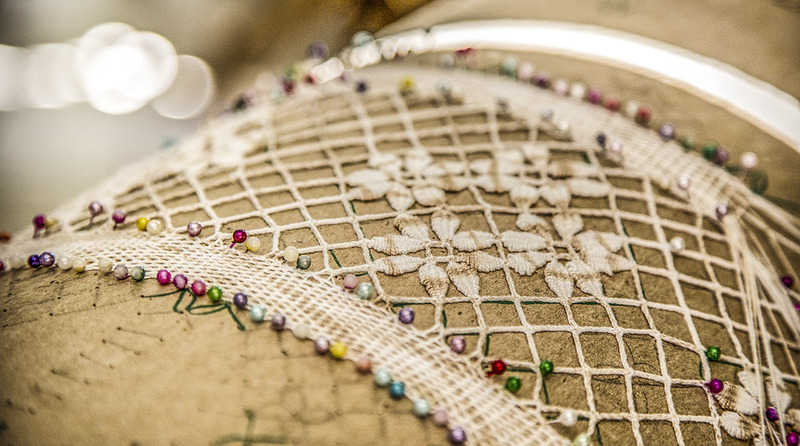 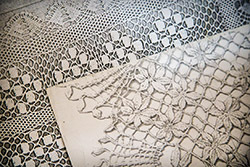 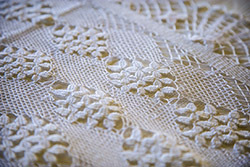 Description: Plate typically found in places where lacemakers sell bobbin lace. 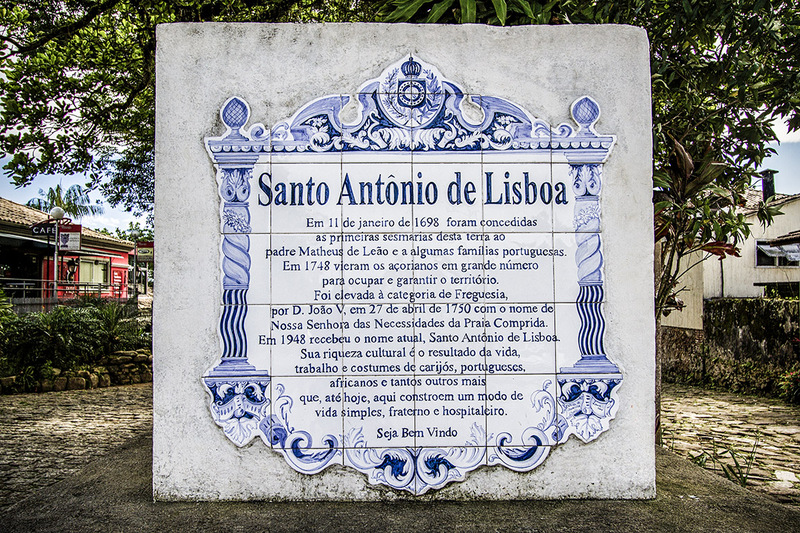 Place: Santo Antônio de Lisboa neighborhood. 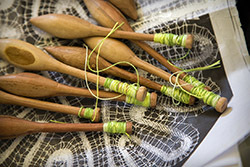 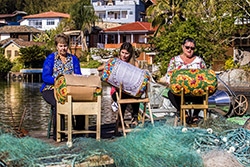 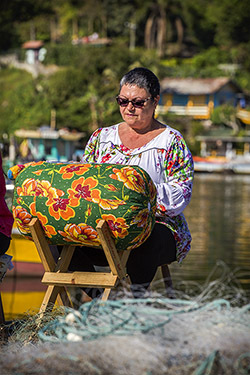 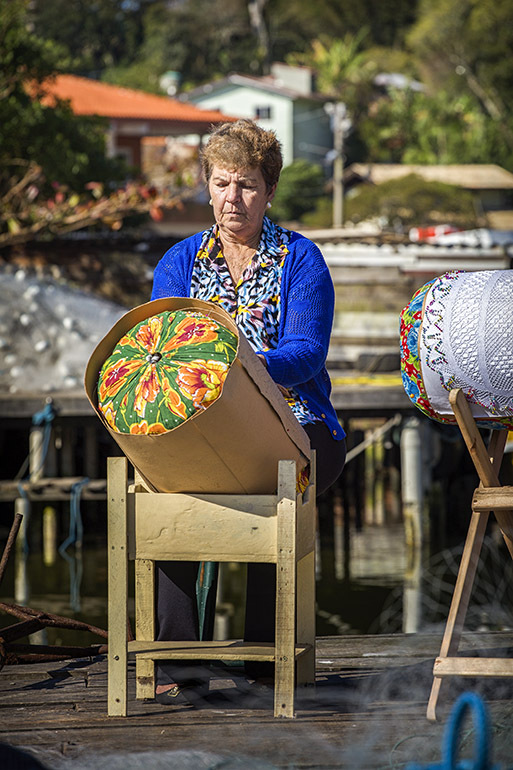 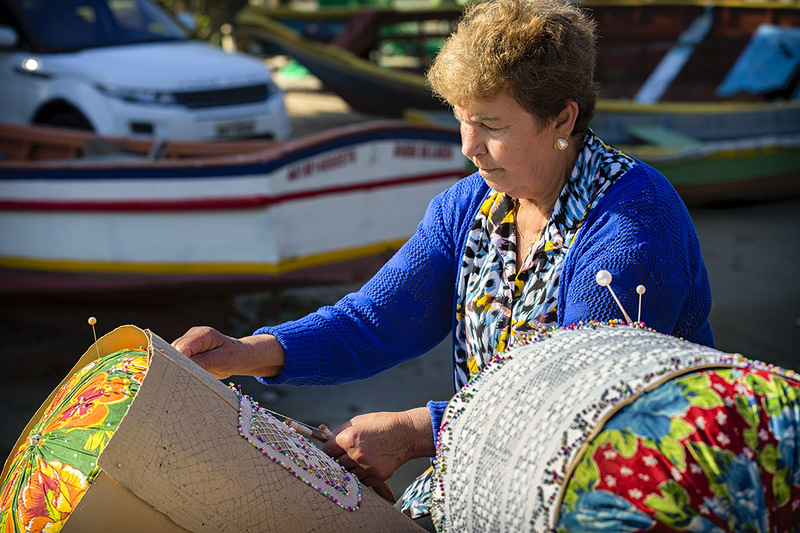 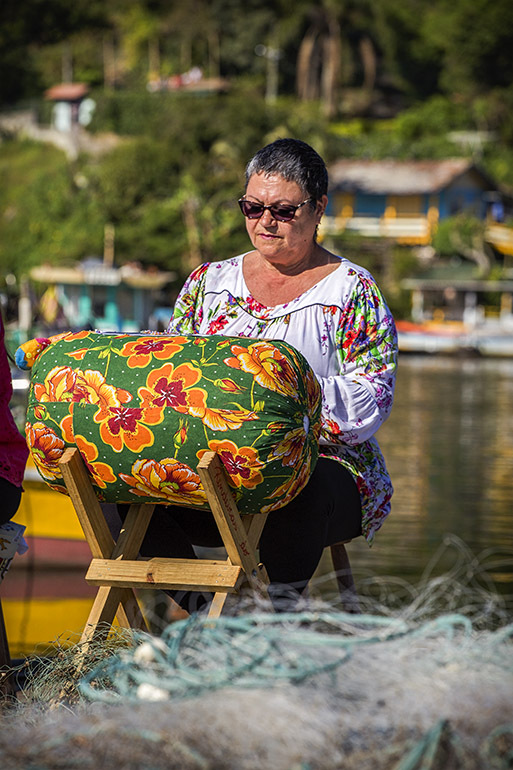 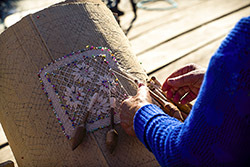 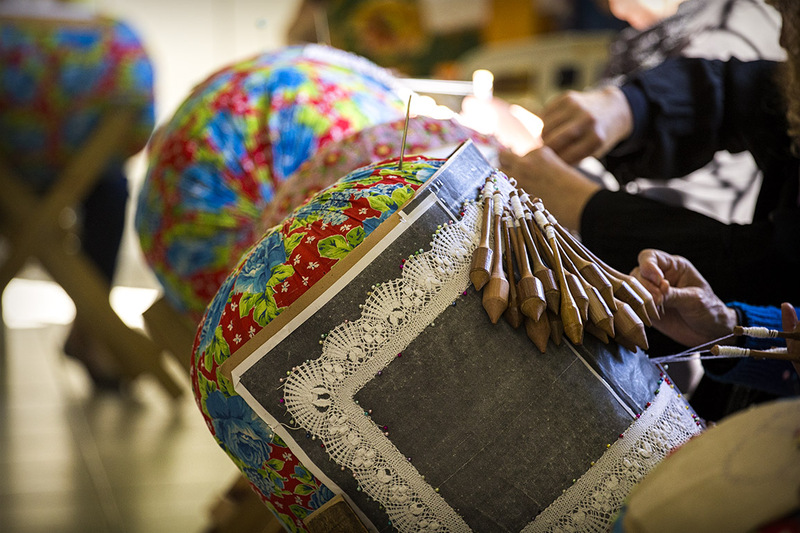 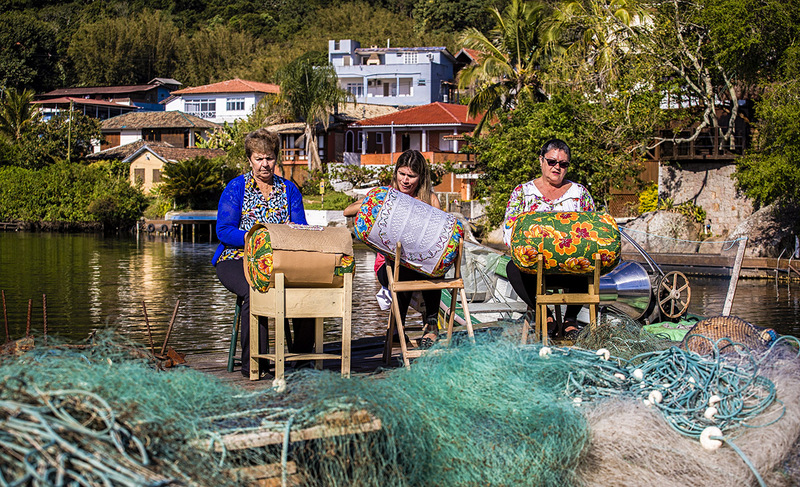 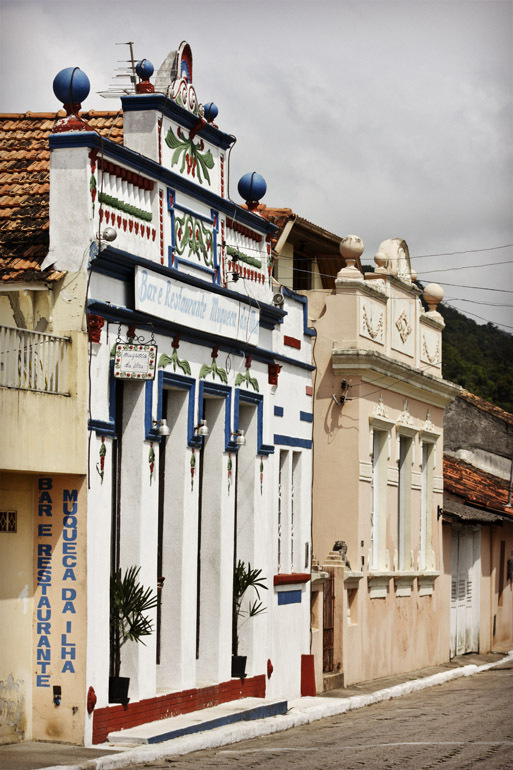 Description: Traditional place of concentration of bobbin lacemakers on Santa Catarina Island. 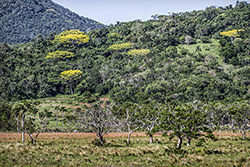 Description: Garapuvu (Schizolobium parahyba). 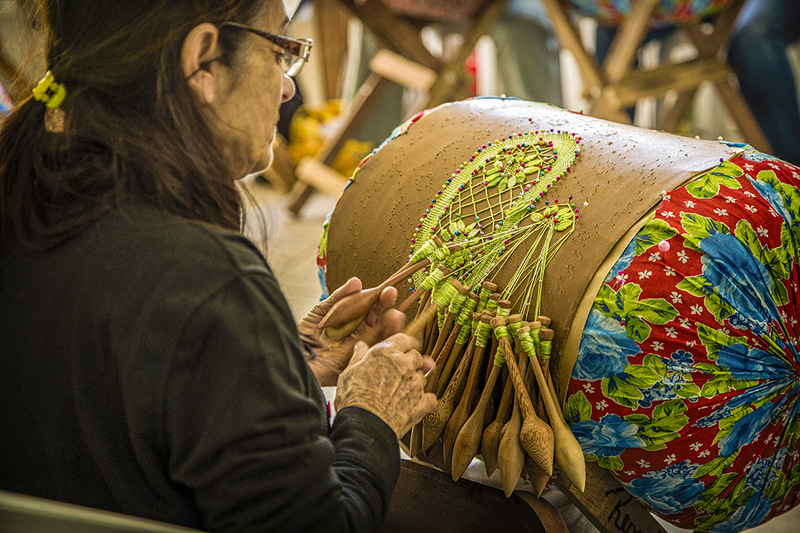 According to the ancient canoemen, the stem wood of these trees are the most suitable for the manufacture of canoes, because of its lightness and ease of carving. 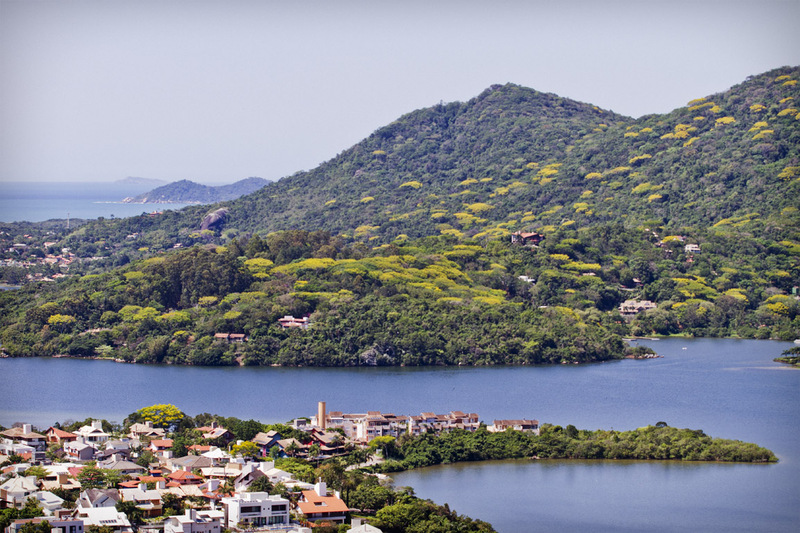 With the danger of extinction, in June 15, 1992, the Municipal Act 3771 made ​​it the tree symbol of the city of Florianópolis, imposing a series of restrictions on its use for these purposes. 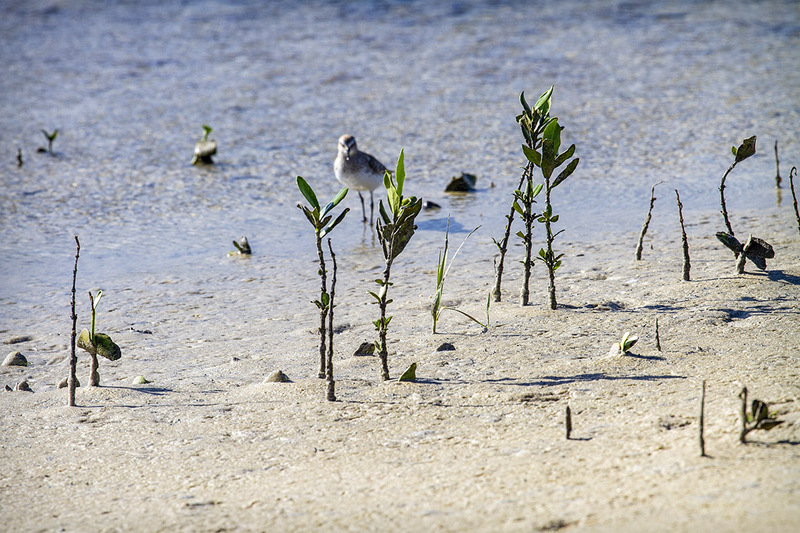 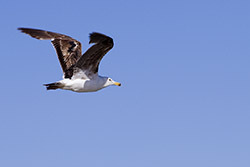 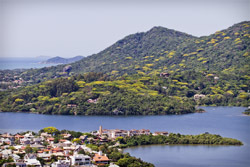 Currently it is possible to observe its recovery in the flora of the region, especially during its flowering in the presence of several trees of these species. 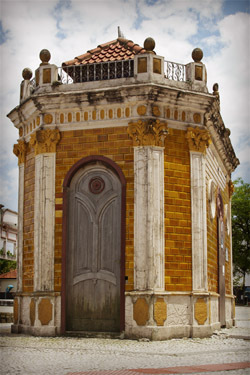 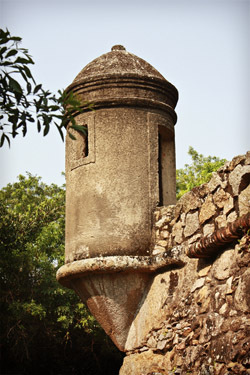 Description: This water fountain is located near the Fort of São José da Ponta Grossa. All fortifications possessed own source of water sheltered and protected drinking water, which is essential in situations of protracted siege, had completed its function or not with tanks and other structures for harnessing rainwater. 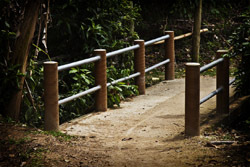 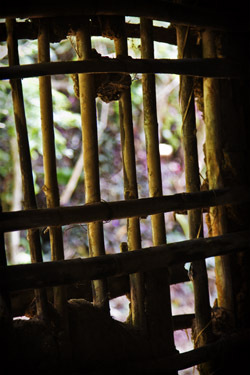 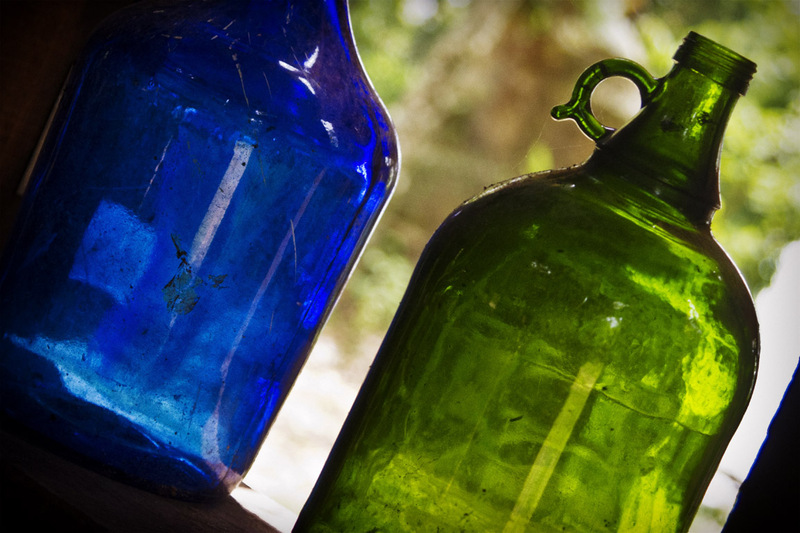 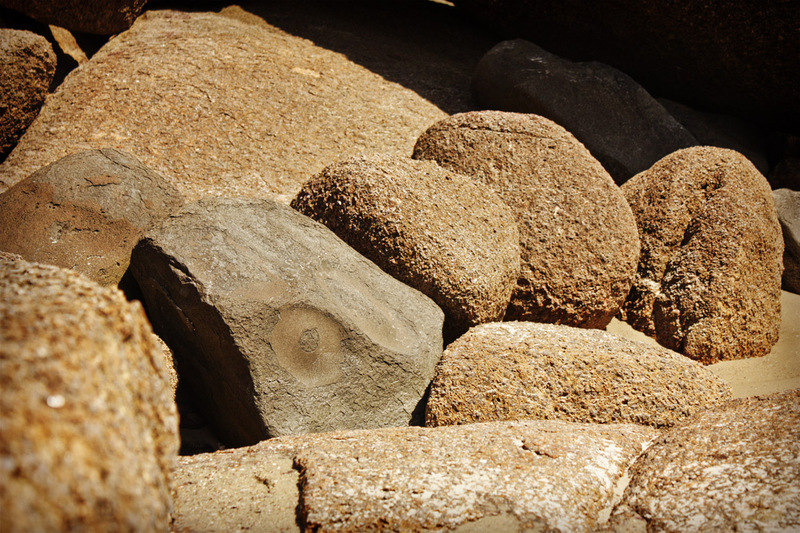 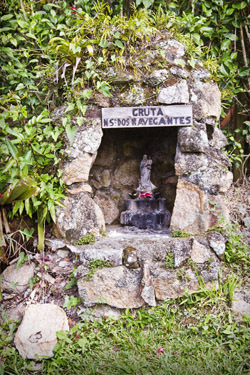 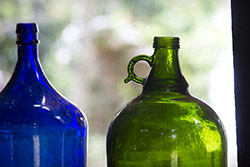 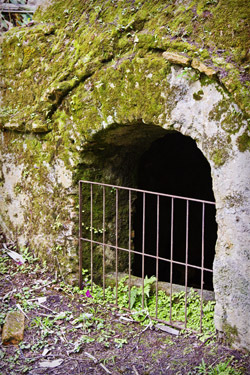 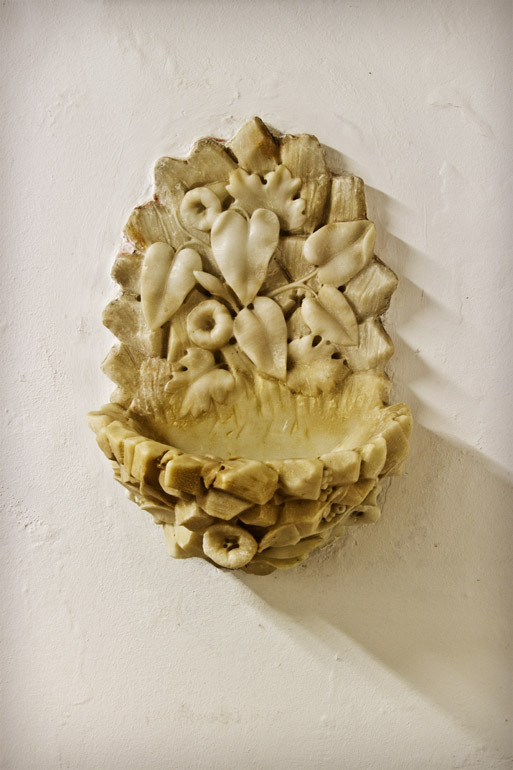 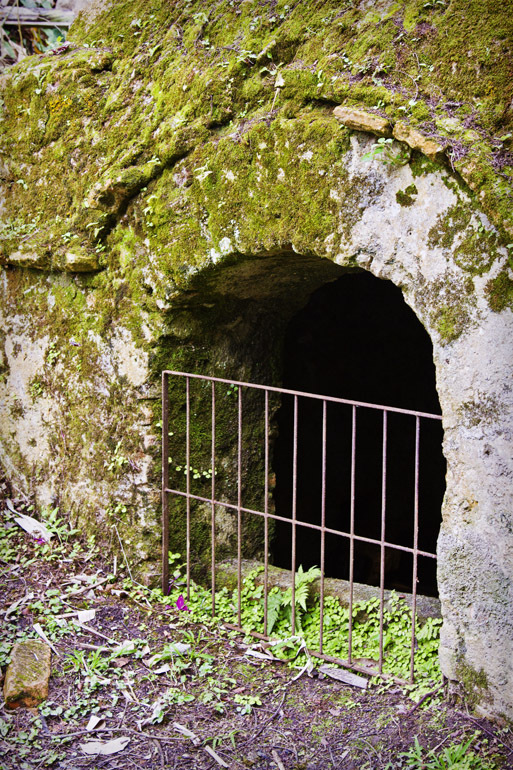 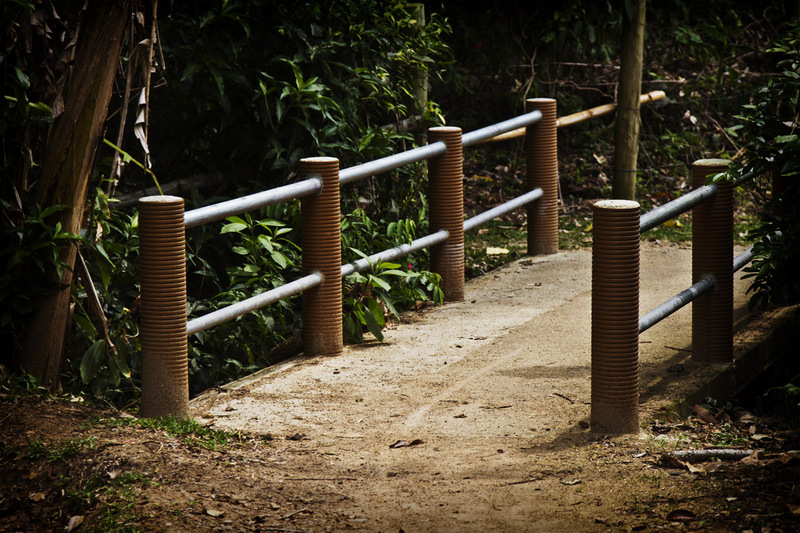 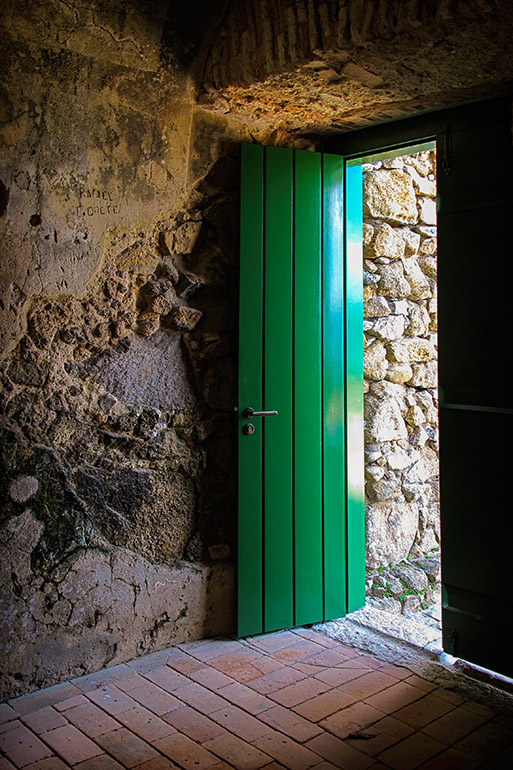 It is curious, therefore, the location of this source, positioned outside the walls of the Fortress of Ponta Grossa. 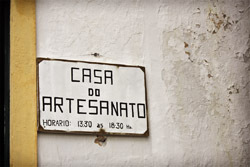 Description: Place: Santo Antônio de Lisboa neighborhood. 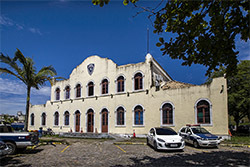 Description: Posterior side of the Headquarters of the General Command of the Military Police of Santa Catarina. 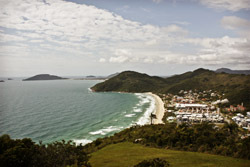 Description: Barra da Lagoa beach. 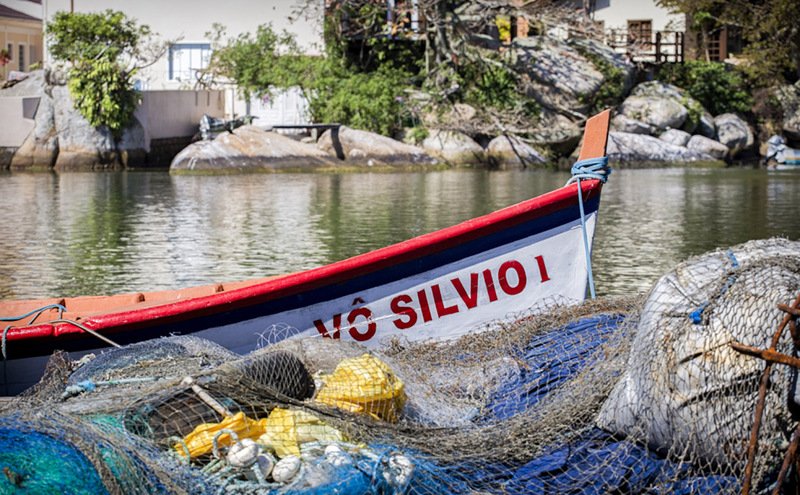 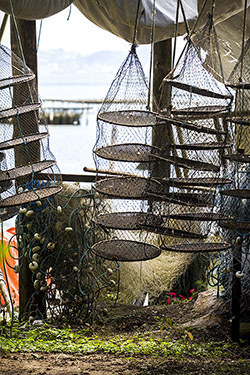 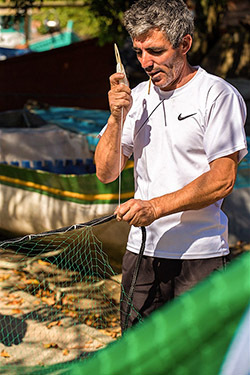 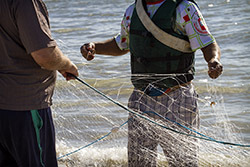 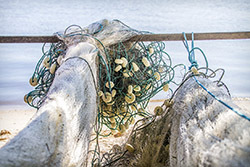 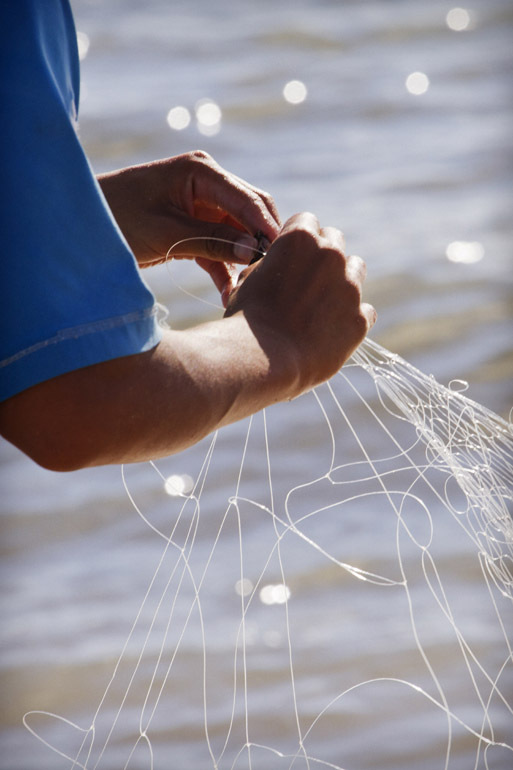 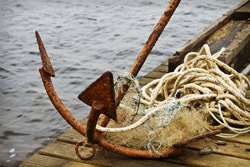 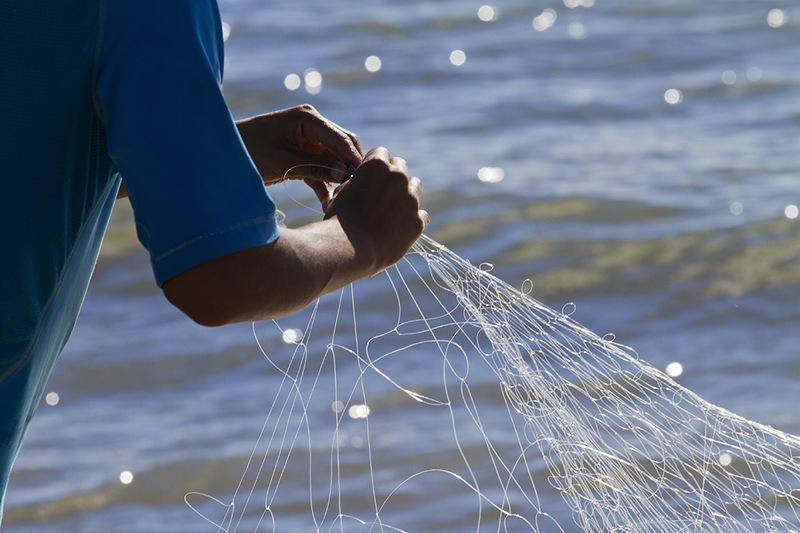 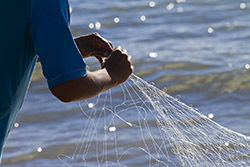 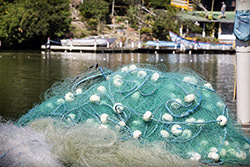 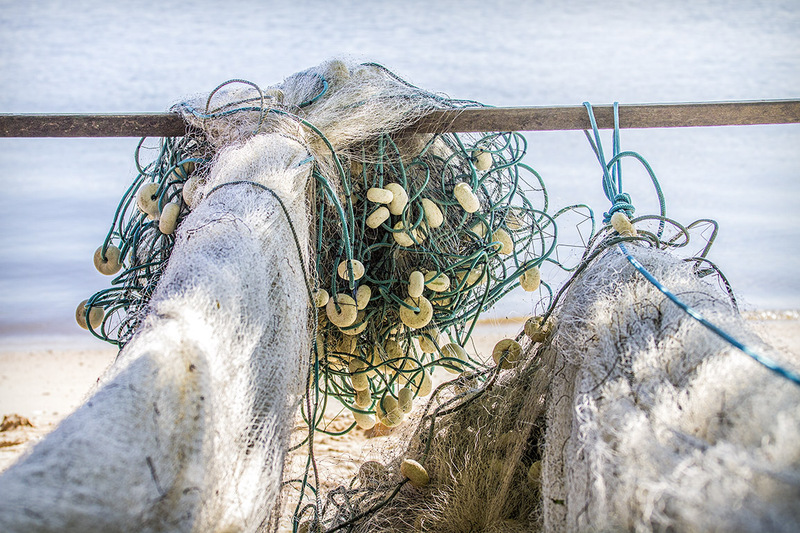 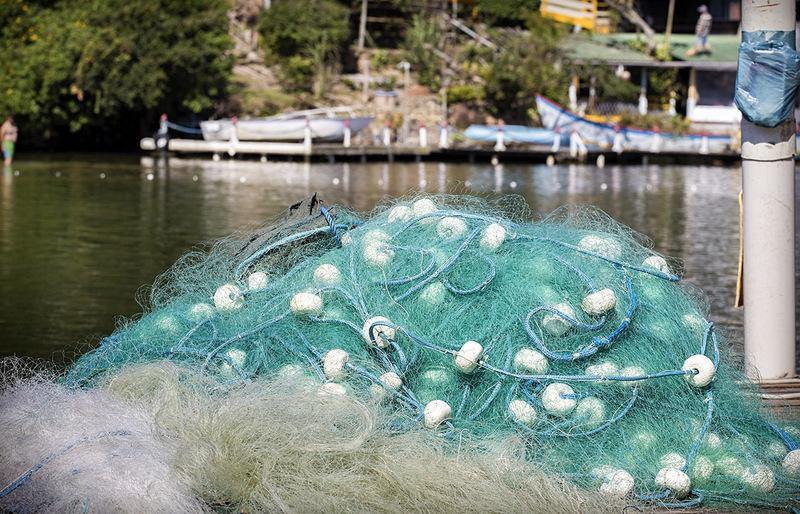 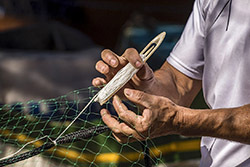 This picture shows Mr. Silvano Vieira weaving his own net. 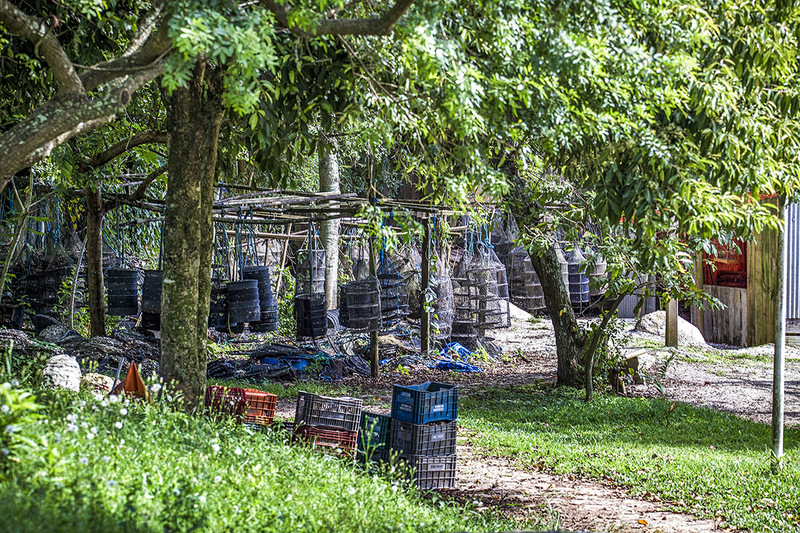 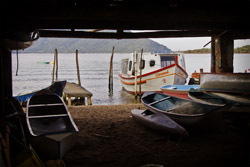 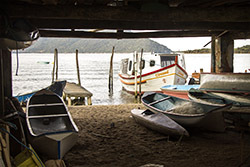 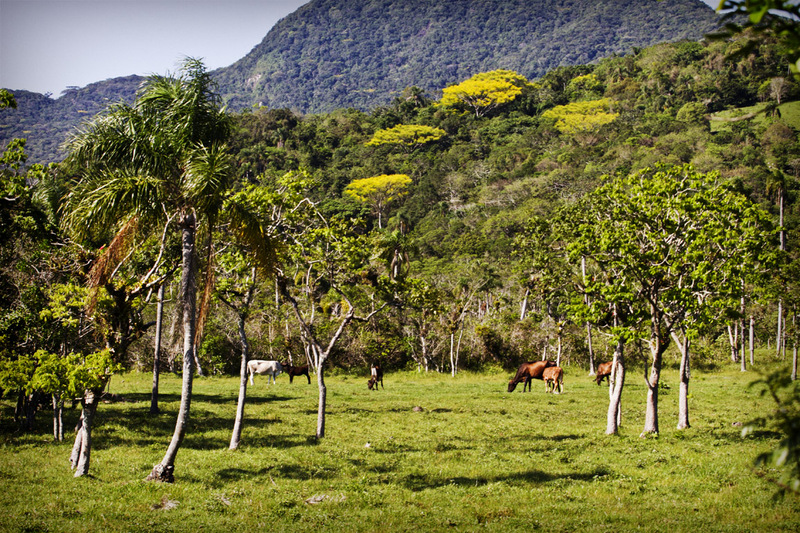 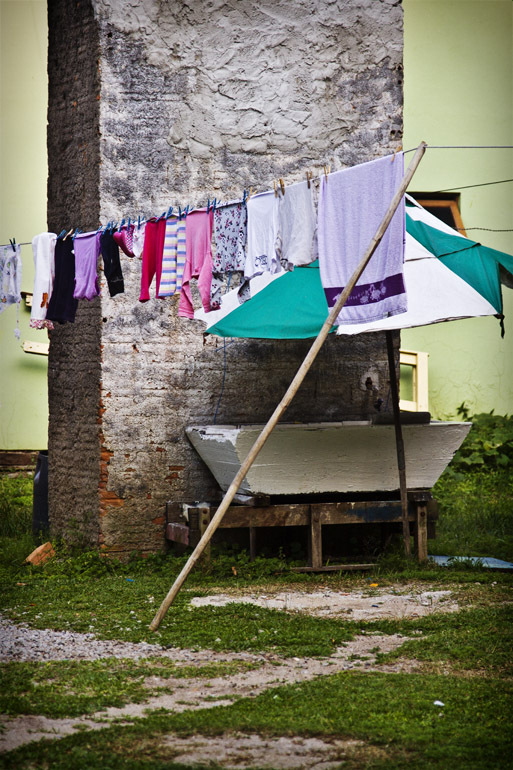 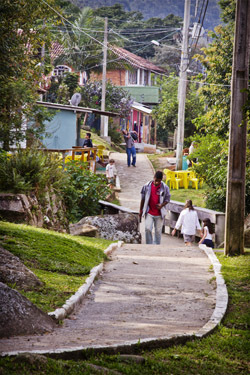 Description: Typical scene from the interior of Santa Catarina Island, at Tapera neighborhood. 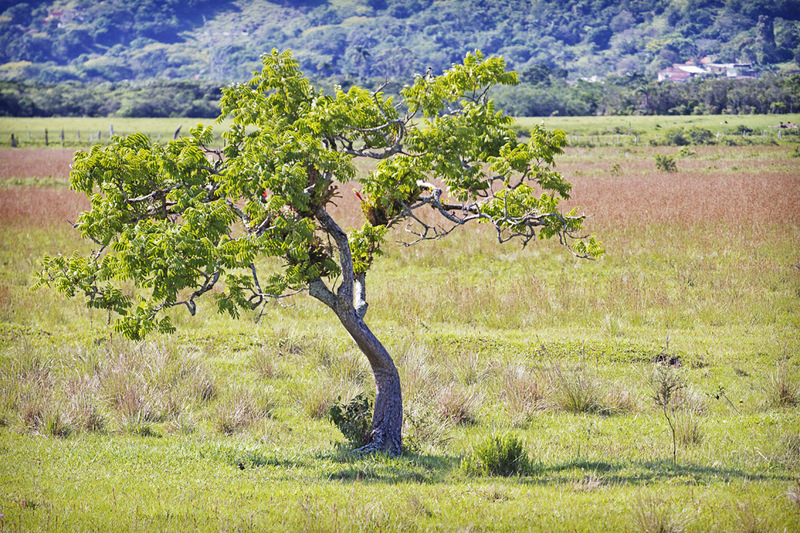 In the background it is possible to see the trees of Garapuvu (Schizolobium parahyba). According to the ancient canoemen, the stem wood of these trees are the most suitable for the manufacture of canoes, because of its lightness and ease of carving. 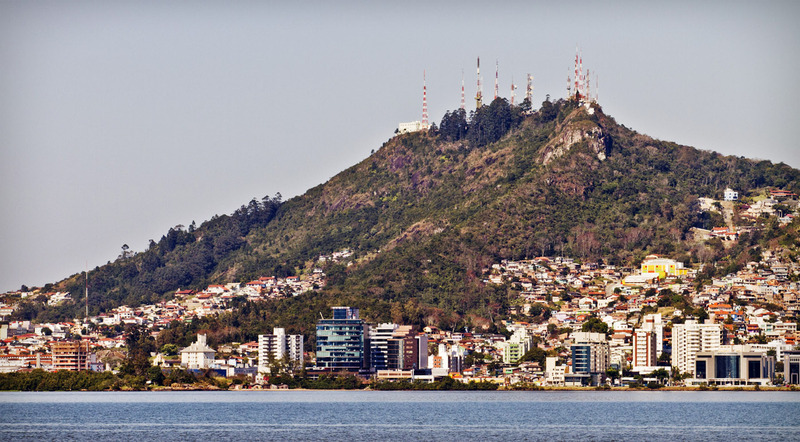 With the danger of extinction, in June 15, 1992, the Municipal Act 3771 made ​​it the tree symbol of the city of Florianópolis, imposing a series of restrictions on its use for these purposes. 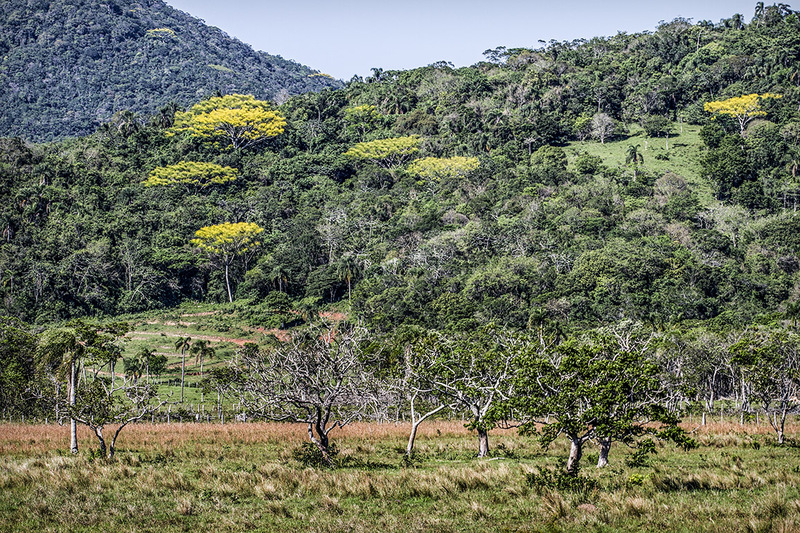 Currently it is possible to observe its recovery in the flora of the region, especially during its flowering in the presence of several trees of these species. 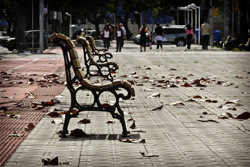 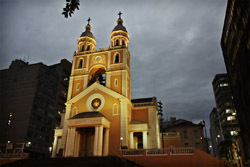 Description: It is located in Celso Ramos Square. 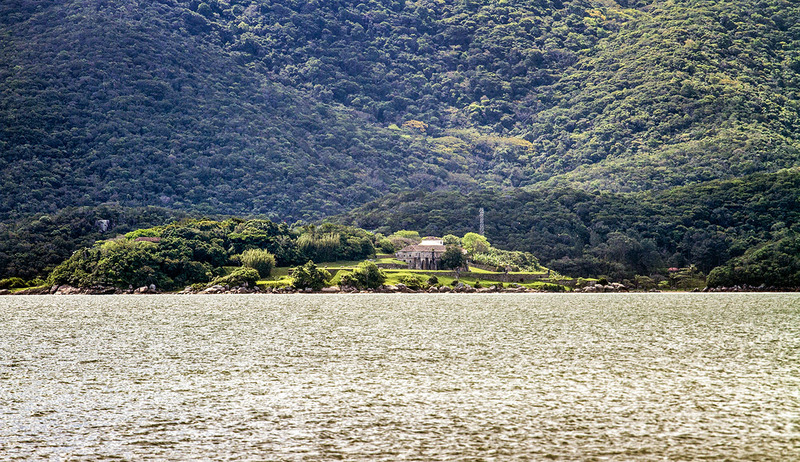 It is part of the first Sewage System of Florianópolis. It was inaugurated on 11.07.1916. 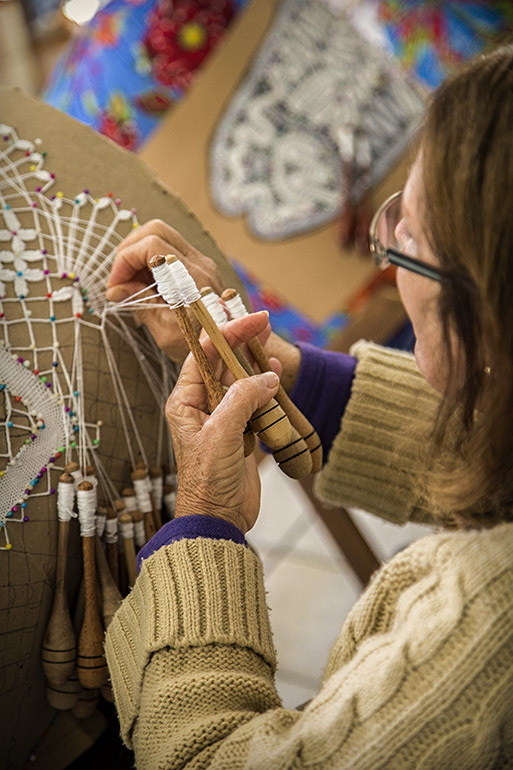 Description: Mrs. Duarte always visit her friends of Rio Vermelho lacemakers group bringing them her joy and experience of making bobbin lace. 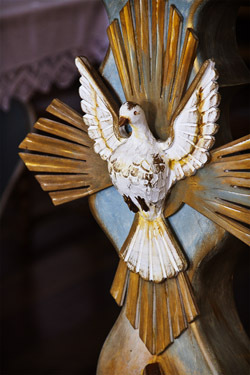 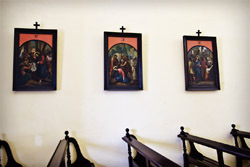 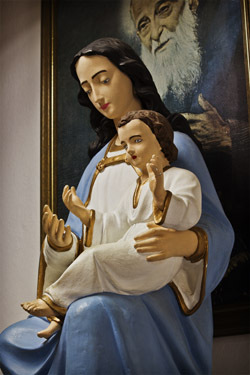 Description: Collection of the Nosso Senhor Jesus Passos Chapel of the Imperial Charity Hospital. 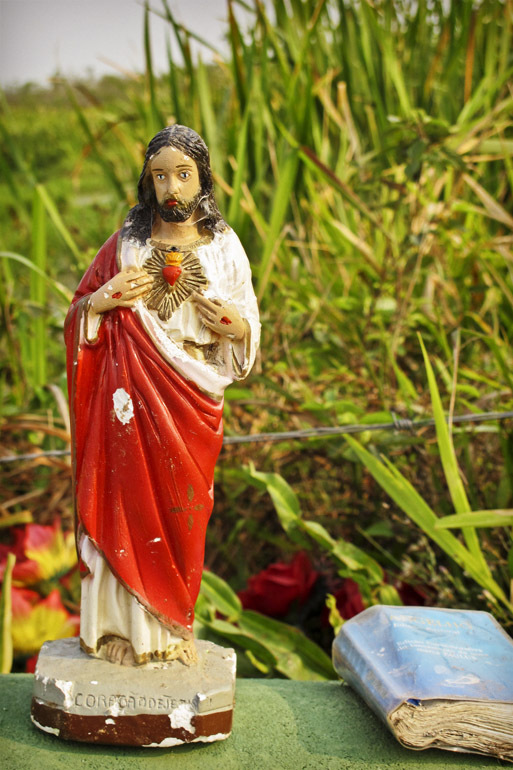 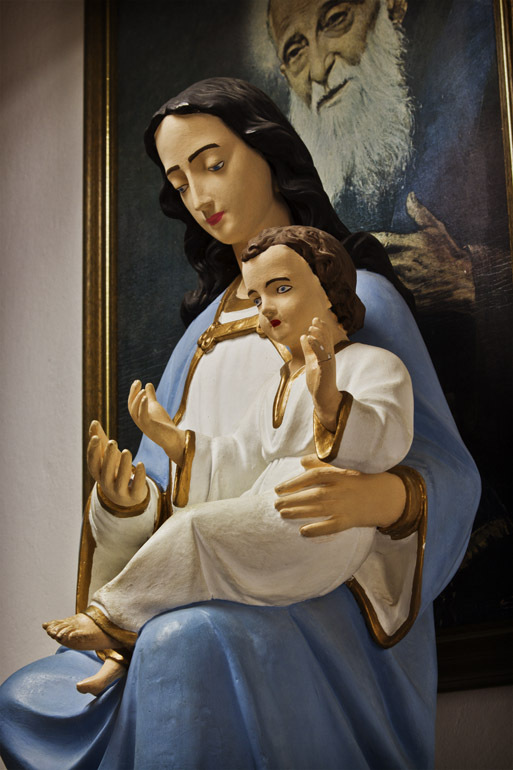 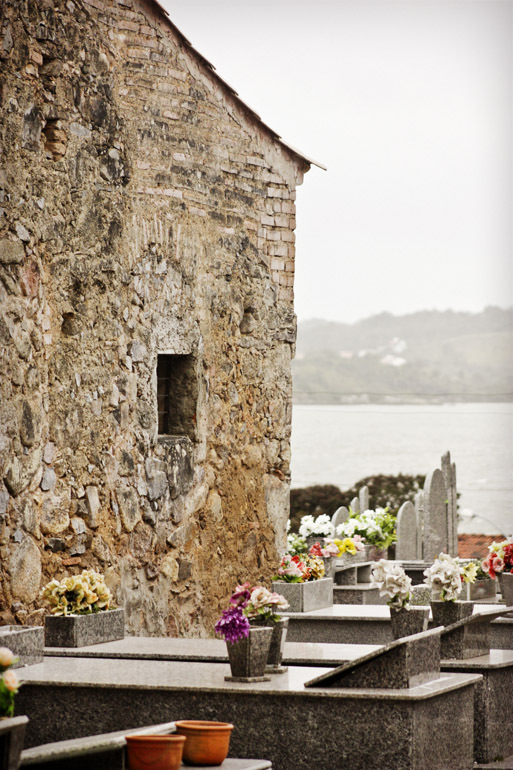 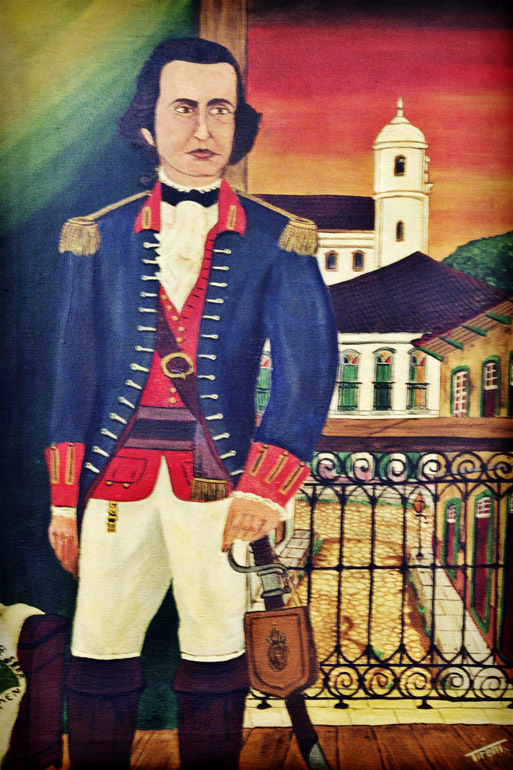 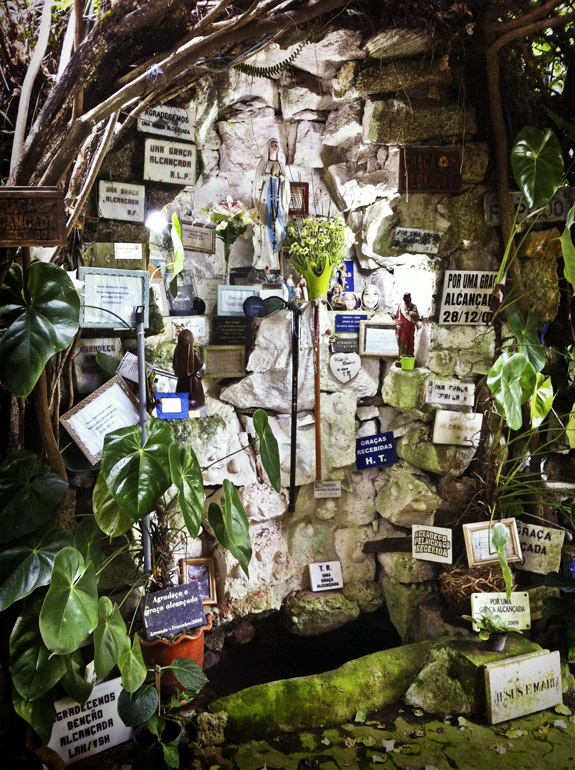 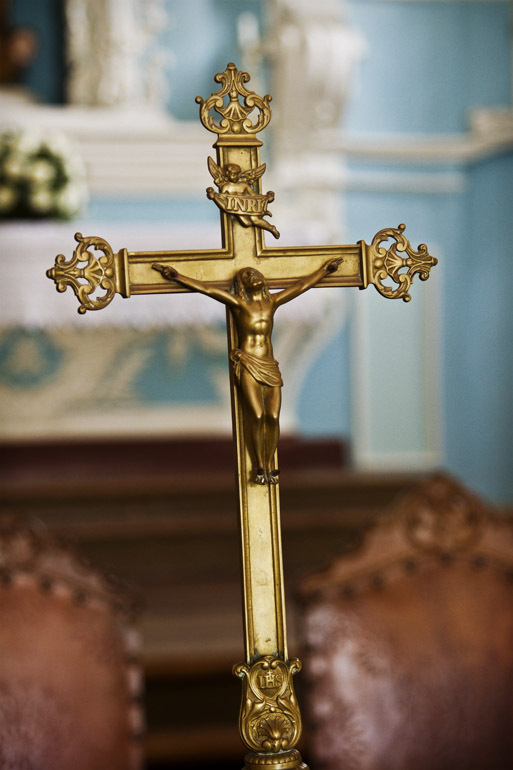 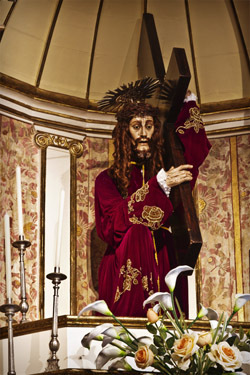 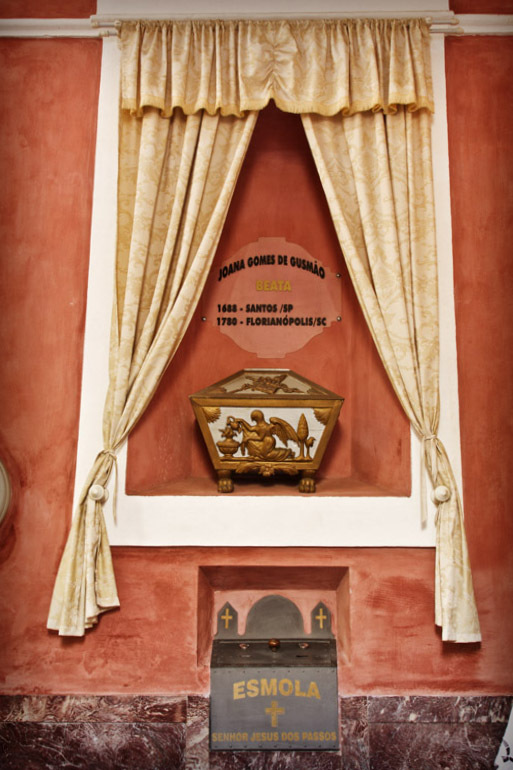 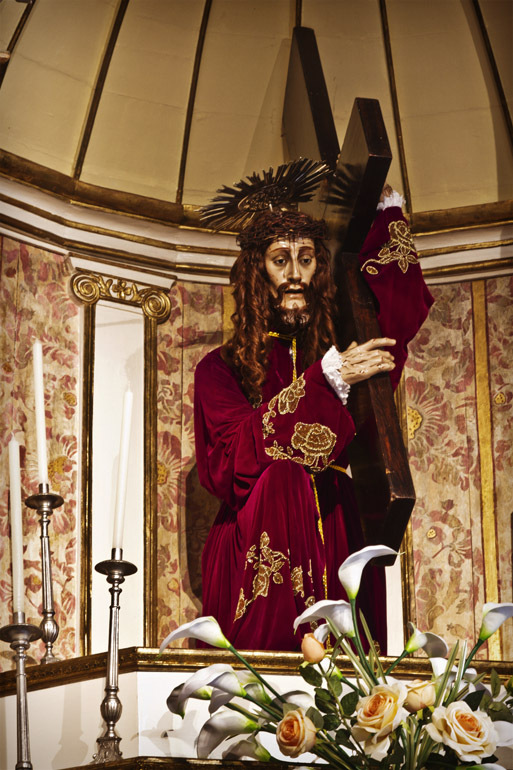 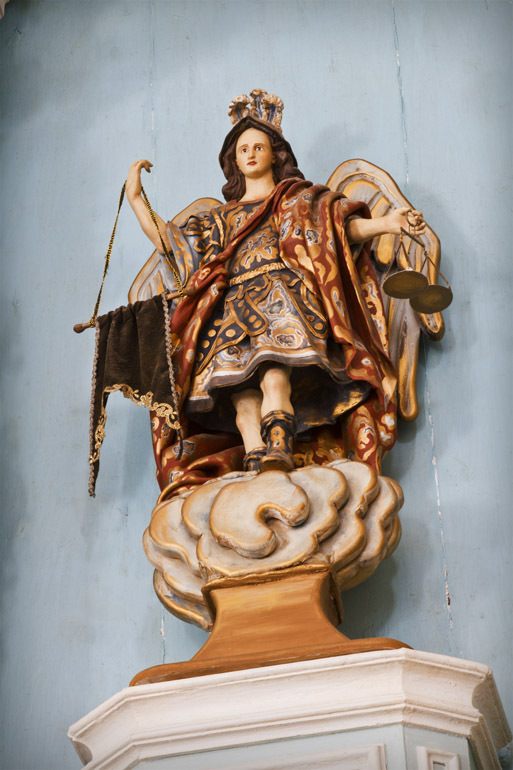 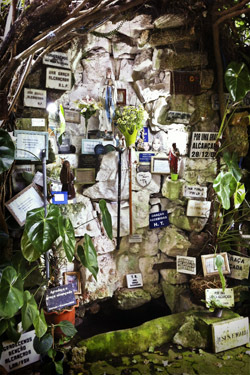 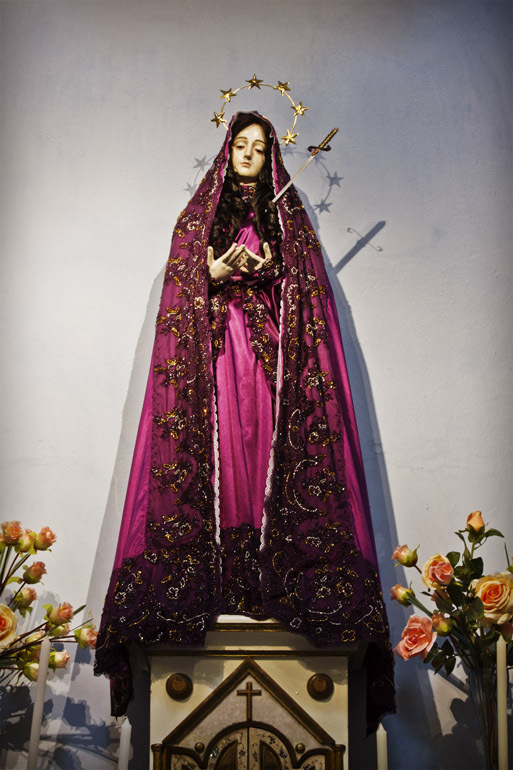 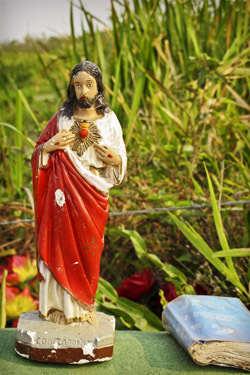 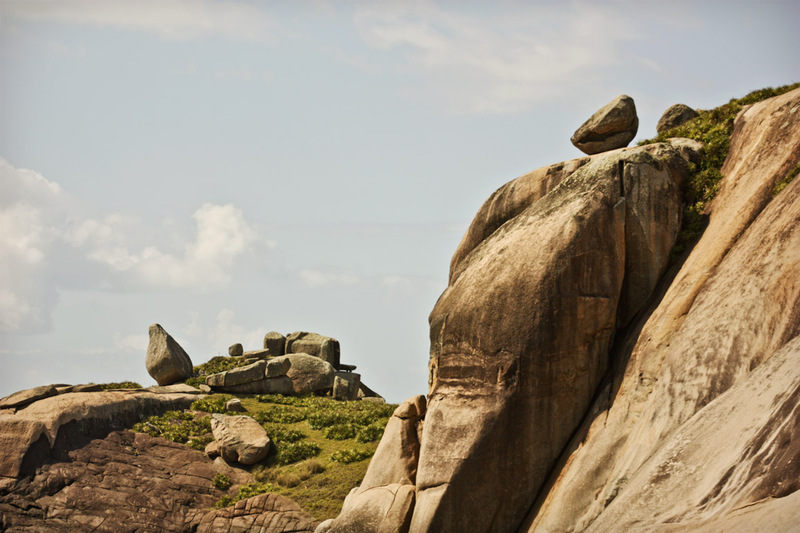 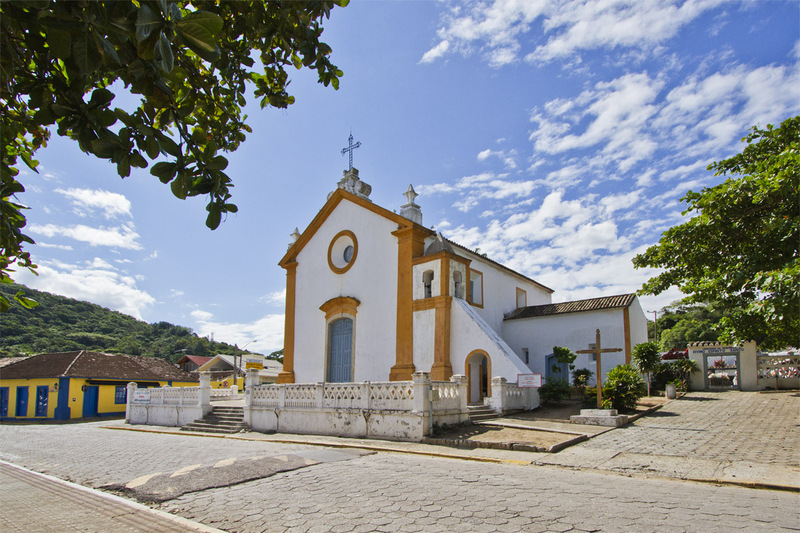 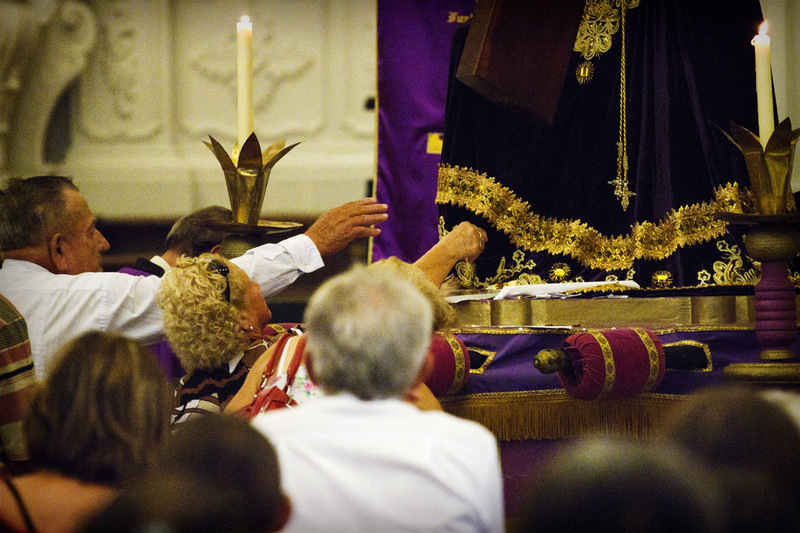 The Irmandade do Senhor Jesus Passos was founded in 1765 with the aim of practicing worship the Senhor Jesus dos Passos, and be the guardian of his image. 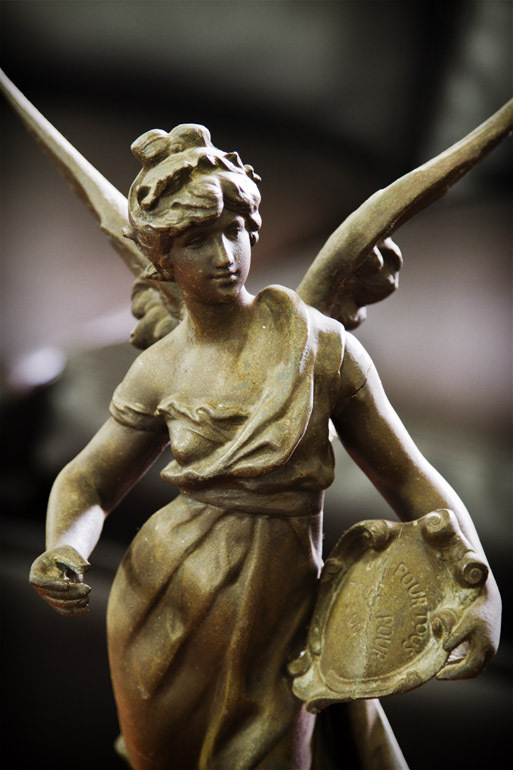 In 1782 began to provide care for sick poor and underprivileged, providing food and medical care. 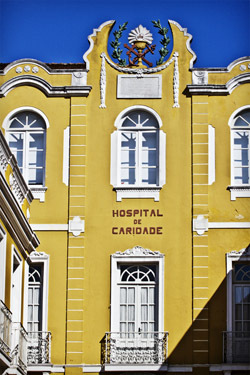 It was during this period that emerged an institution that result in a hospital (which became the Imperial Charity Hospital) with hospital medical care. Description: These stones are part of a lytic station. 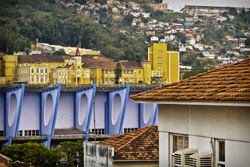 Description: Constructions at Trindade neighborhood. 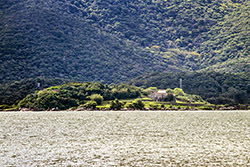 Behind it is possible to see the Cross Hill with various communication antennas. 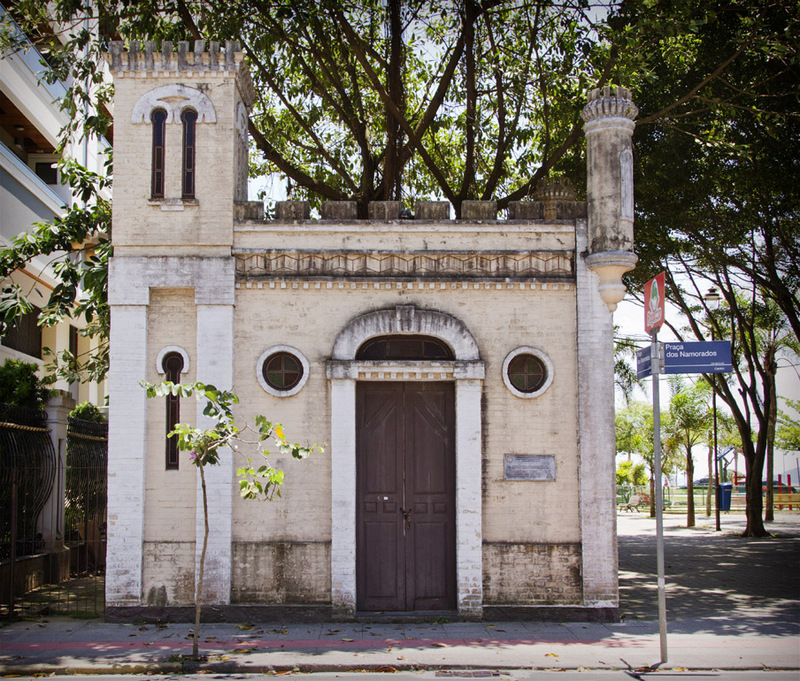 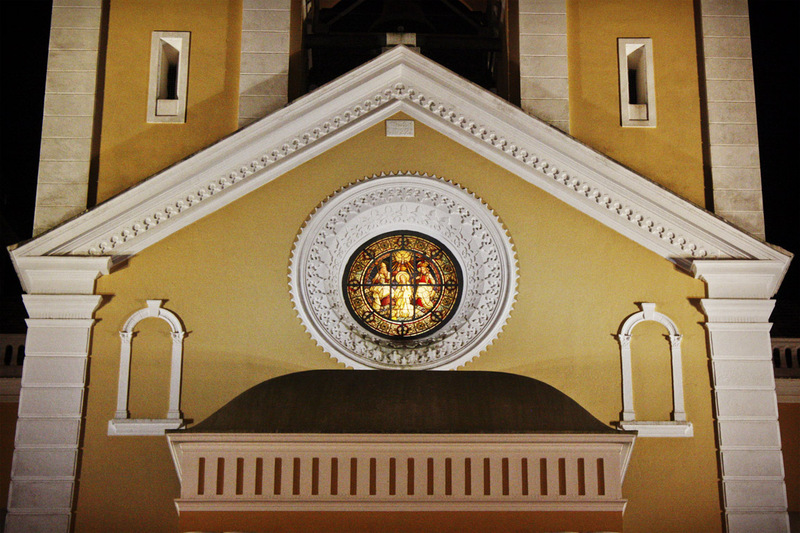 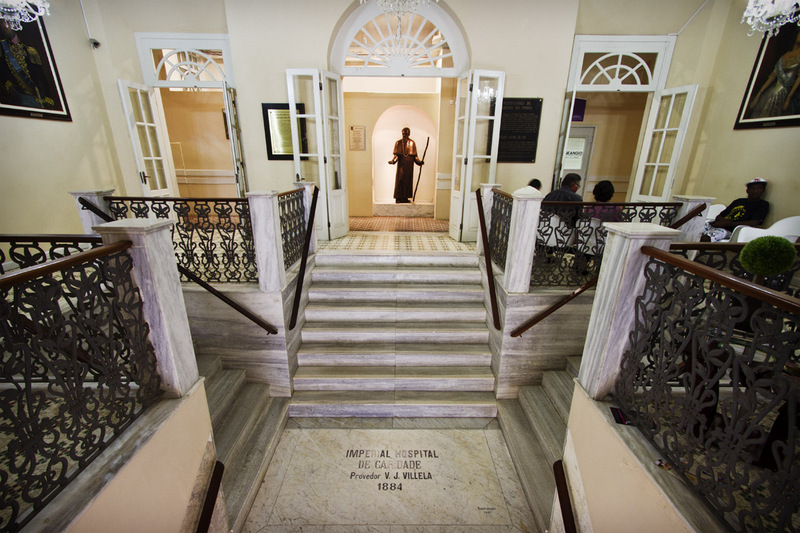 Description: The Nosso Senhor Jesus Passos Chapel is part of the Imperial Charity Hospital. 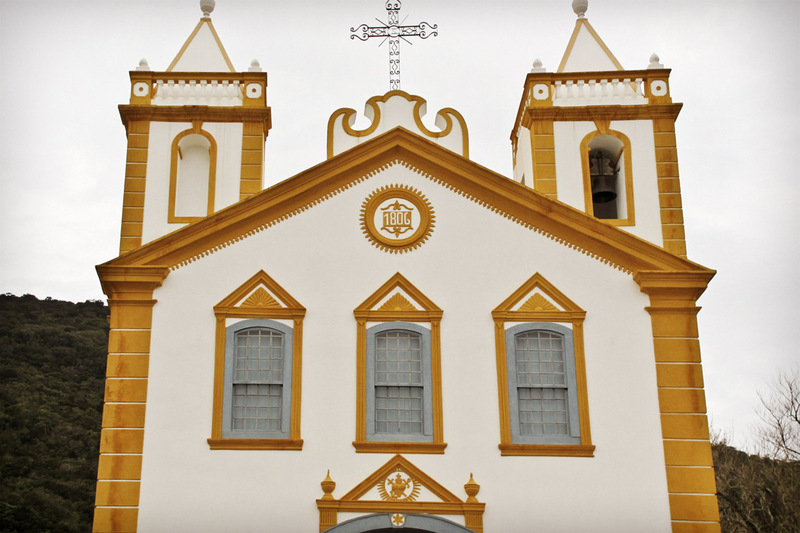 The Irmandade do Senhor Jesus Passos was founded in 1765 with the aim of practicing worship the Senhor Jesus dos Passos, and be the guardian of his image. 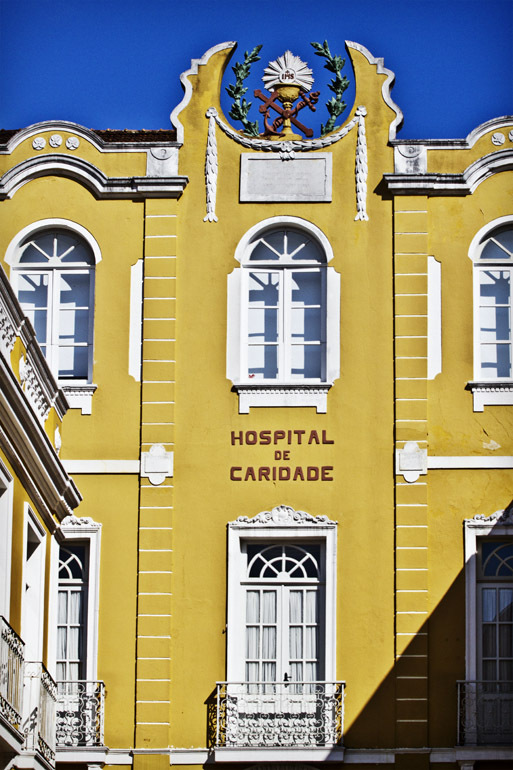 In 1782 began to provide care for sick poor and underprivileged, providing food and medical care. 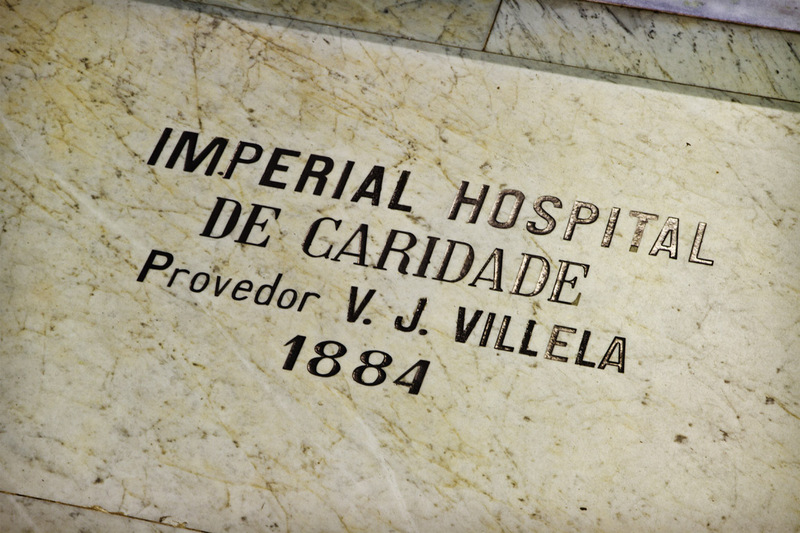 It was during this period that emerged an institution that result in a hospital (which became the Imperial Charity Hospital) with hospital medical care. Description: This house was built by slaves around the year 1780. 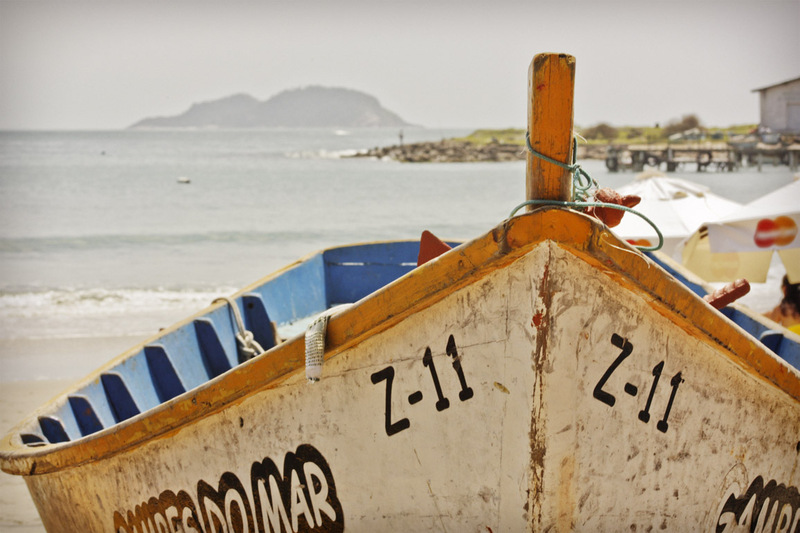 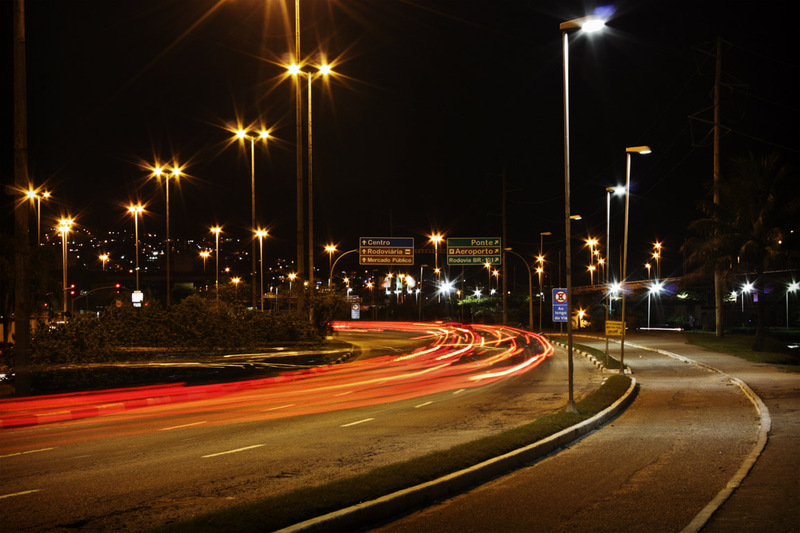 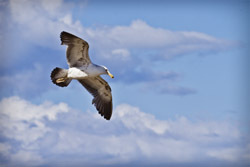 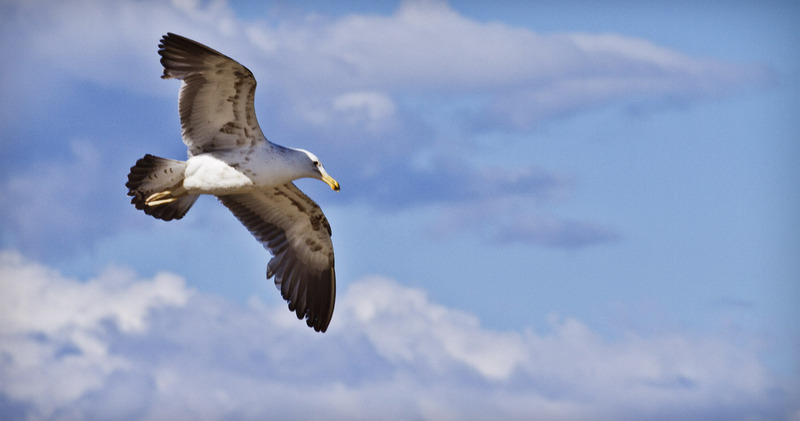 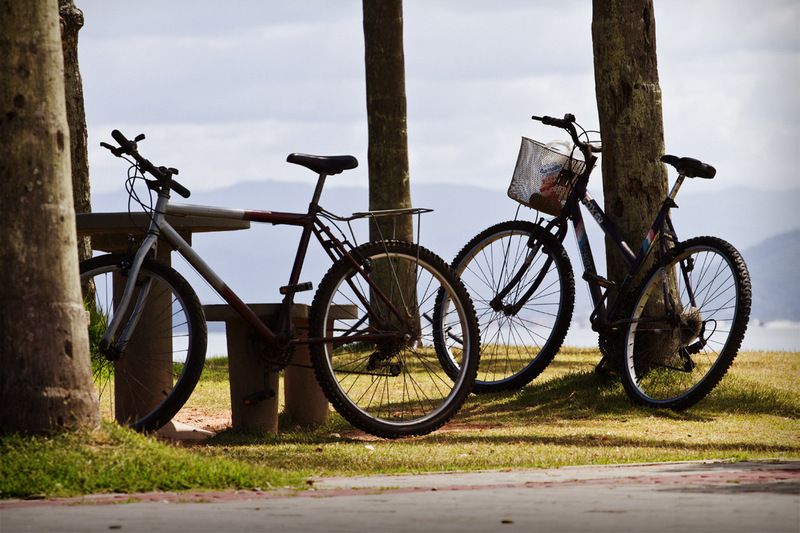 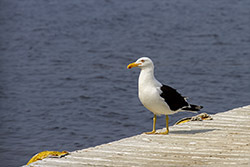 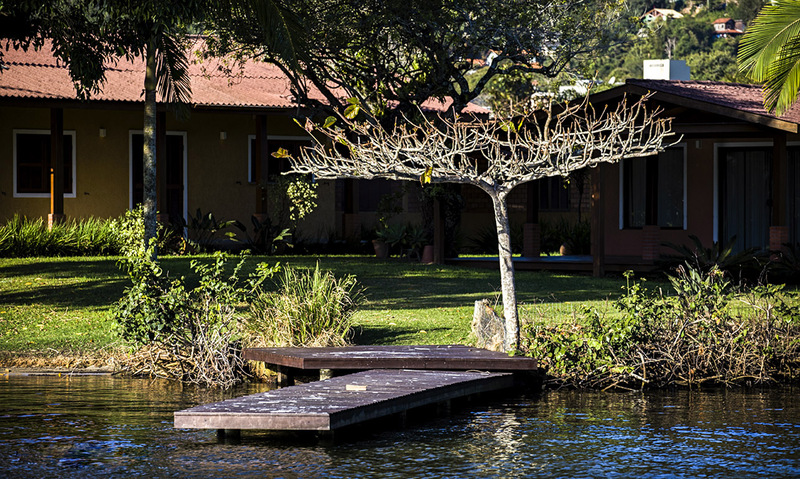 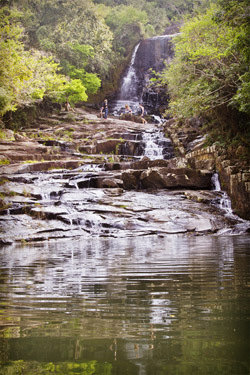 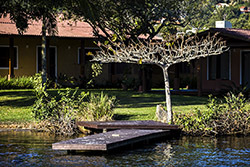 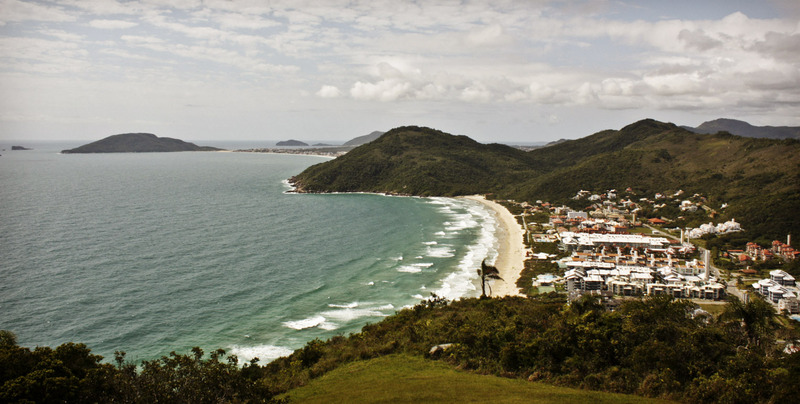 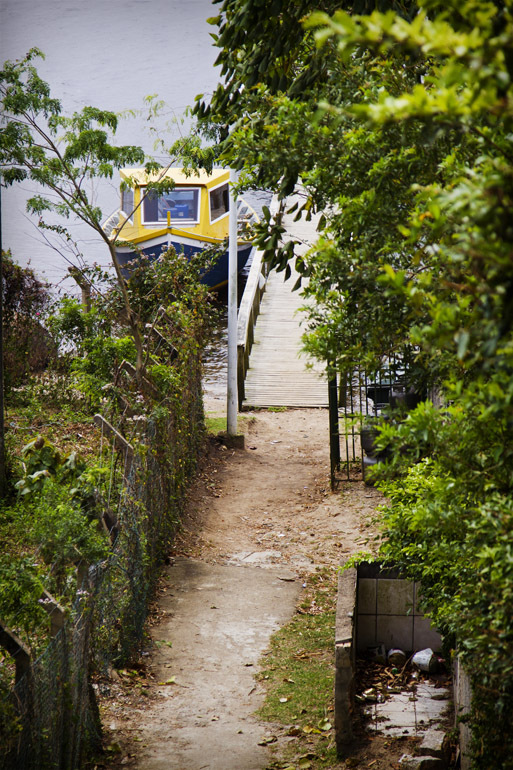 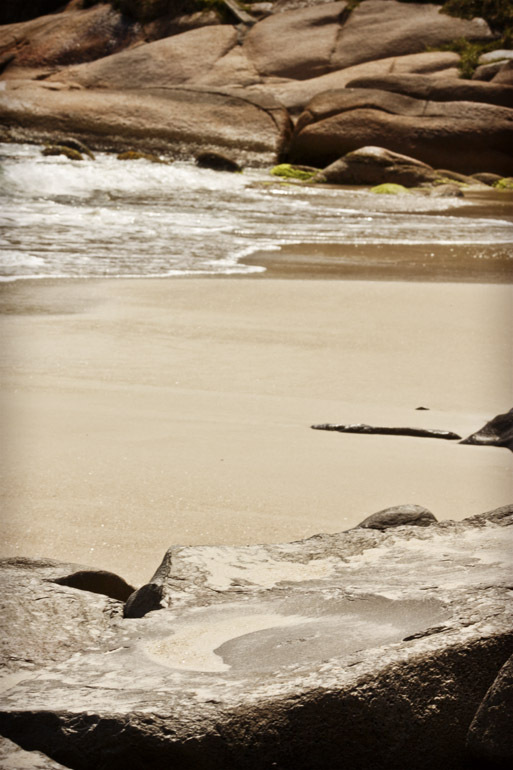 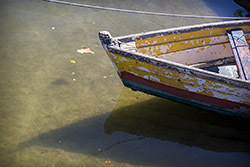 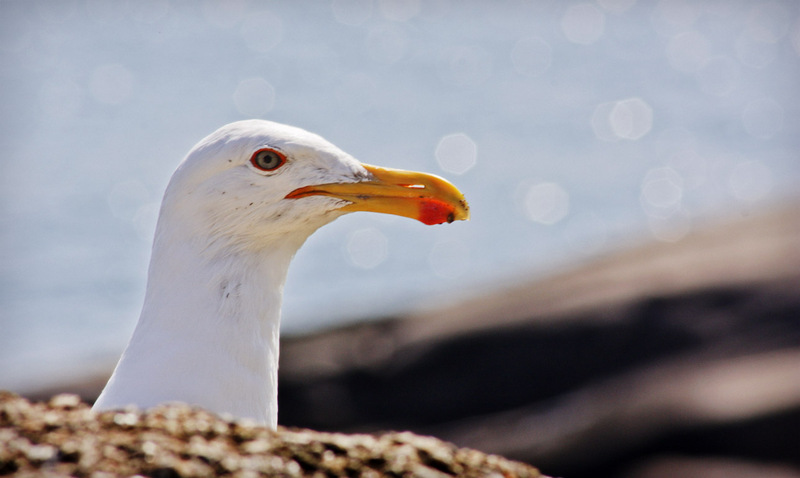 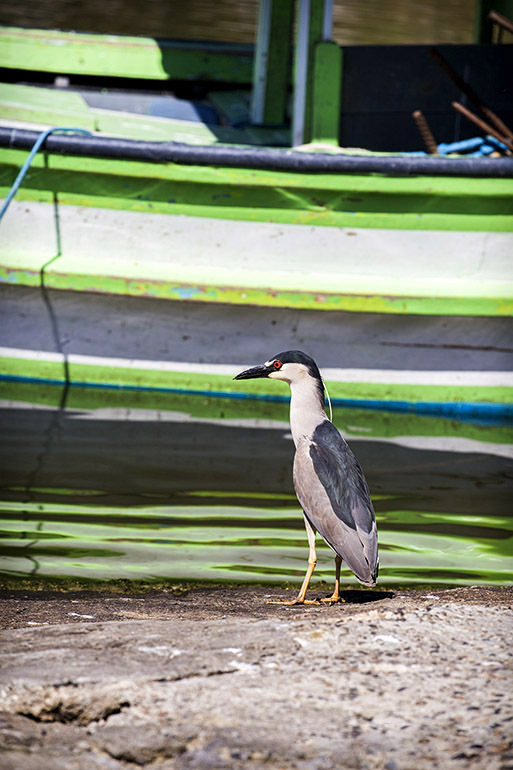 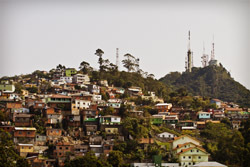 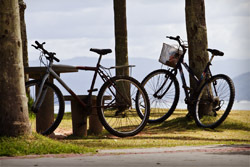 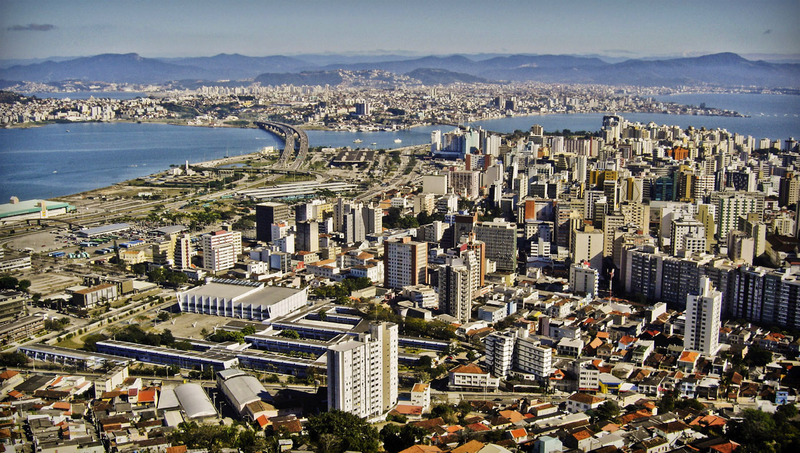 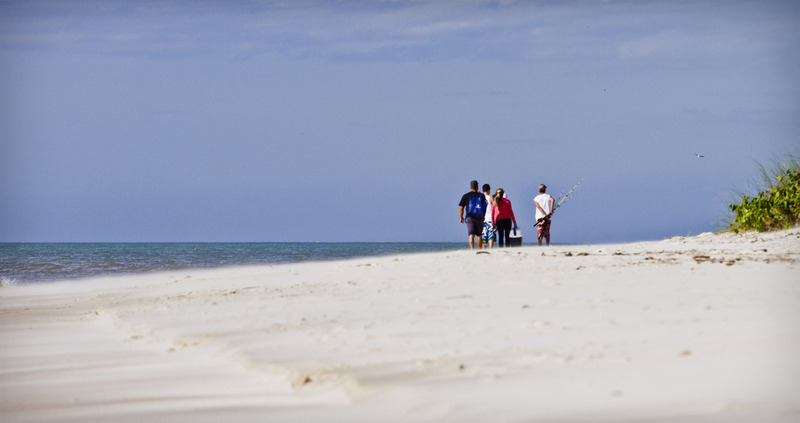 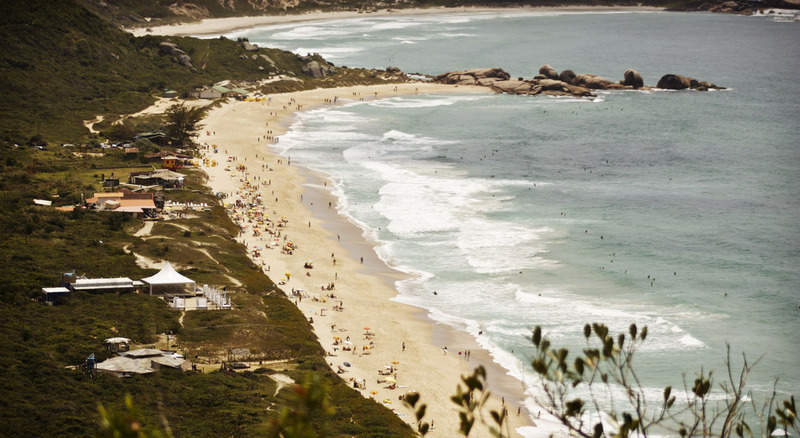 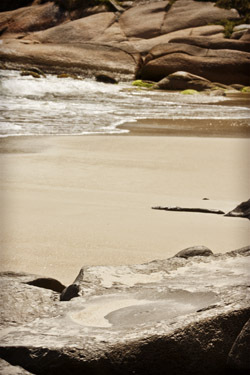 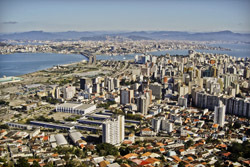 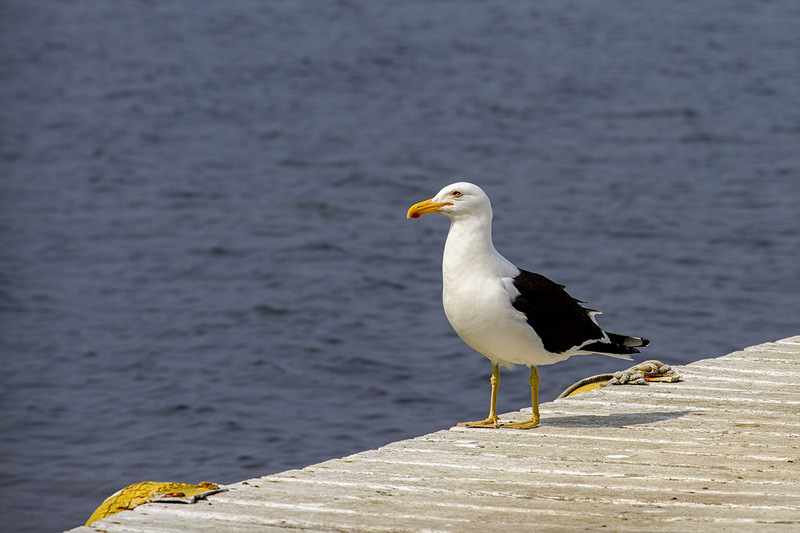 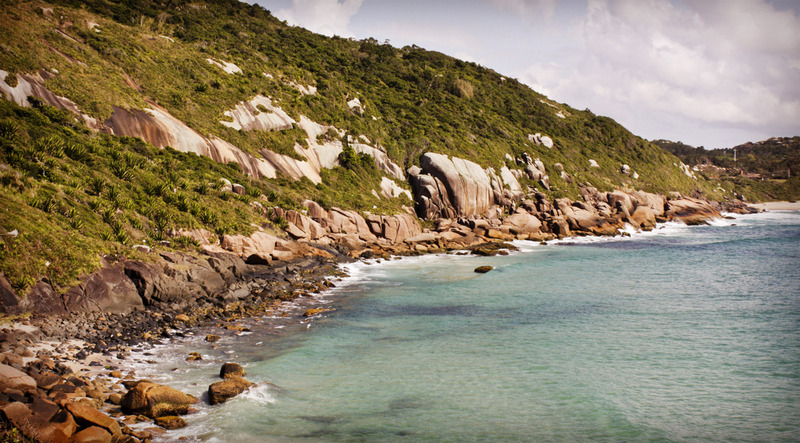 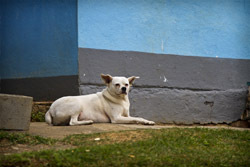 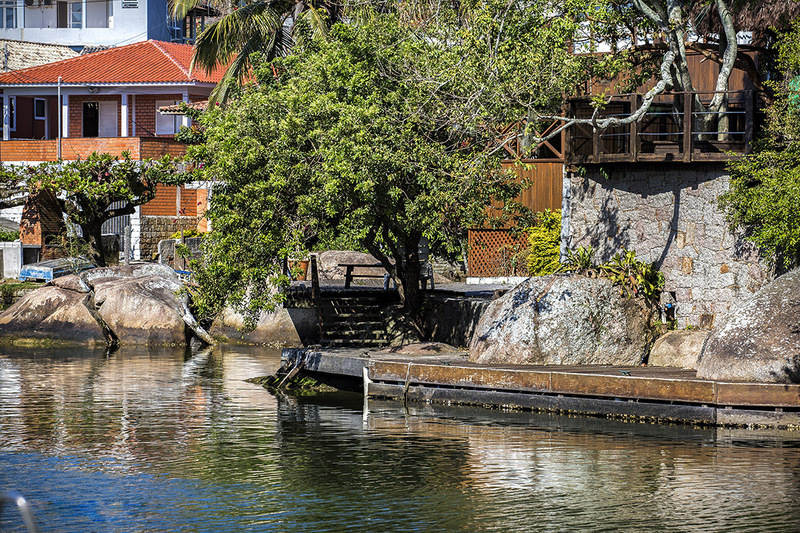 It is located at Costa da Lagoa neighborhood. 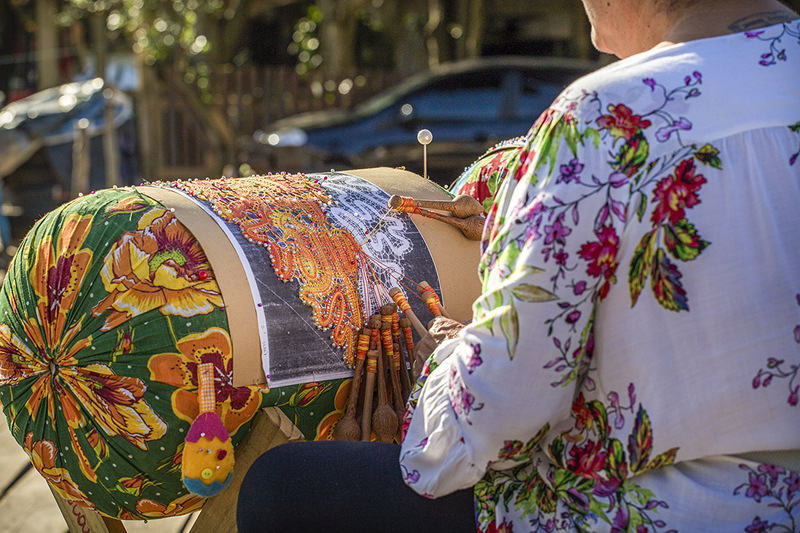 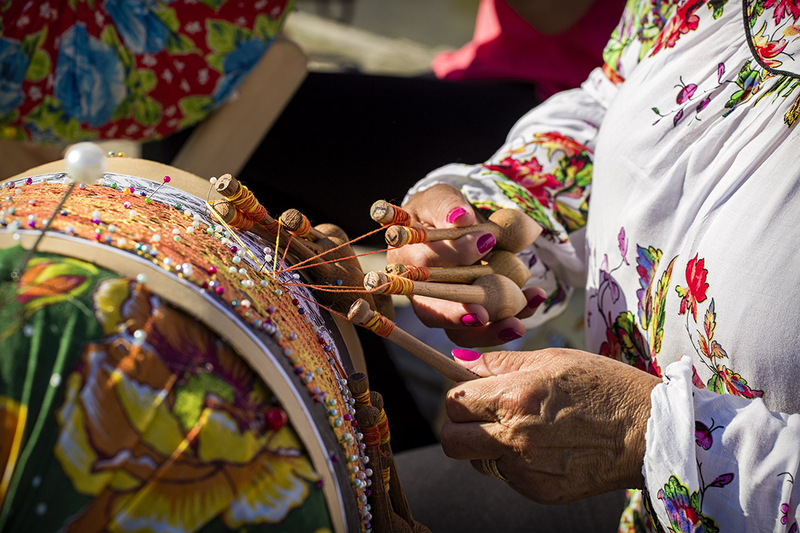 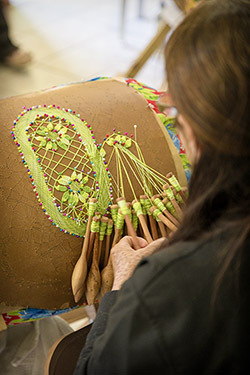 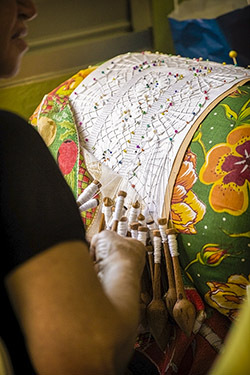 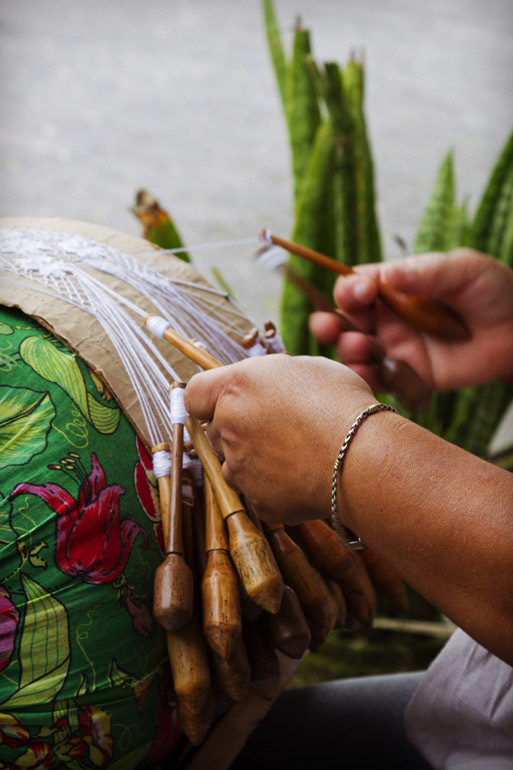 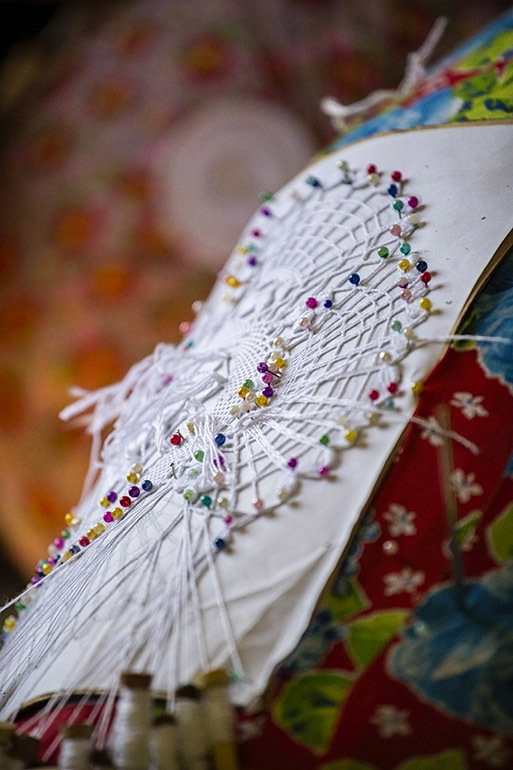 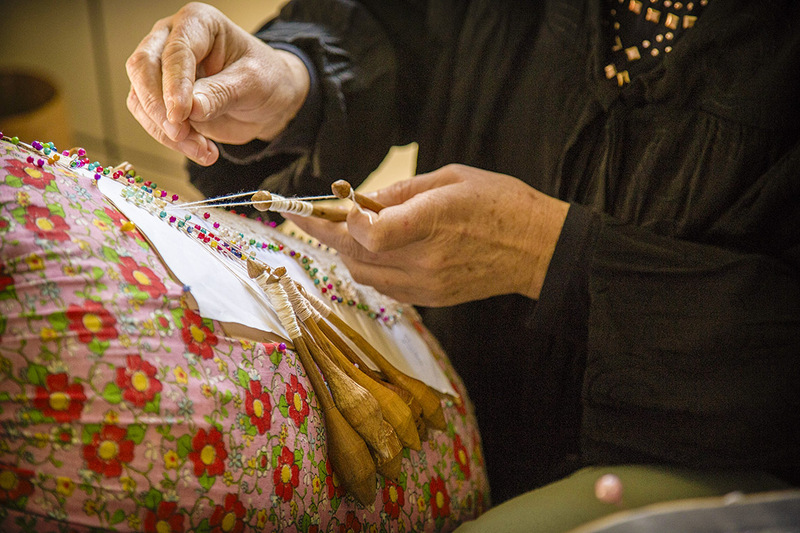 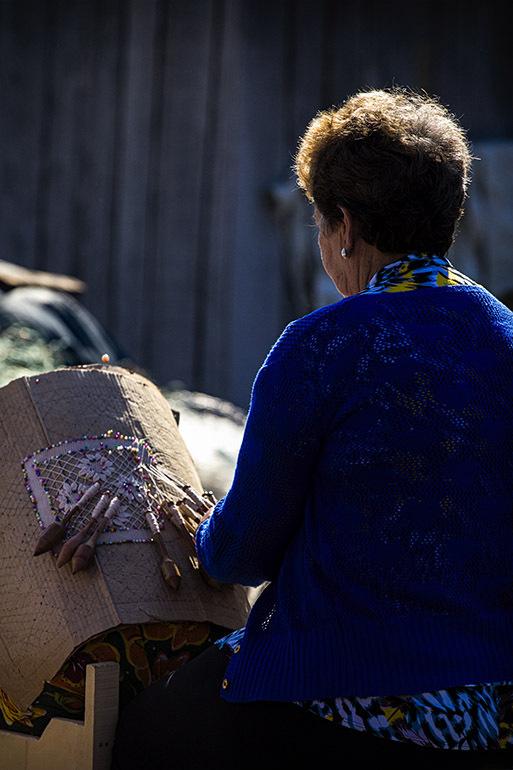 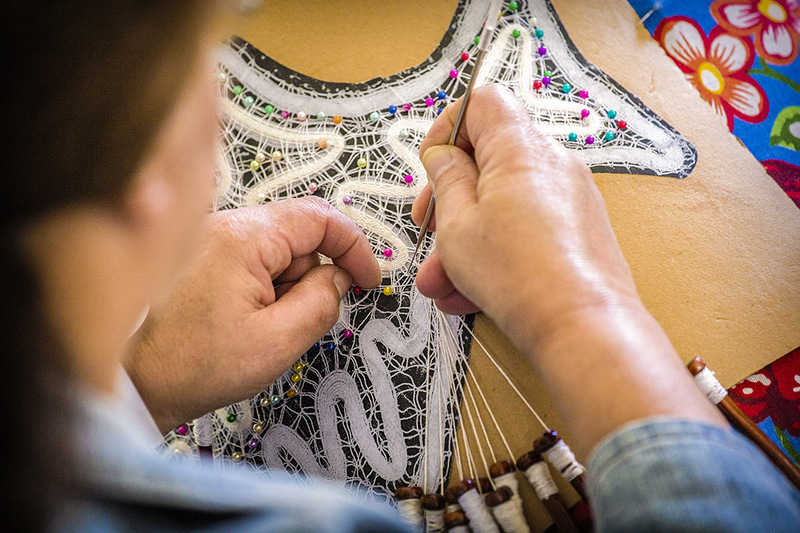 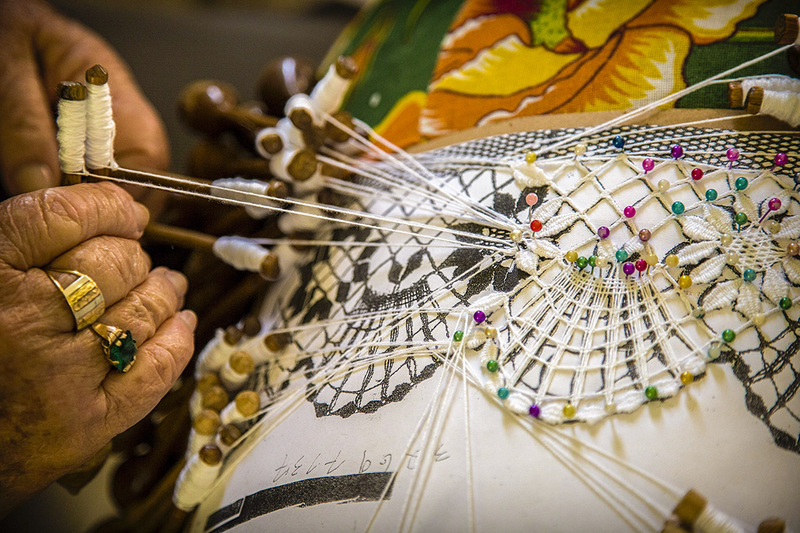 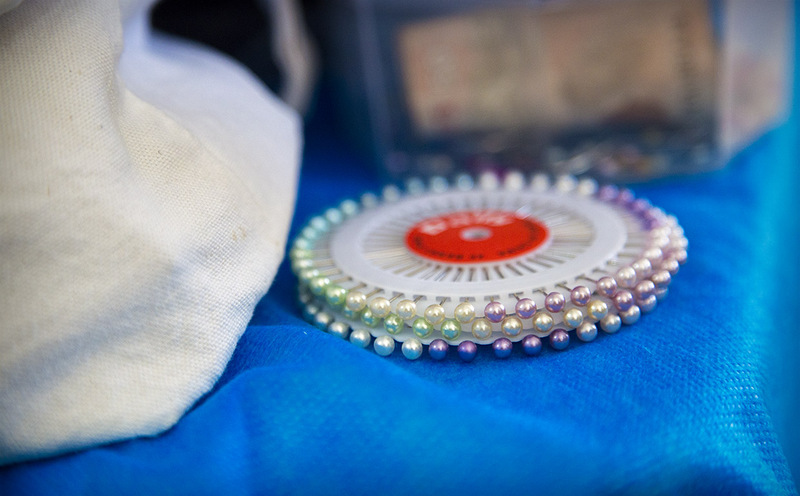 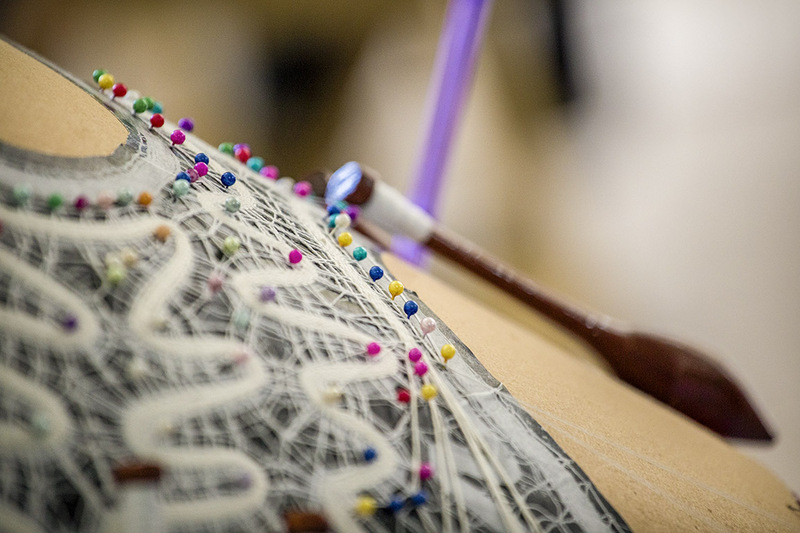 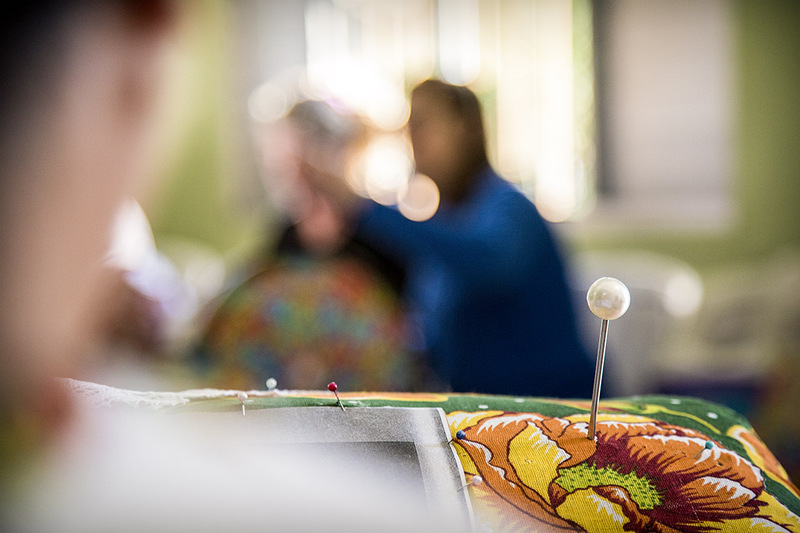 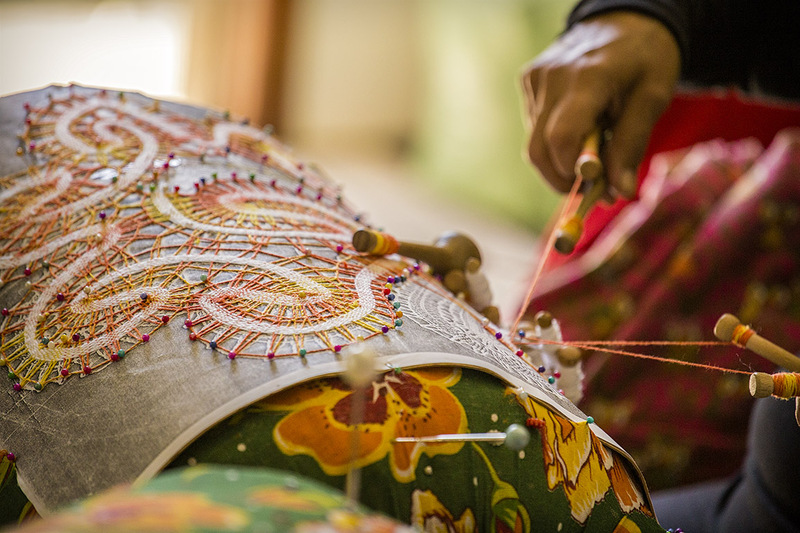 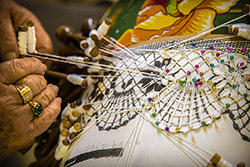 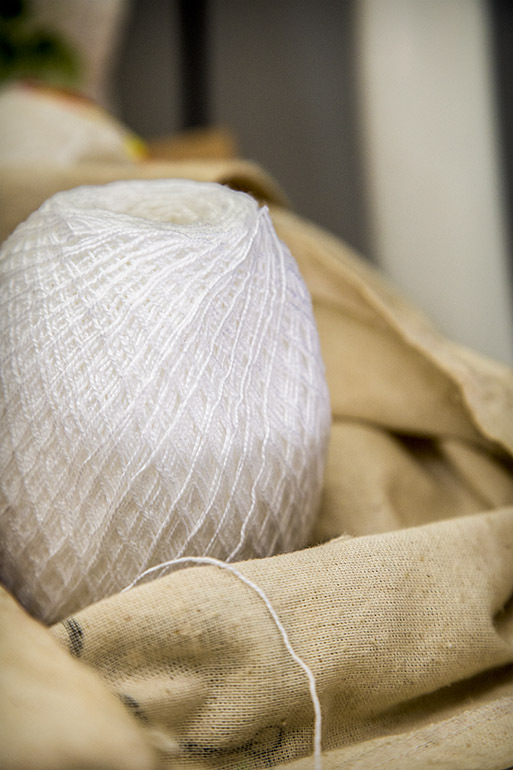 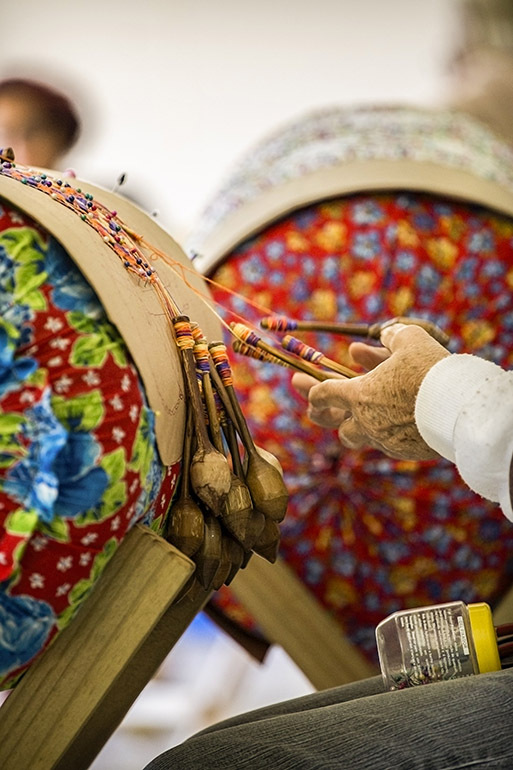 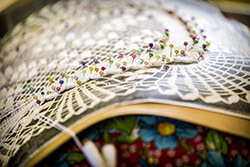 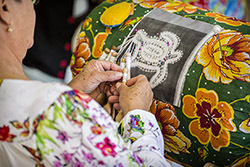 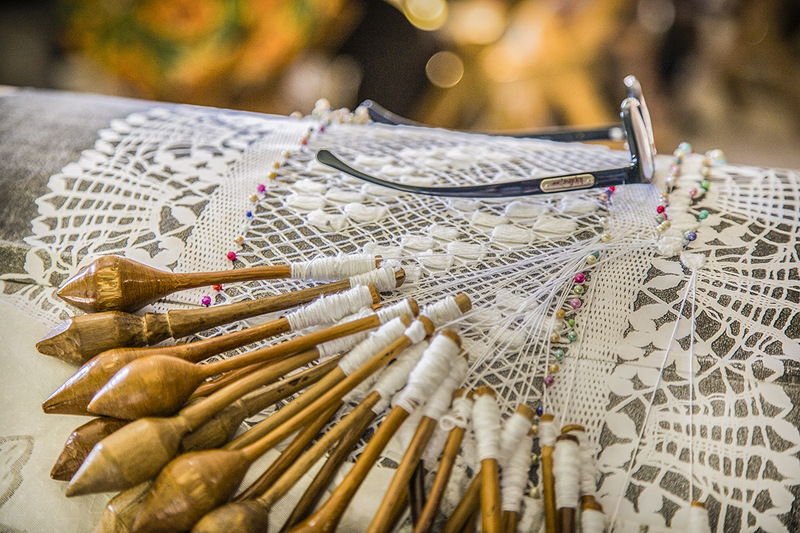 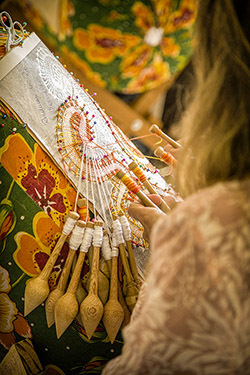 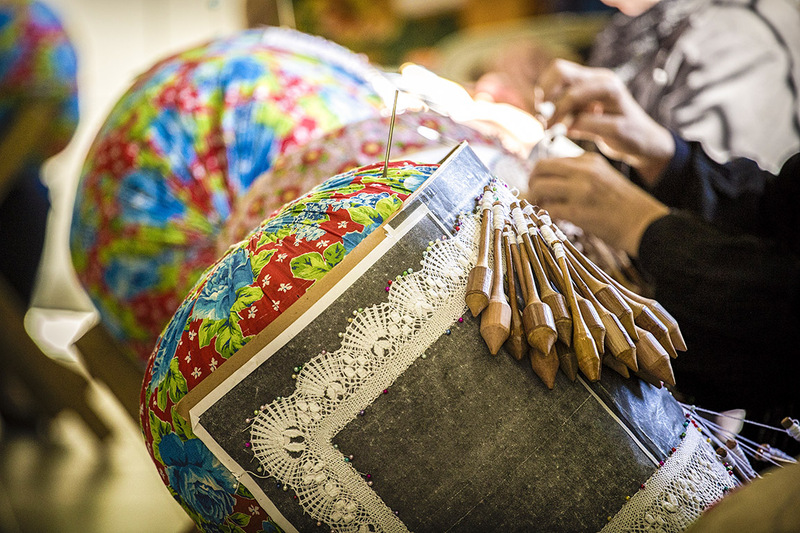 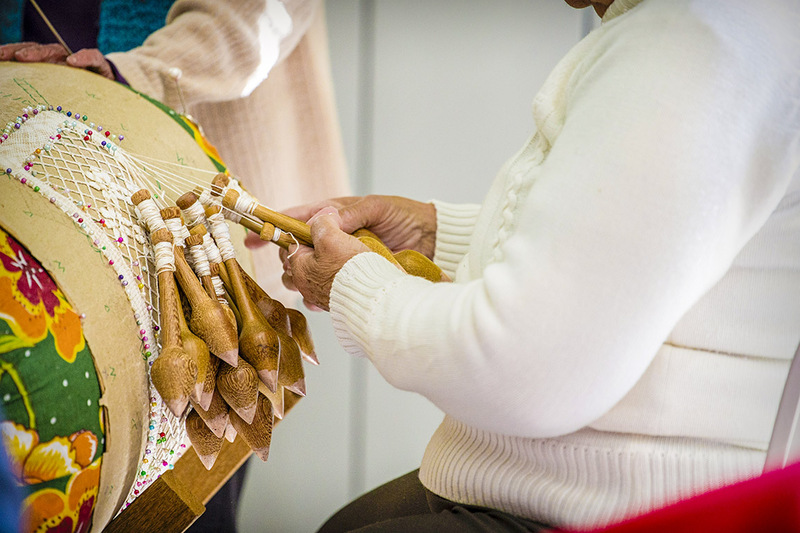 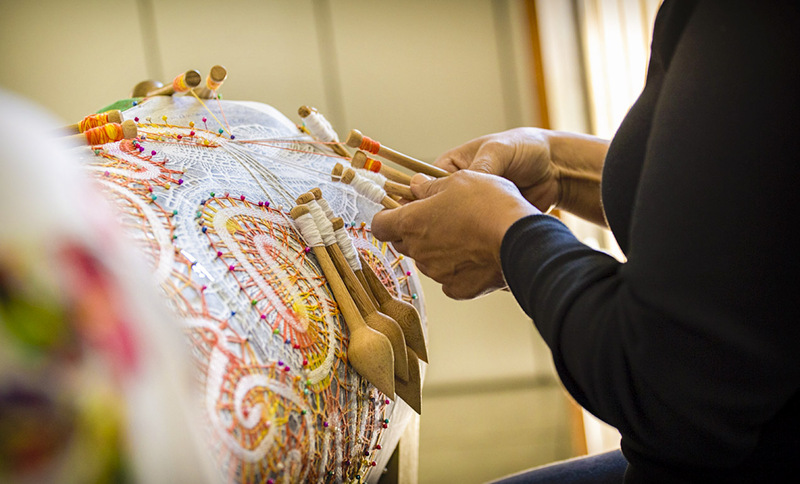 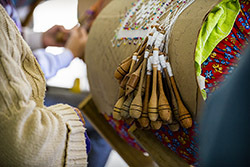 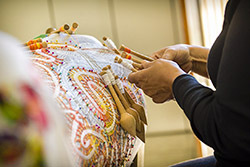 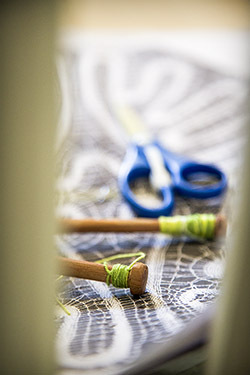 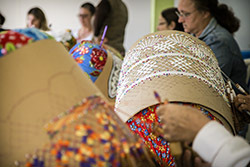 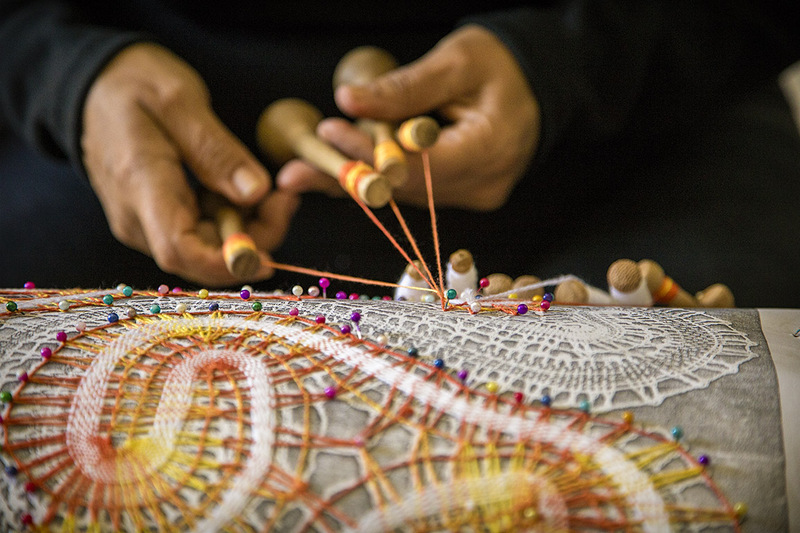 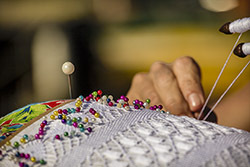 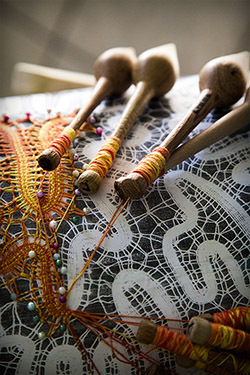 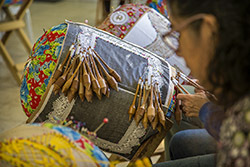 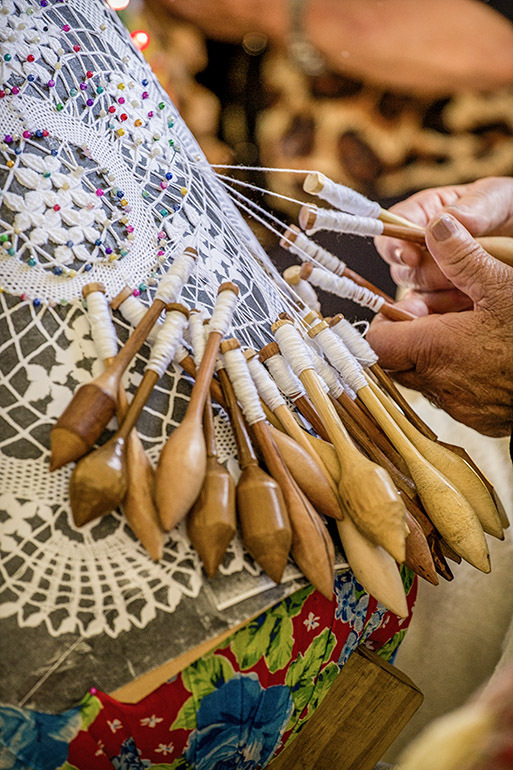 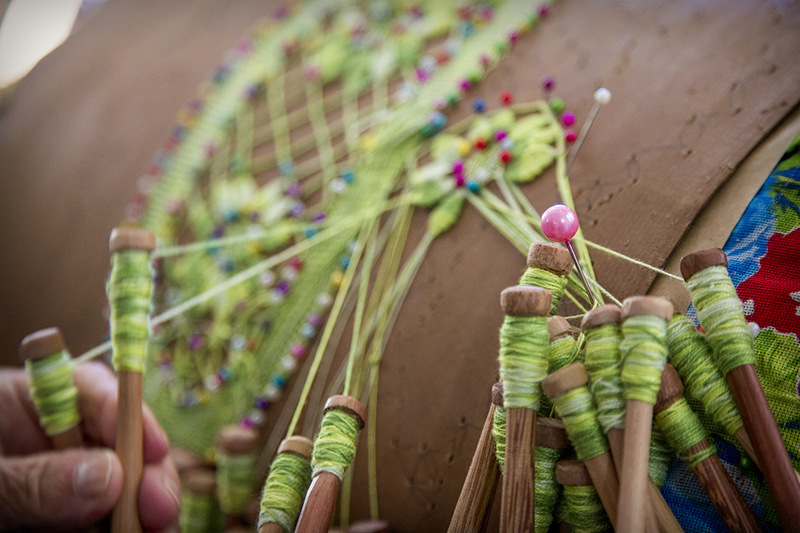 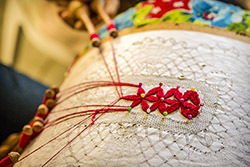 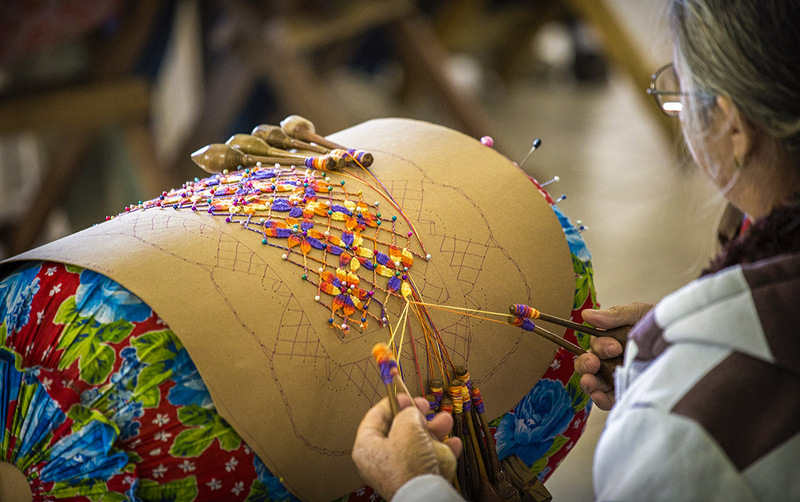 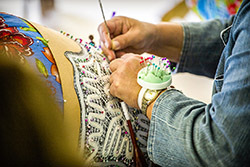 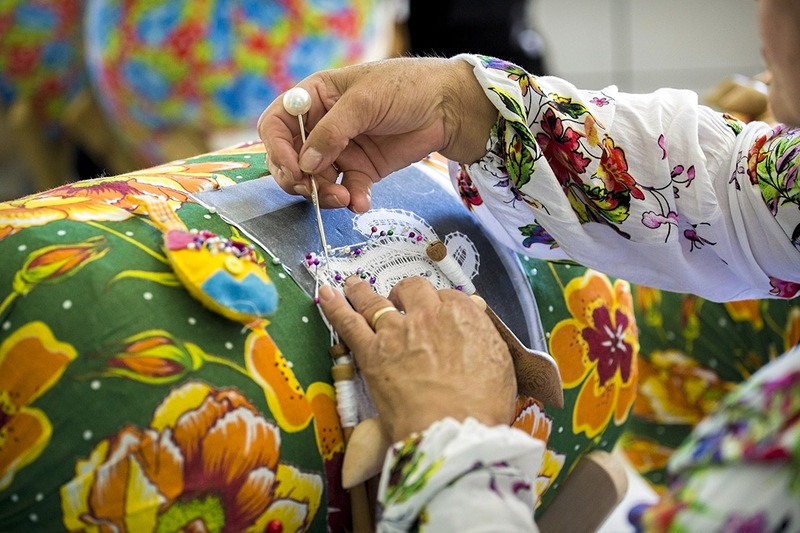 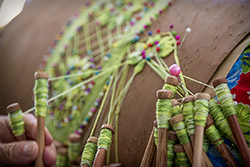 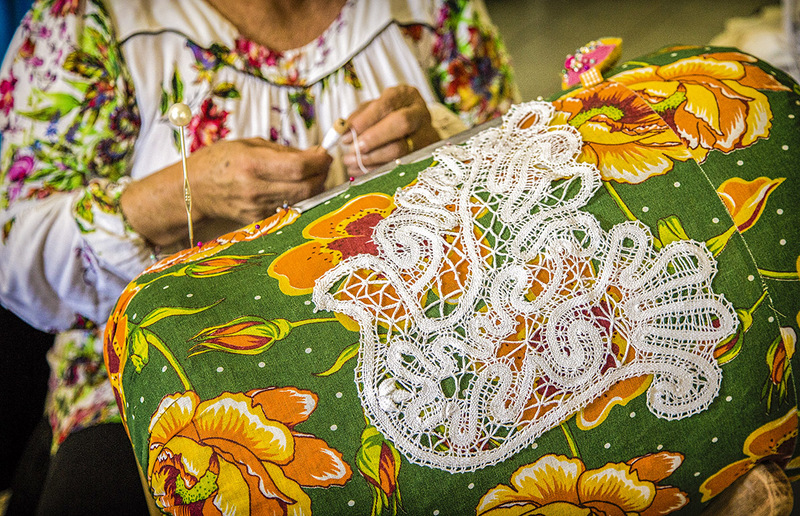 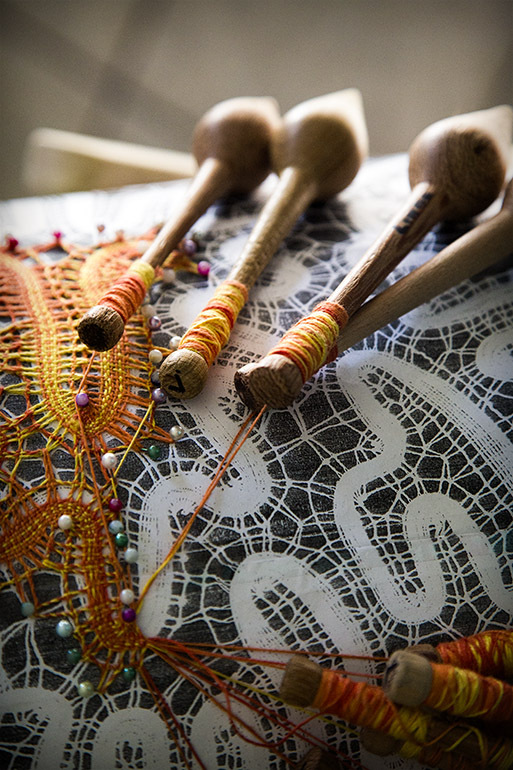 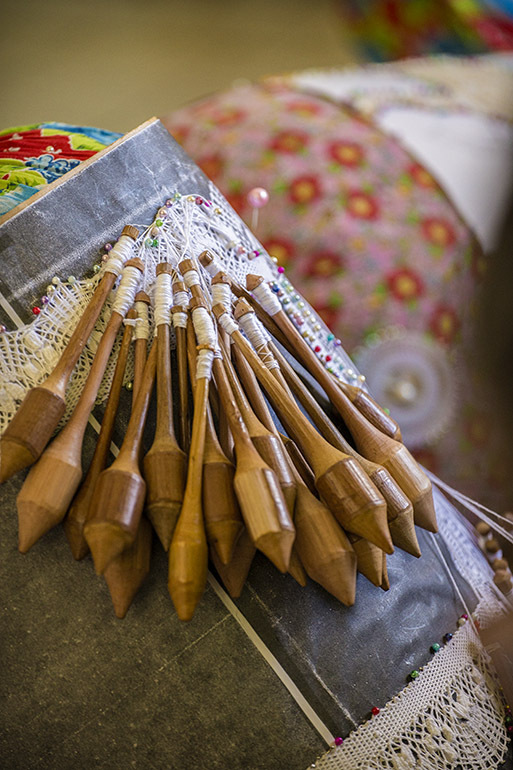 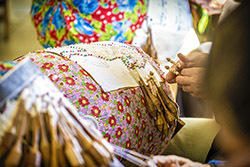 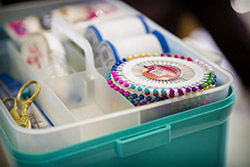 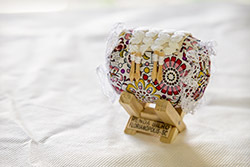 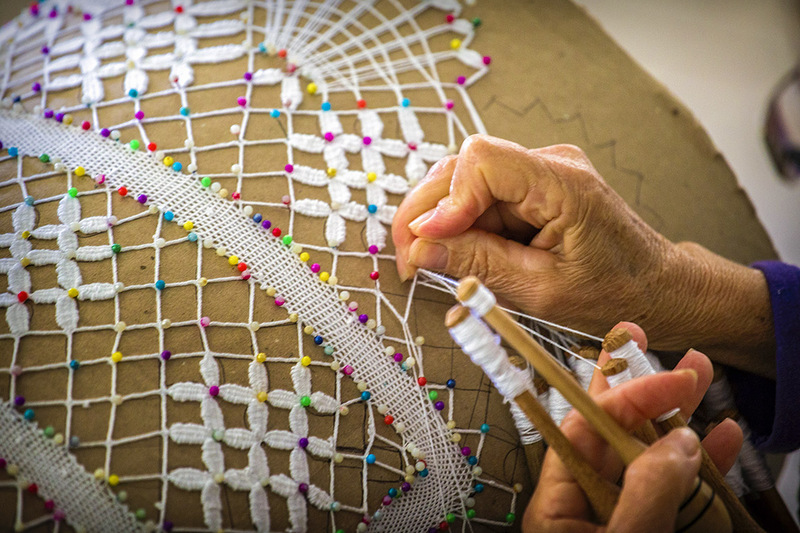 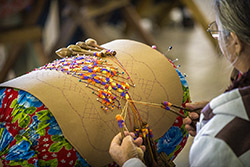 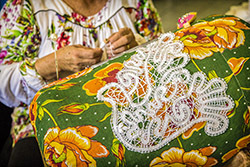 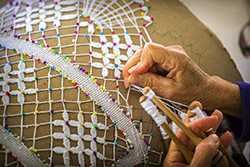 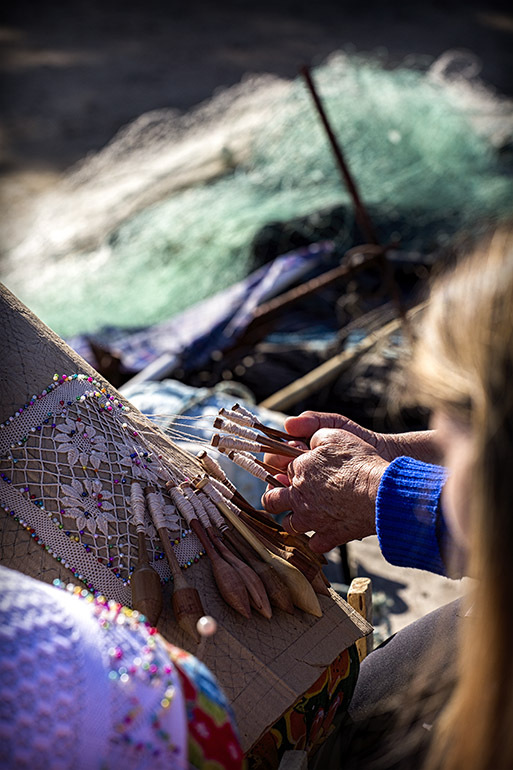 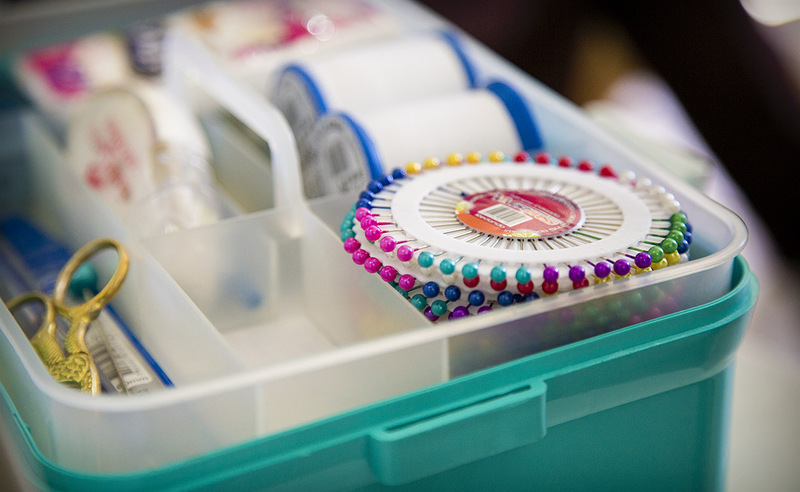 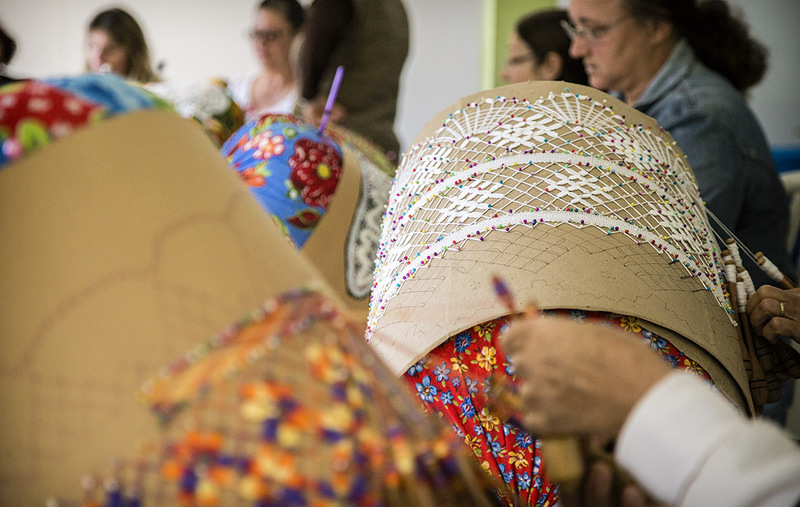 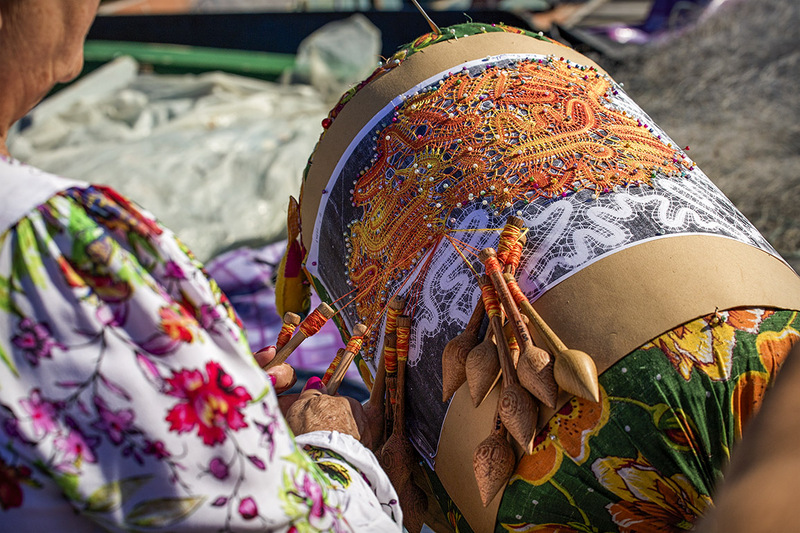 Description: In this photograph Mrs. Fernanda Gonçalves Martins weaving bobbin lace. 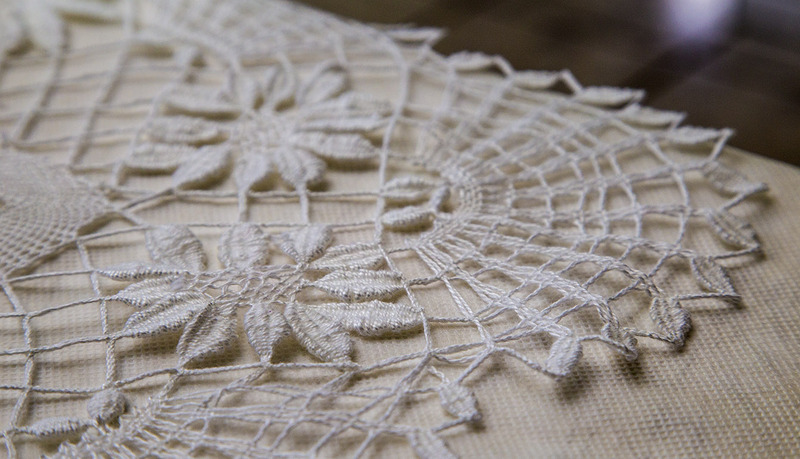 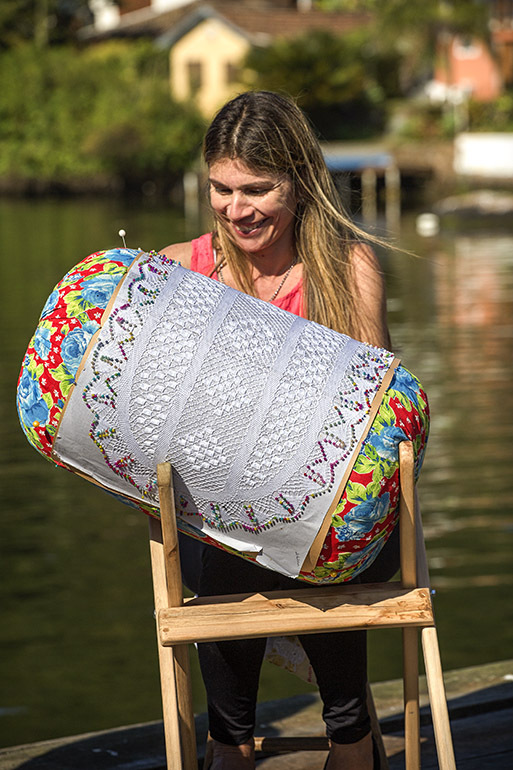 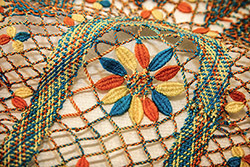 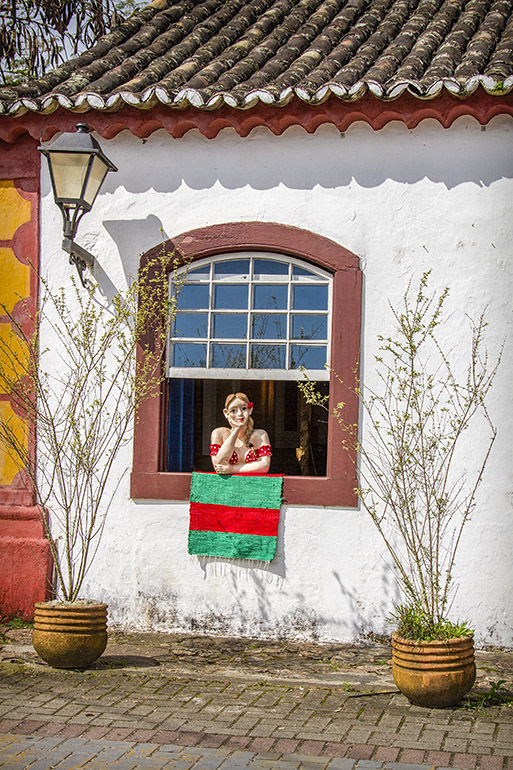 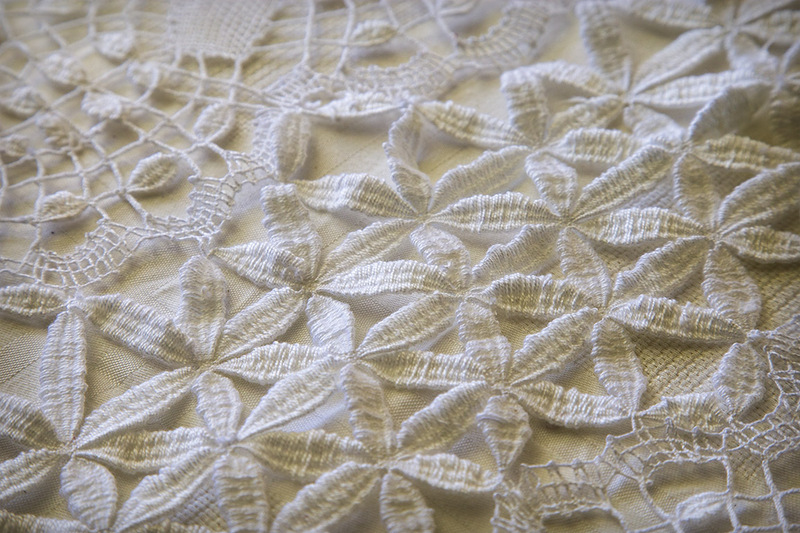 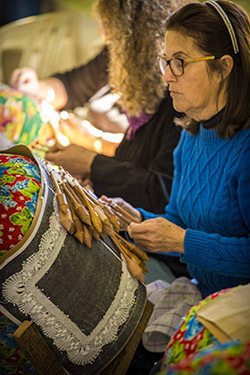 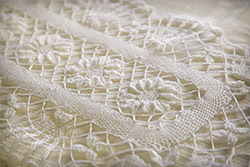 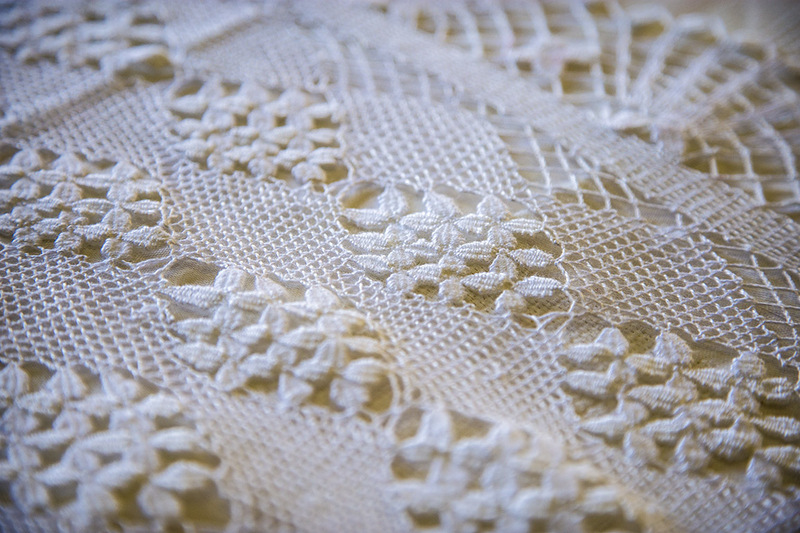 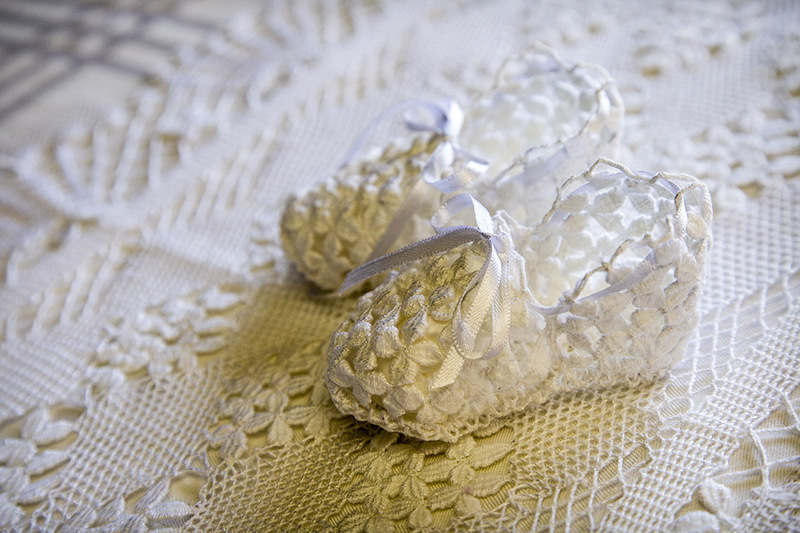 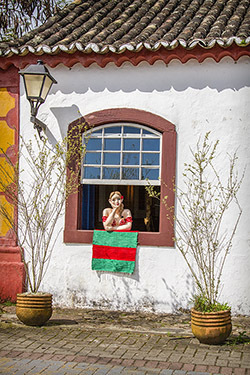 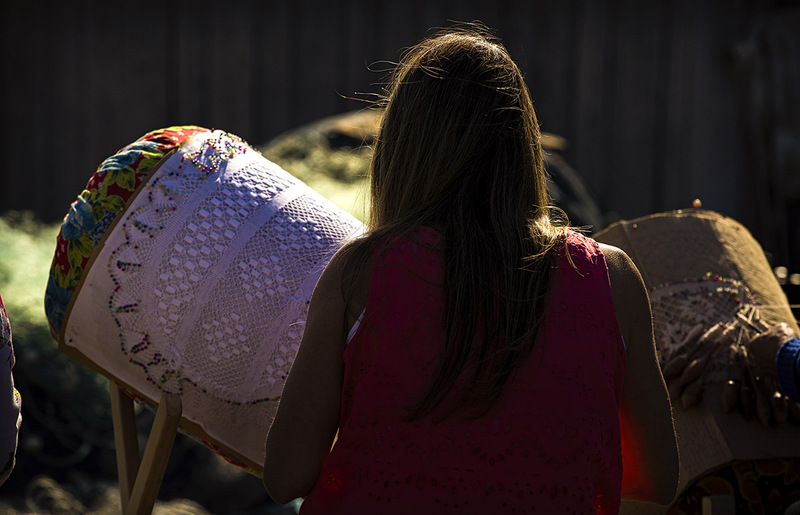 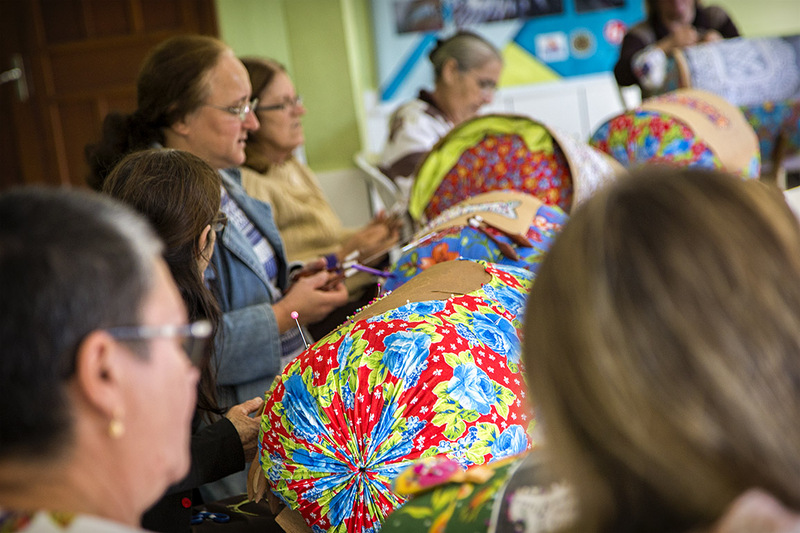 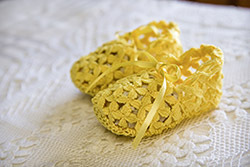 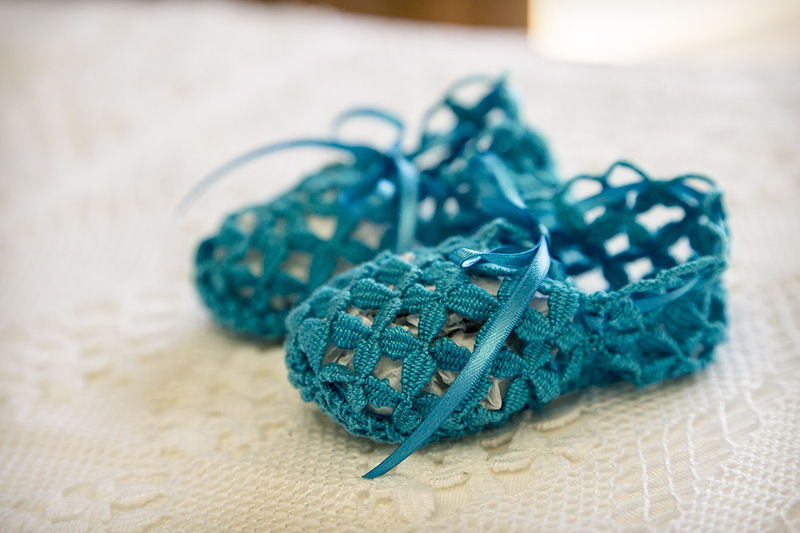 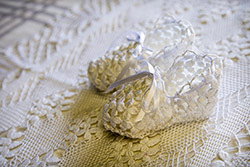 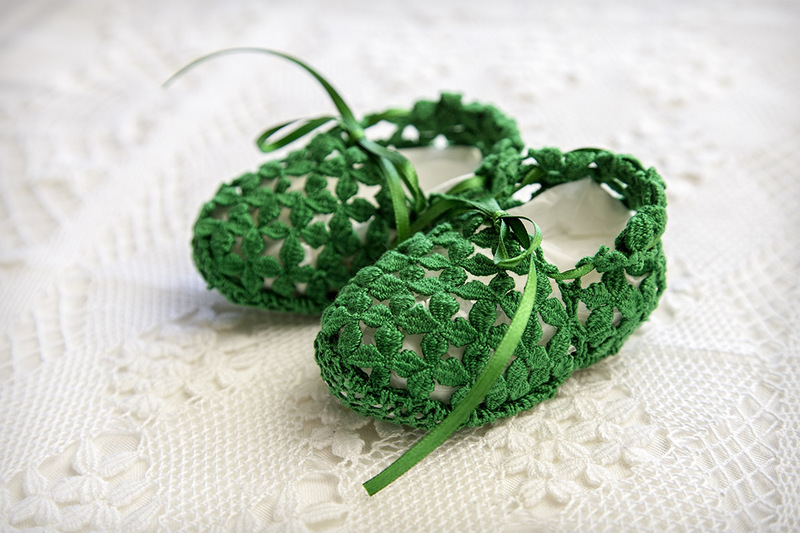 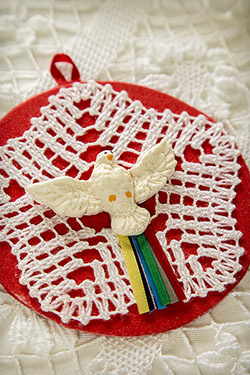 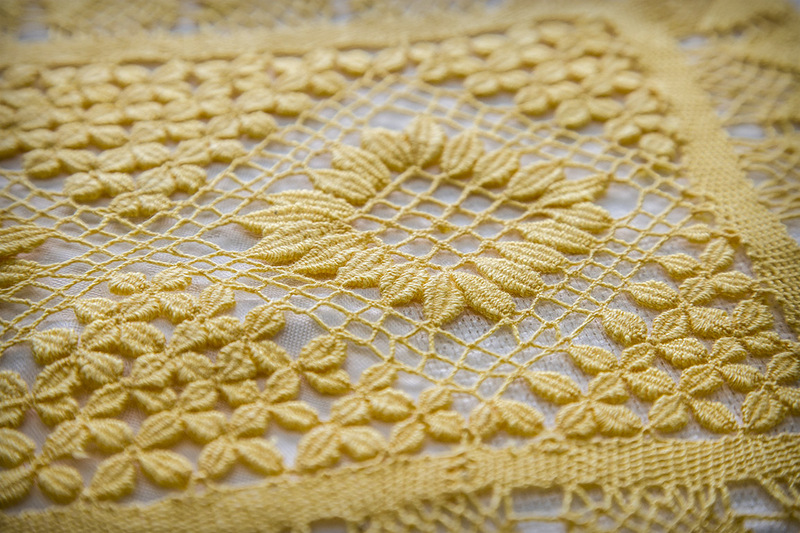 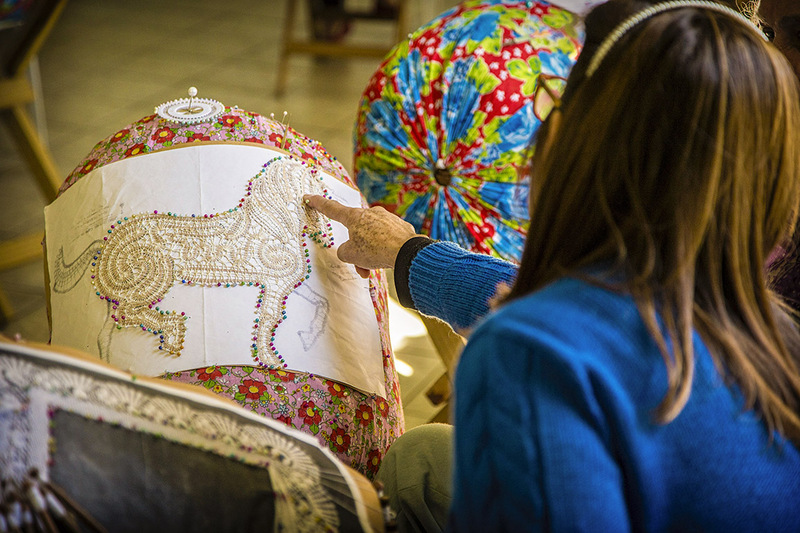 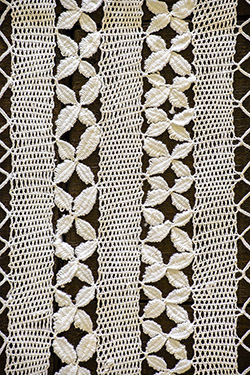 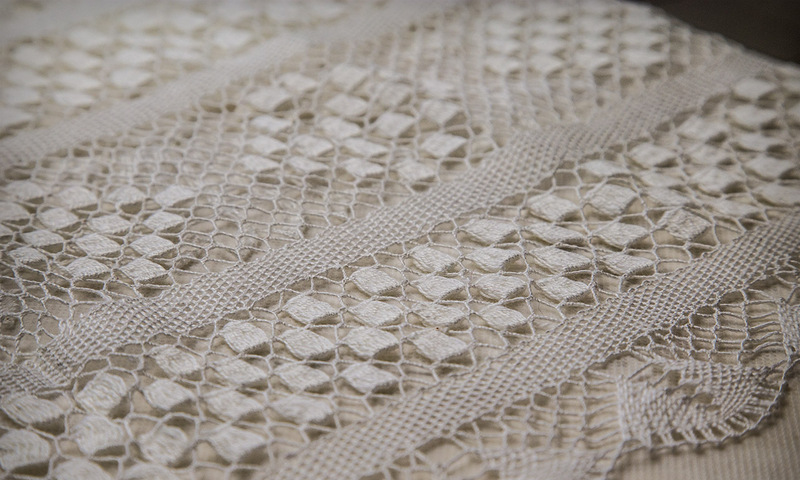 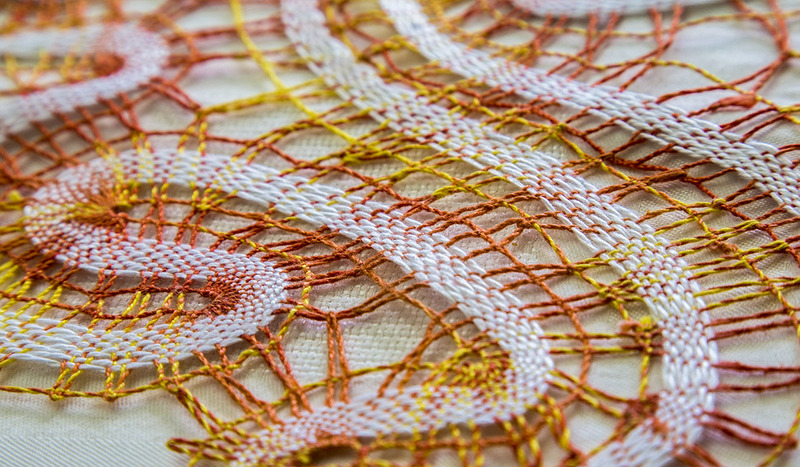 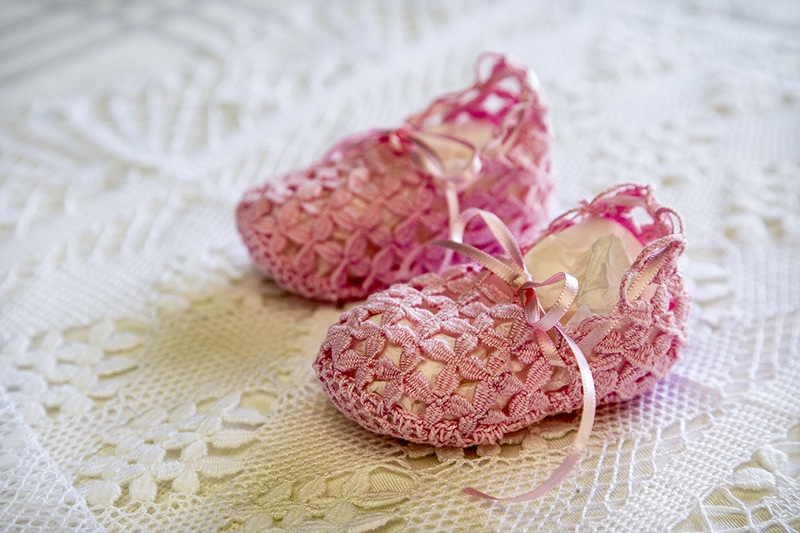 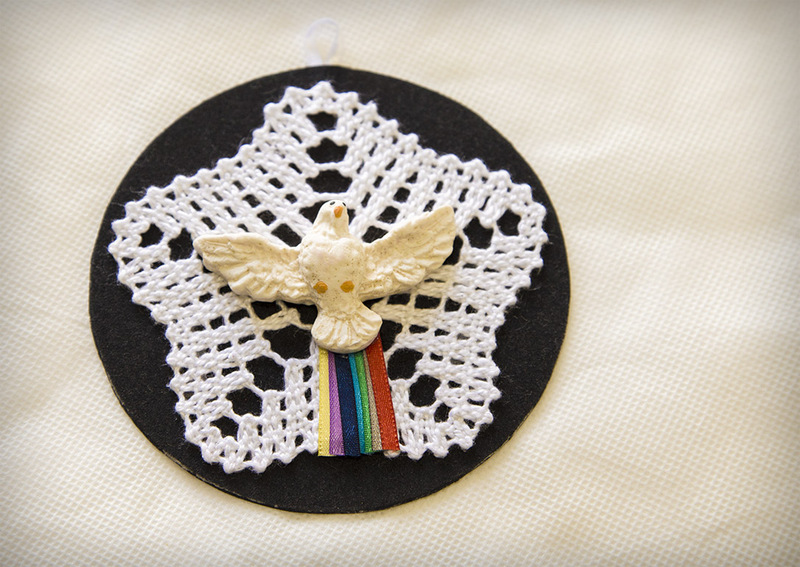 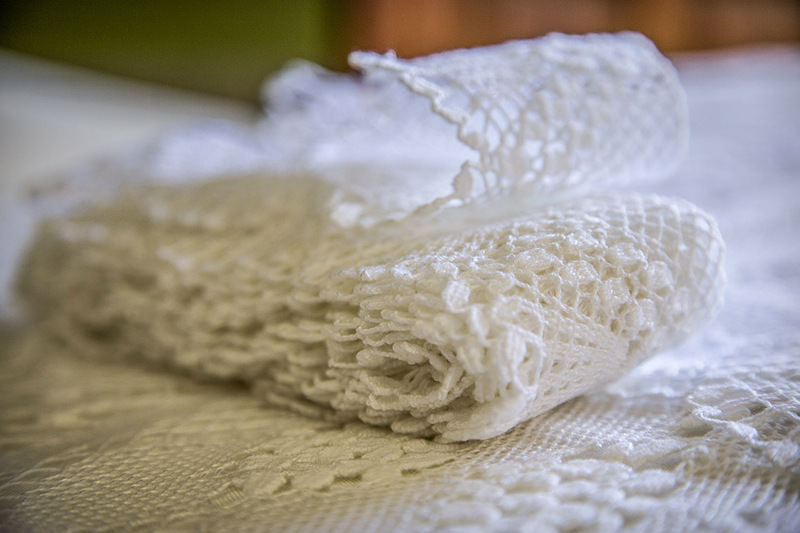 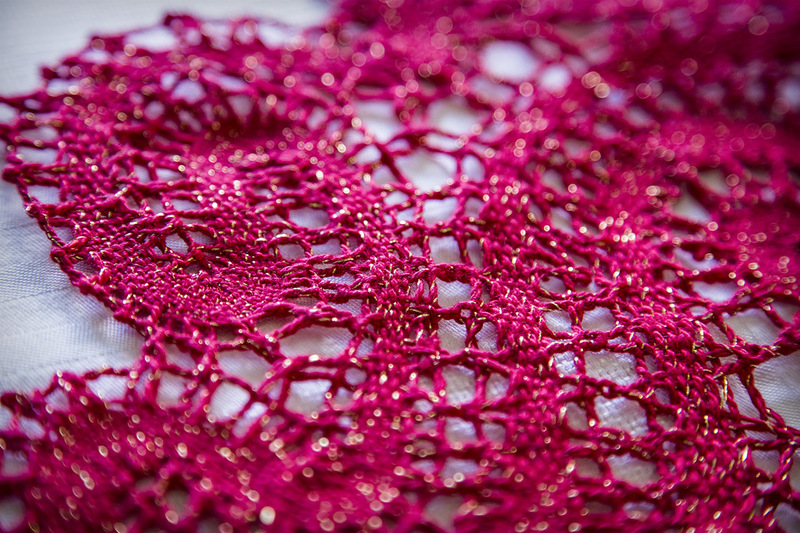 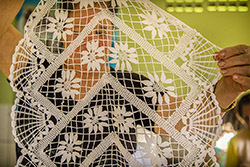 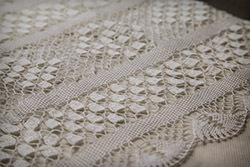 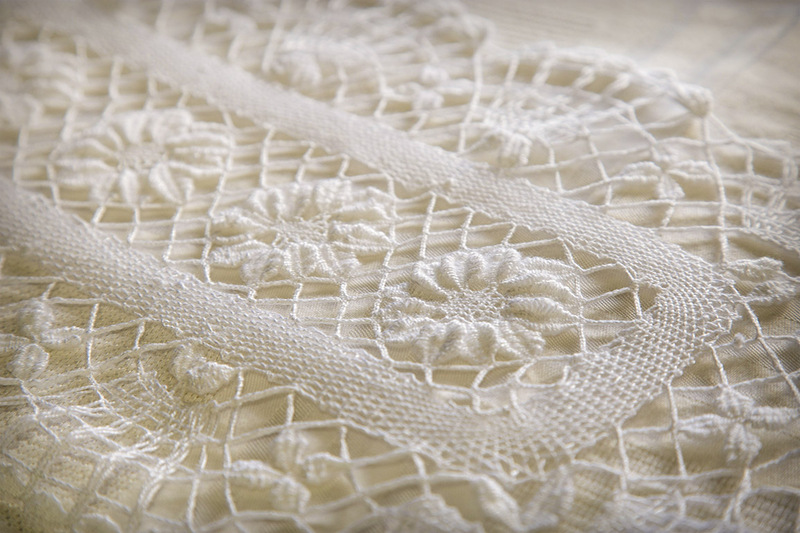 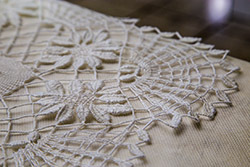 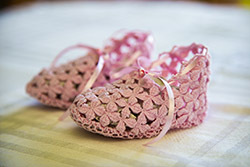 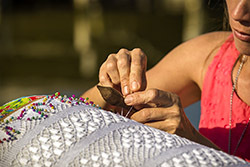 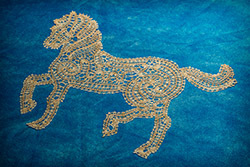 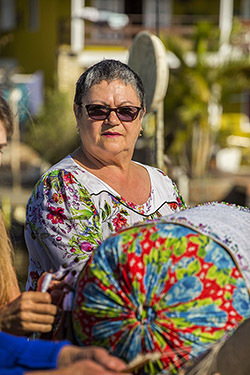 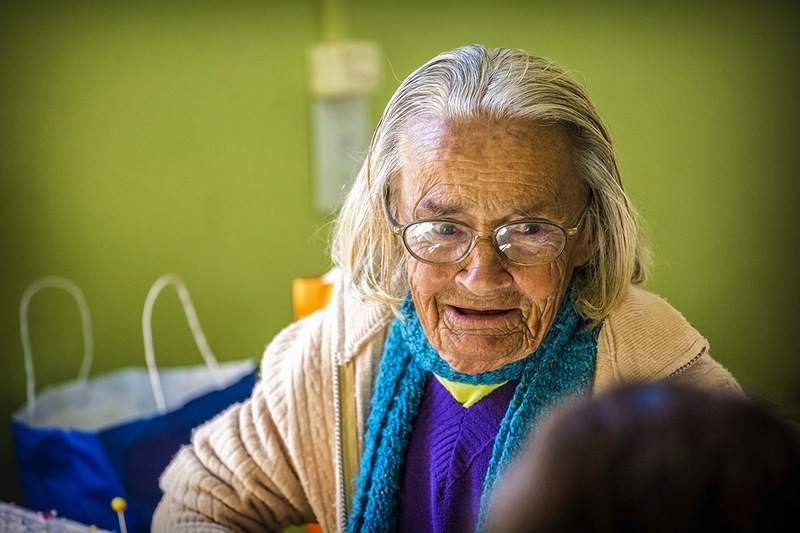 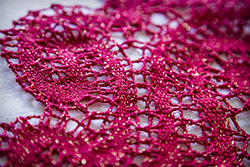 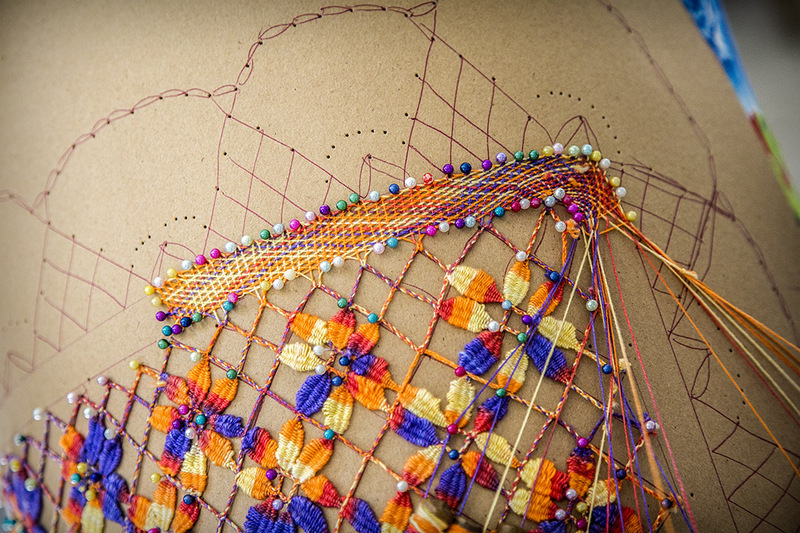 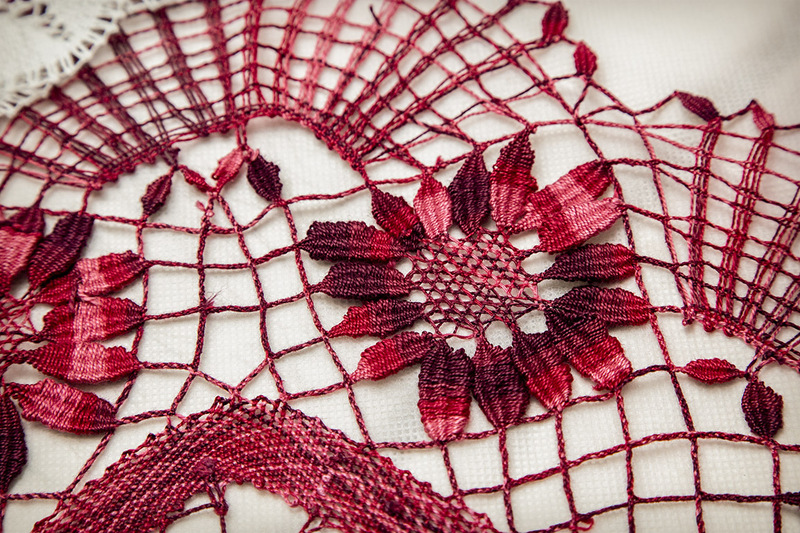 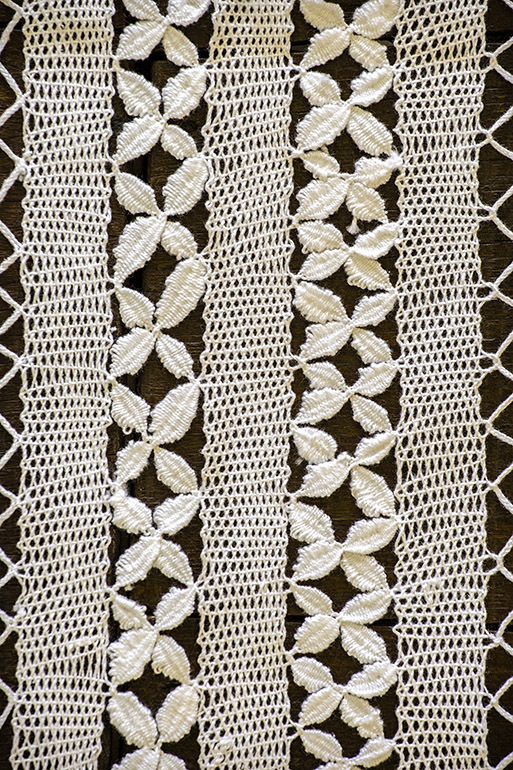 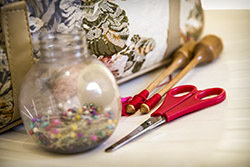 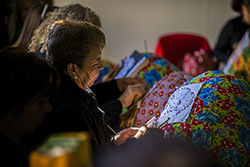 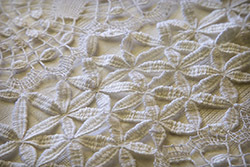 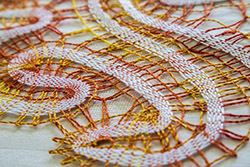 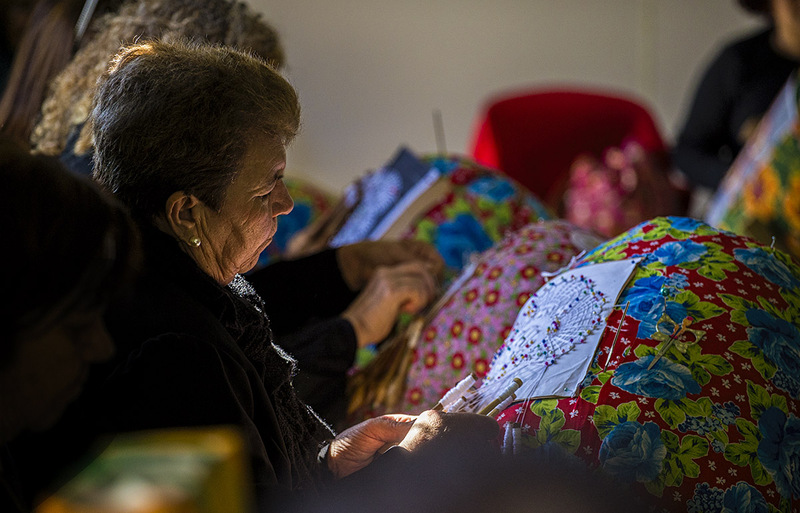 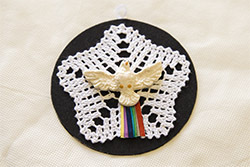 She integrates the Rio Vermelho lacemakers group. 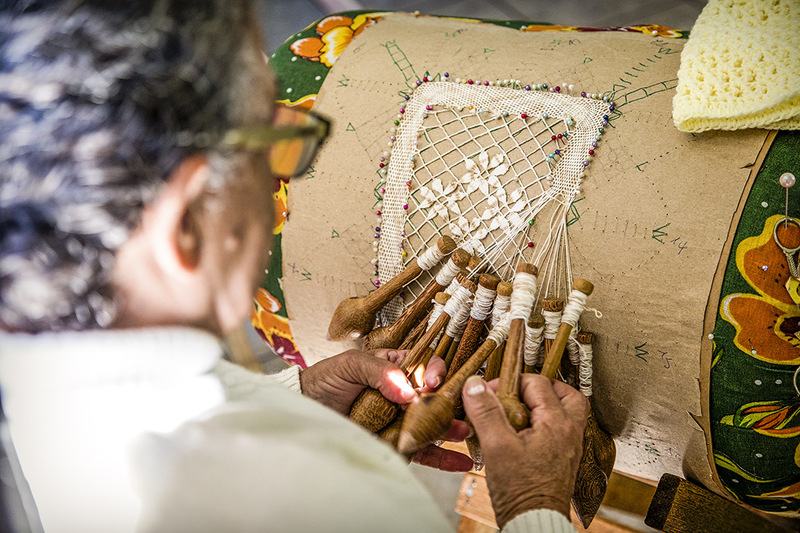 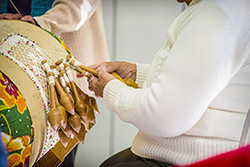 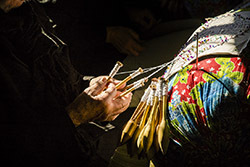 Description: In this photograph Mrs. Ruth Gonçalves Martins weaving bobbin lace. 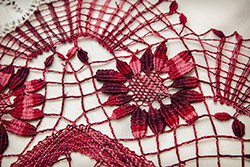 She integrates the Rio Vermelho lacemakers group. 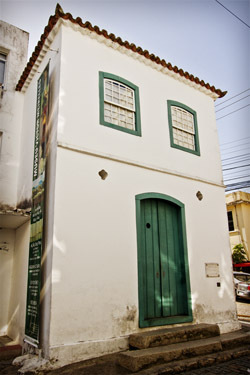 Description: Victor Meirelles Museum. 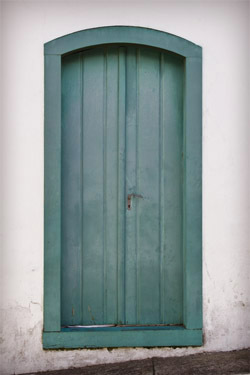 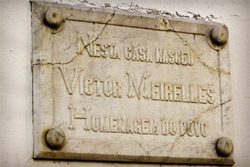 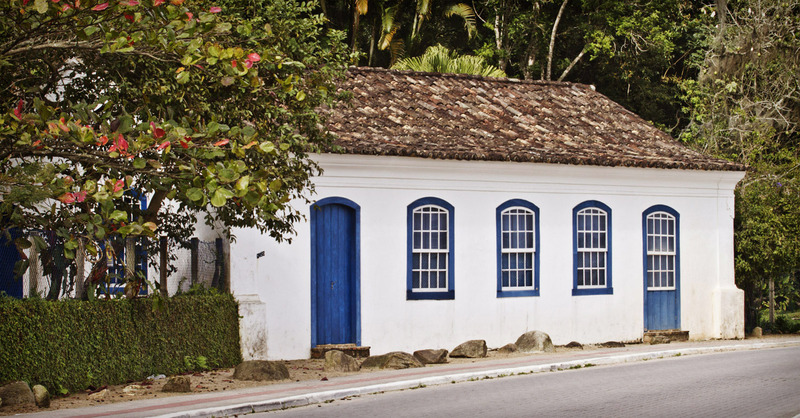 Birthplace (August 18, 1832) of the painter, designer and teacher Victor Meirelles de Lima. 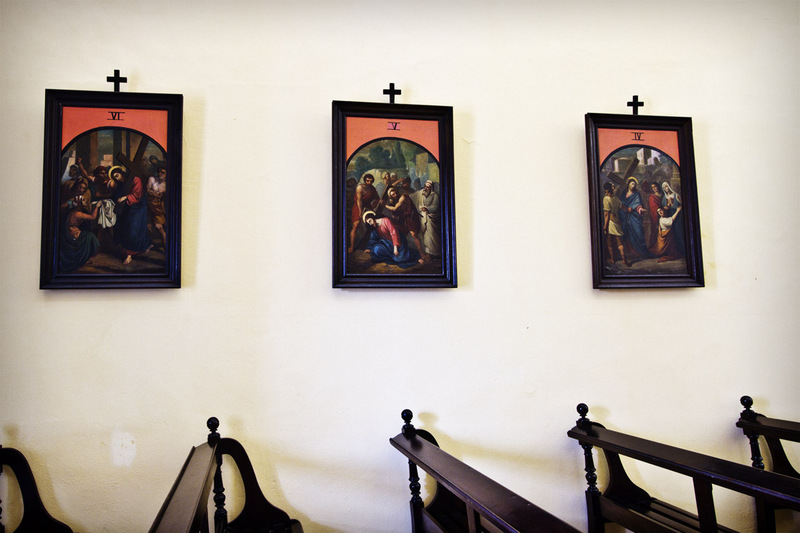 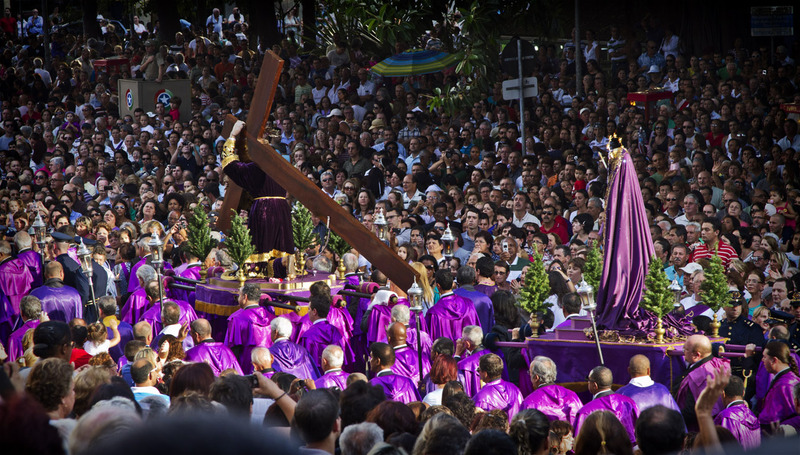 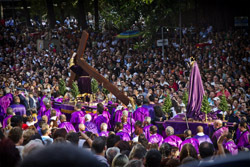 Author of historical paintings, portraits, panoramas and most ot the popular Brazilian screens, as the "First Mass in Brazil." 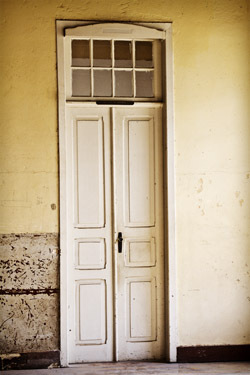 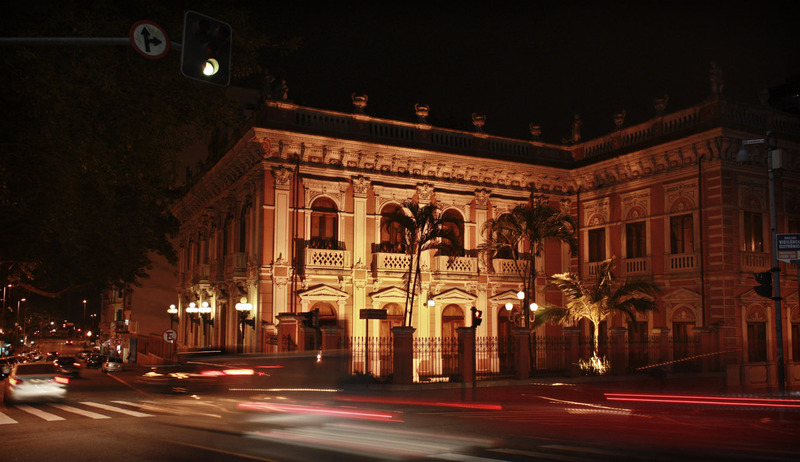 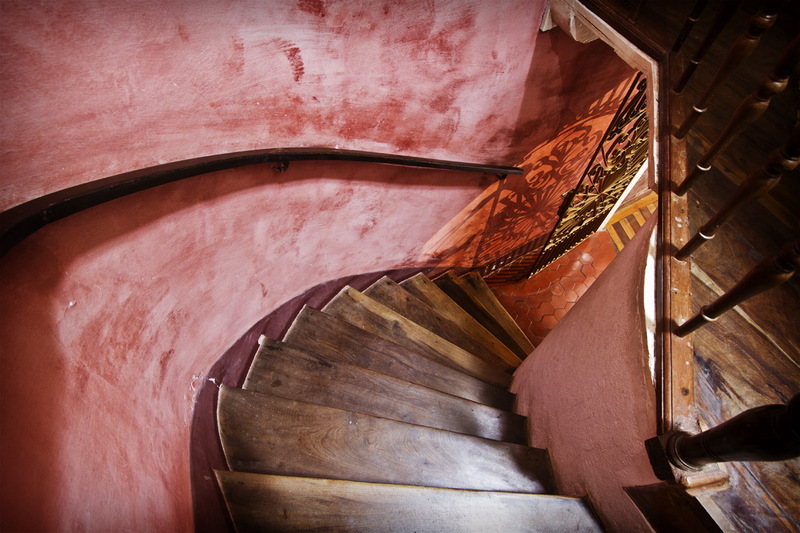 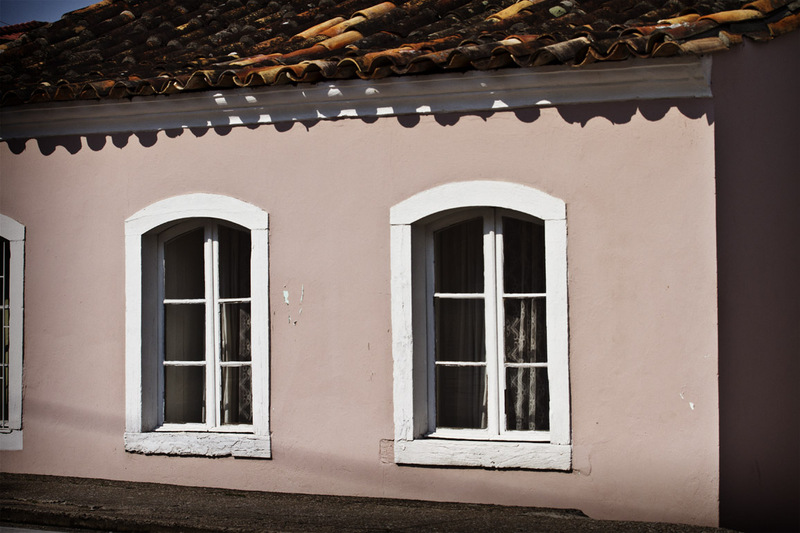 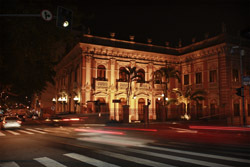 The house is one of the few buildings of nineteenth-century style clearly preserved in Florianópolis Centre. 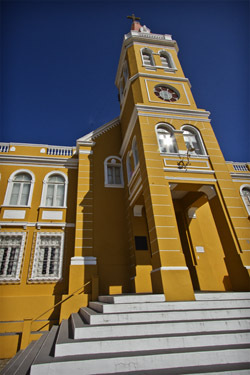 Description: The beginning of its construction was in 1739. 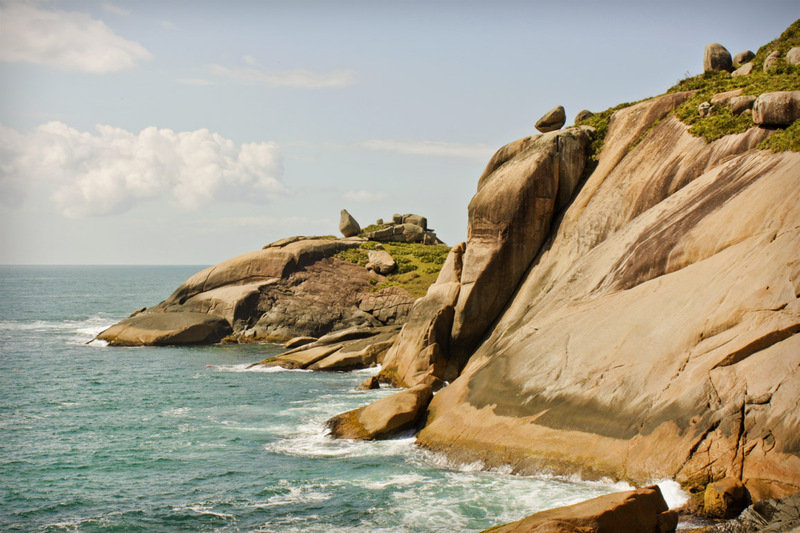 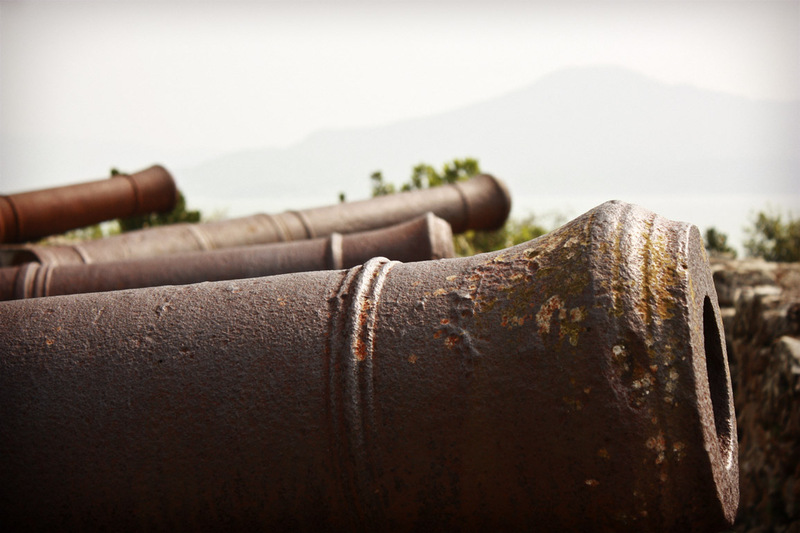 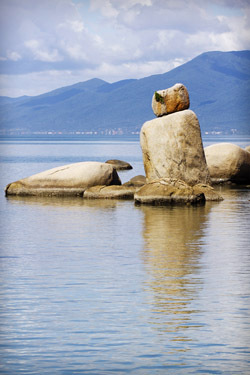 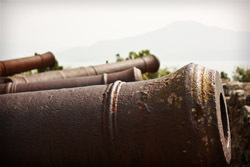 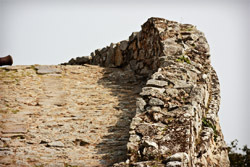 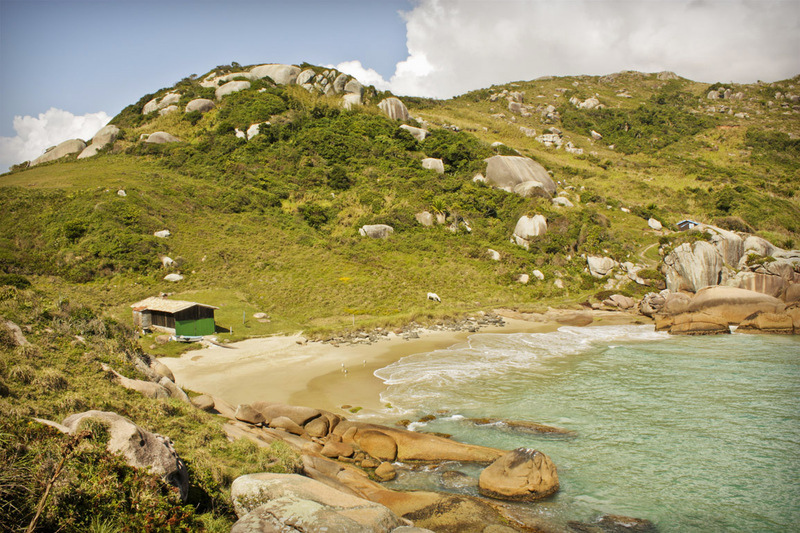 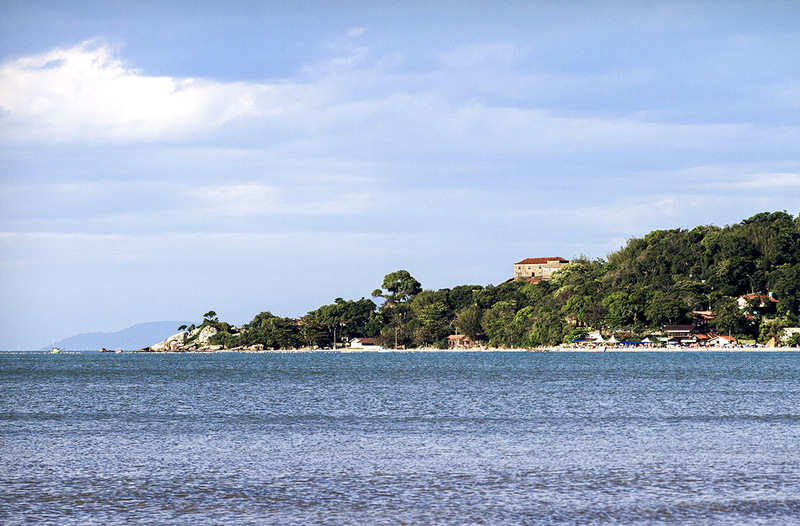 It was part of defensive triangle of the North of Santa Catarina Island in the first half of the eighteenth century. 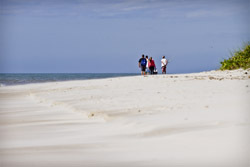 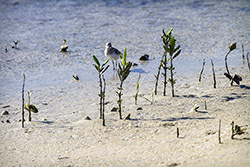 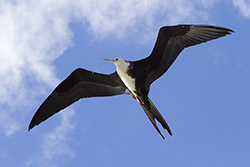 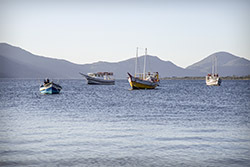 It is located at Ratones Grande island. 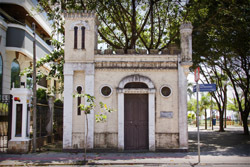 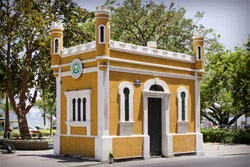 Description: Sewage pumping station built in 1916 as part of sanitary sewerage of Florianópolis. 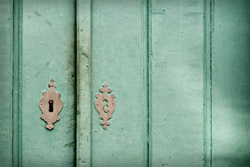 Is currently disabled. 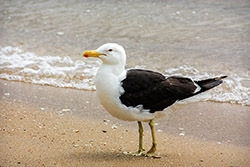 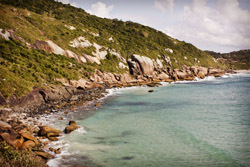 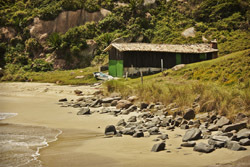 Description: The beach is located at the North of Santa Catarina Island. 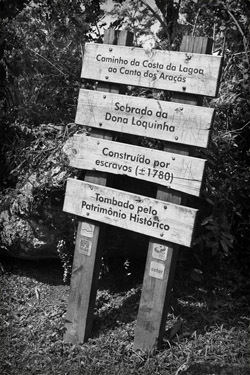 At the top of it is located São José da Ponta Grossa fort. 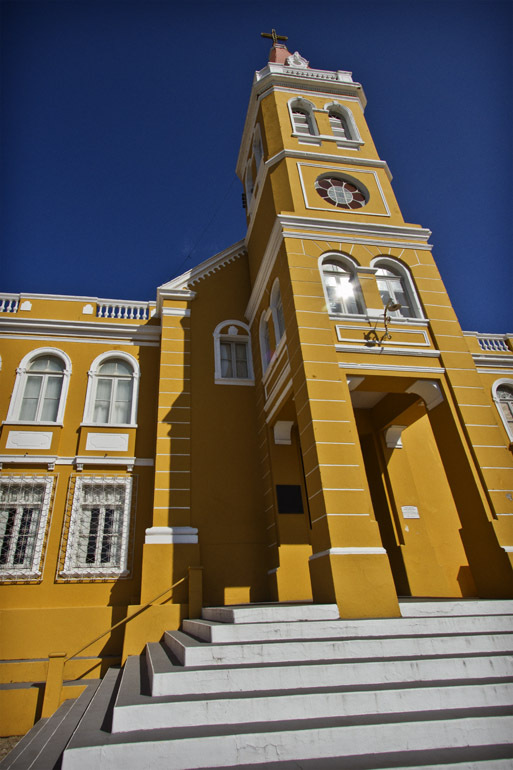 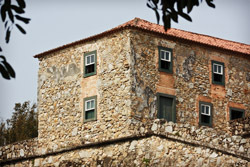 It was built from 1740 and integrated the North defensive triangle of the island in the first half of the eighteenth century. 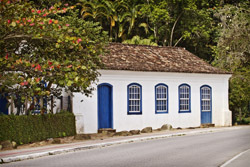 Description: House located at Rio Vermelho neighborhood. 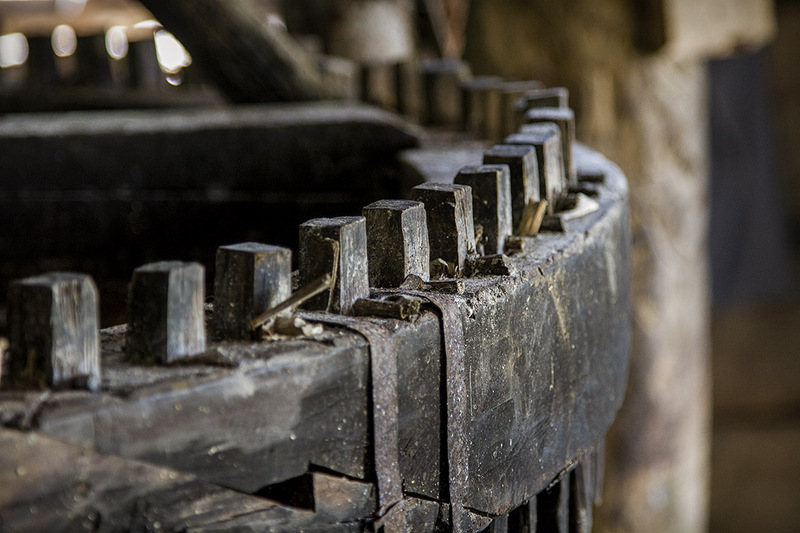 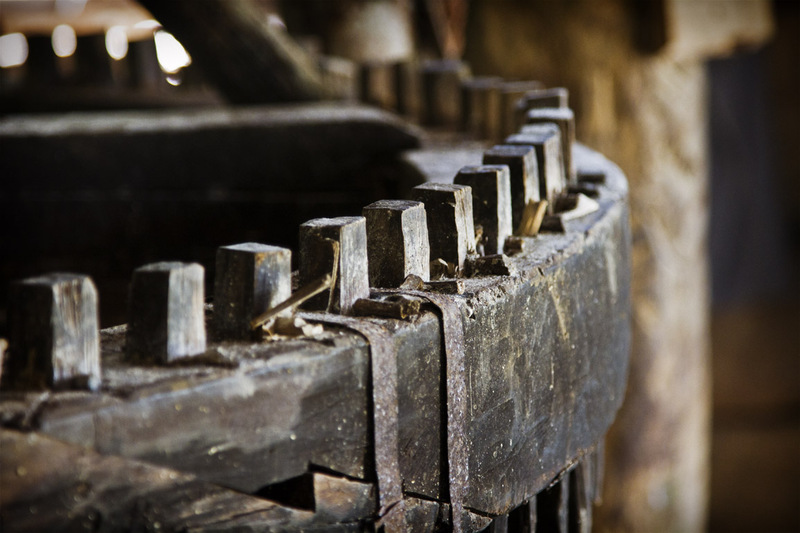 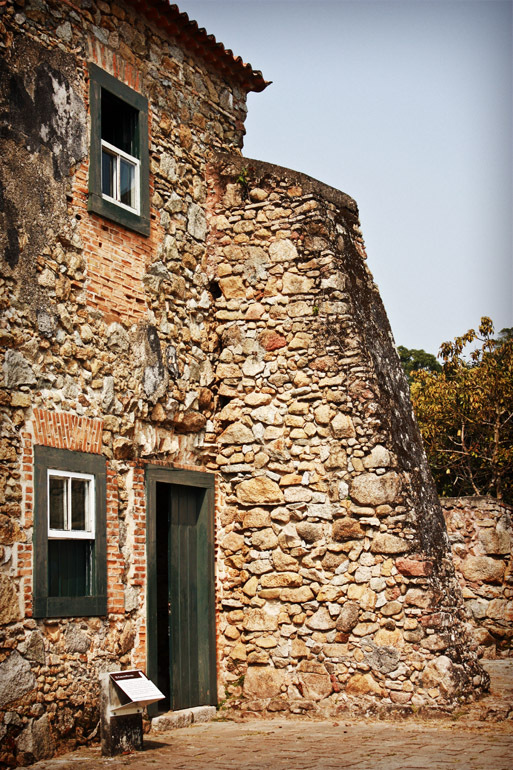 Description: Old cachaça mill located at Costa da Lagoa neighborhood. 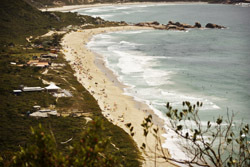 Description: Santo Antônio de Lisboa beach, in the background the downtown area. 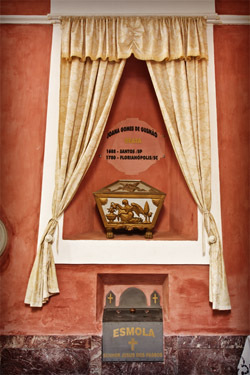 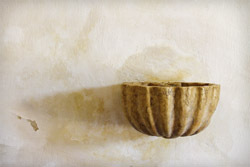 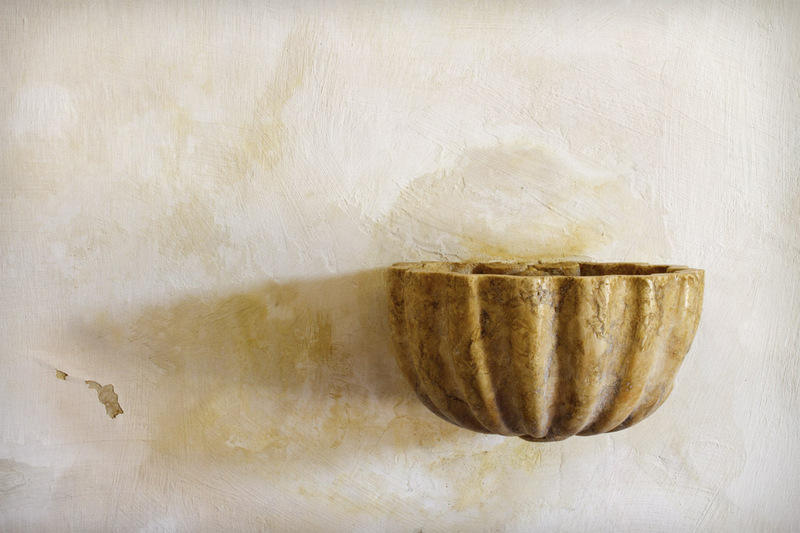 Description: Sink of holy water of the Nosso Senhor Jesus Passos Chapel of the Imperial Charity Hospital. 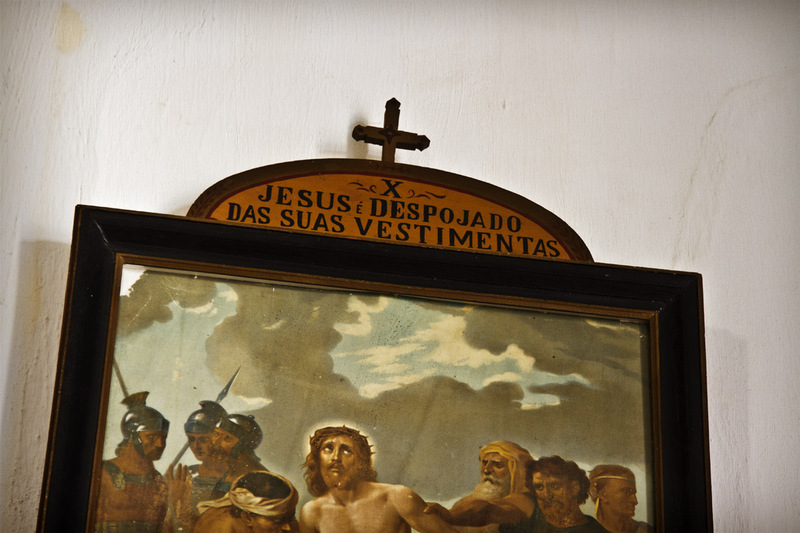 The Irmandade do Senhor Jesus Passos was founded in 1765 with the aim of practicing worship the Senhor Jesus dos Passos, and be the guardian of his image. 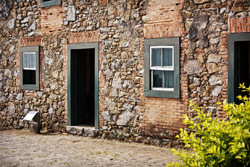 In 1782 began to provide care for sick poor and underprivileged, providing food and medical care. 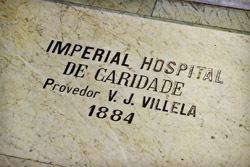 It was during this period that emerged an institution that result in a hospital (which became the Imperial Charity Hospital) with hospital medical care. 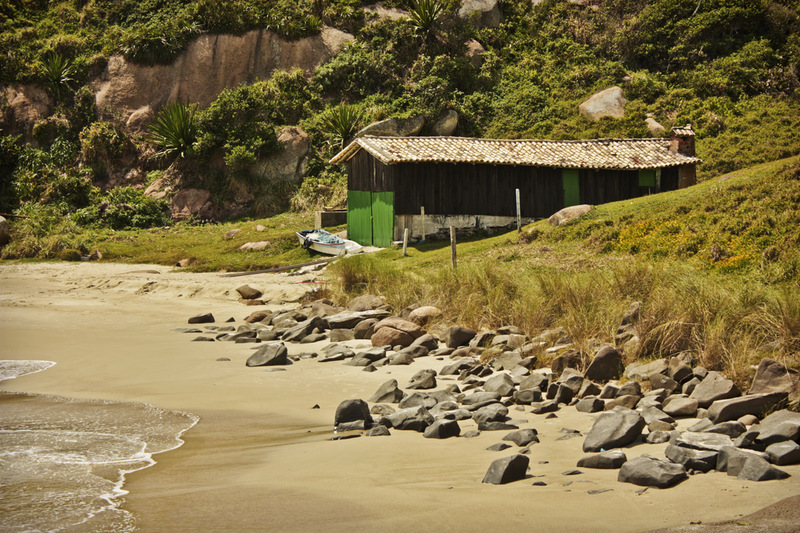 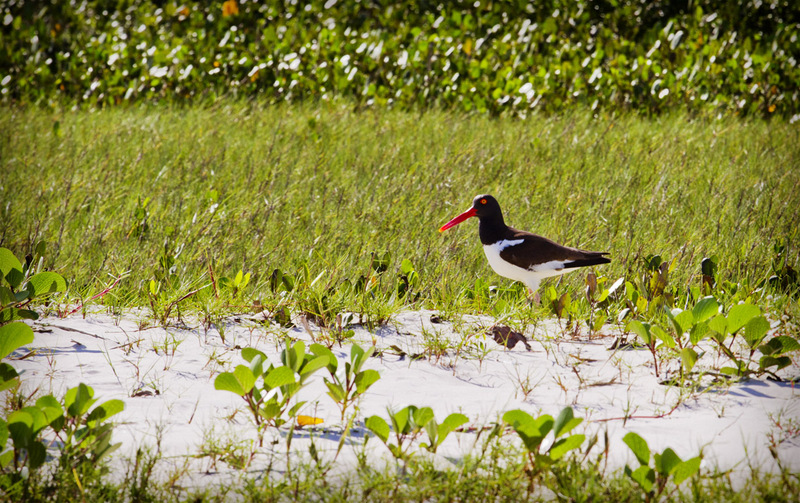 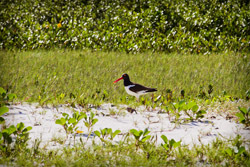 Description: Place: Ribeirão da Ilha beach. 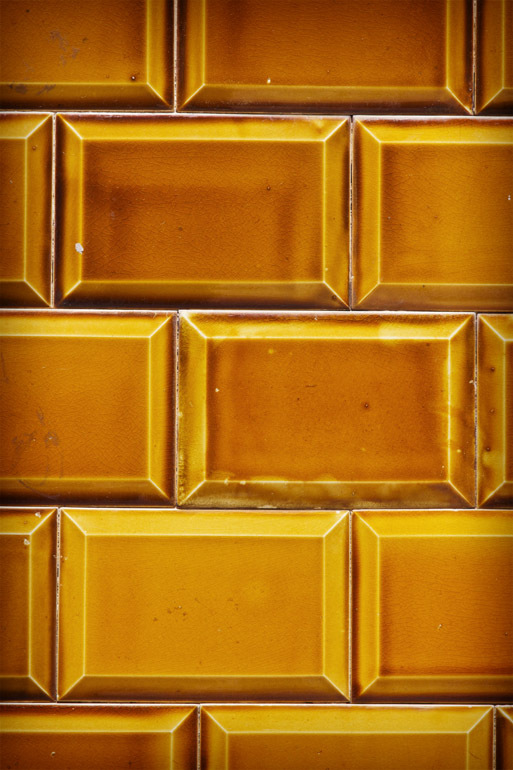 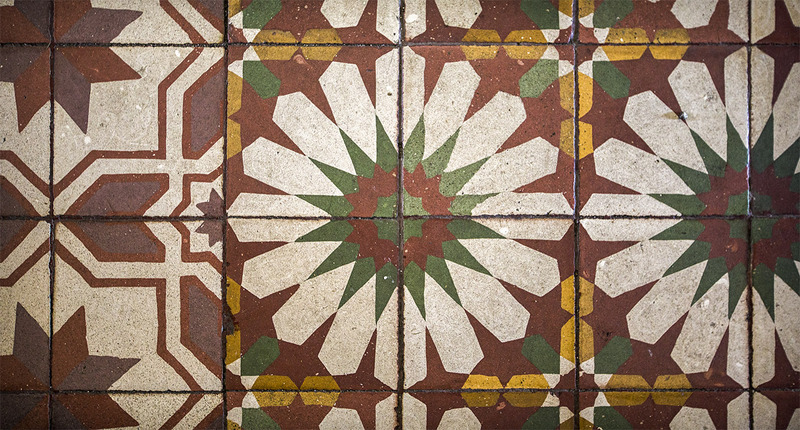 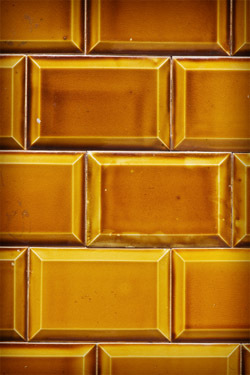 Description: Detail of the tiles used on the roof of a house built in 1806. 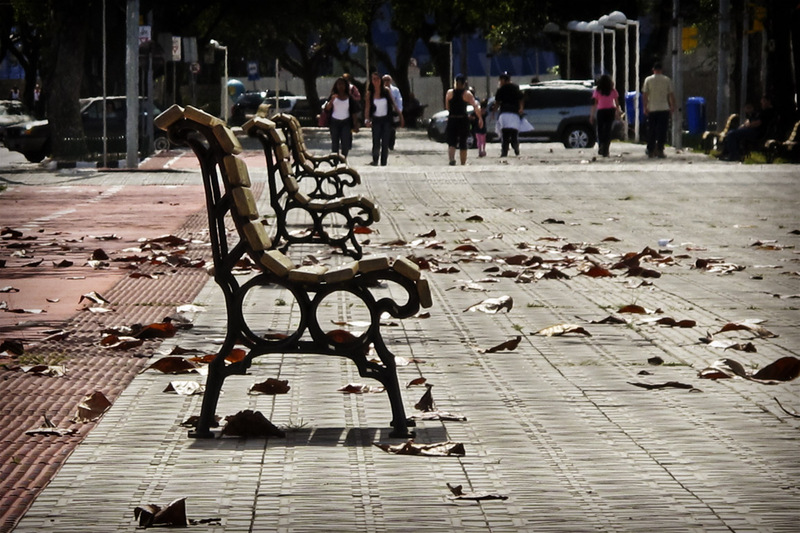 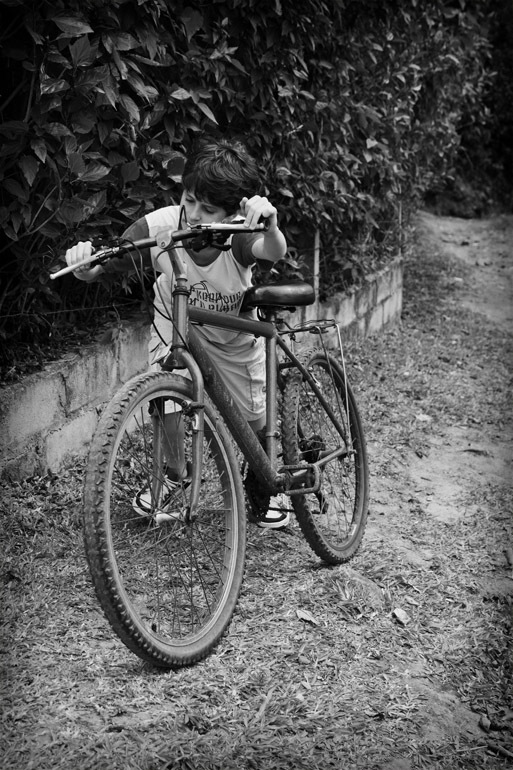 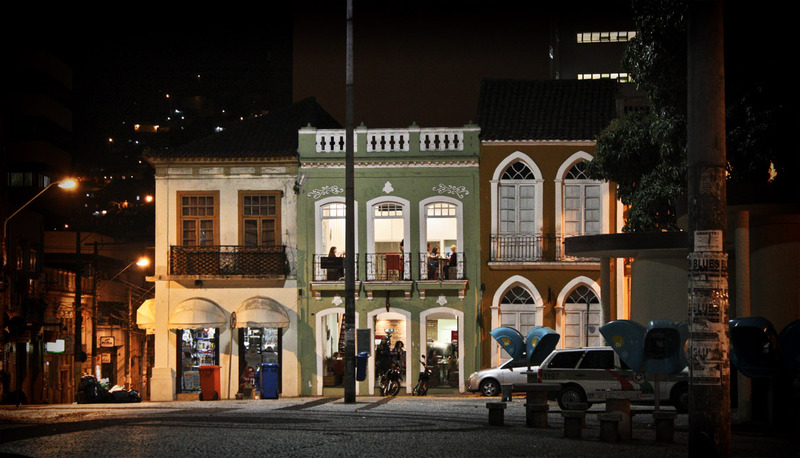 Place: Ribeirão da Ilha neighborhood. Description: Collection of Nossa Senhora das Necessidades Church in Santo Antônio de Lisboa neighborhood. 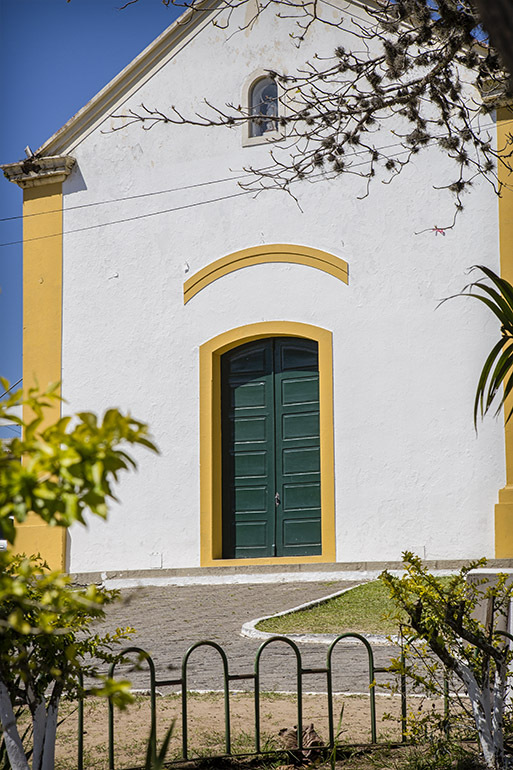 This church was built between 1750 and 1756. 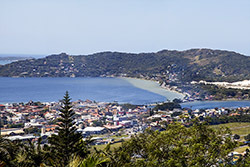 Description: The bridge connects the mainland and the island town of Florianopolis part. 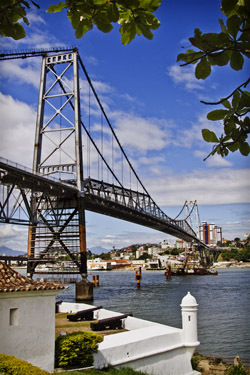 It is one of the largest suspension bridges in the world and the largest in Brazil. 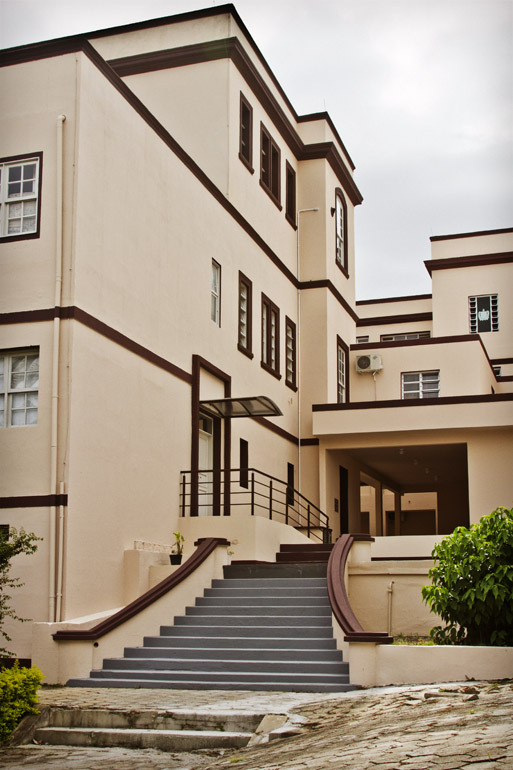 Its construction began on November 14, 1922 and was inaugurated on May 13, 1926. 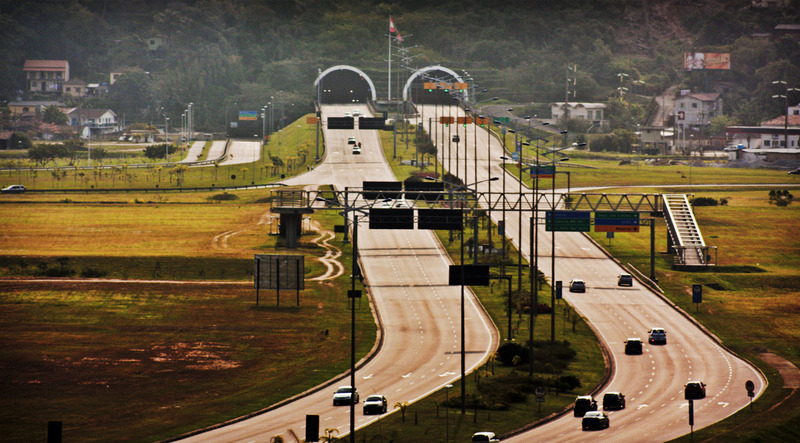 He is currently closed for the passage of pedestrians or vehicles due to a reform of its structure. 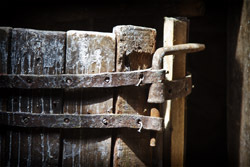 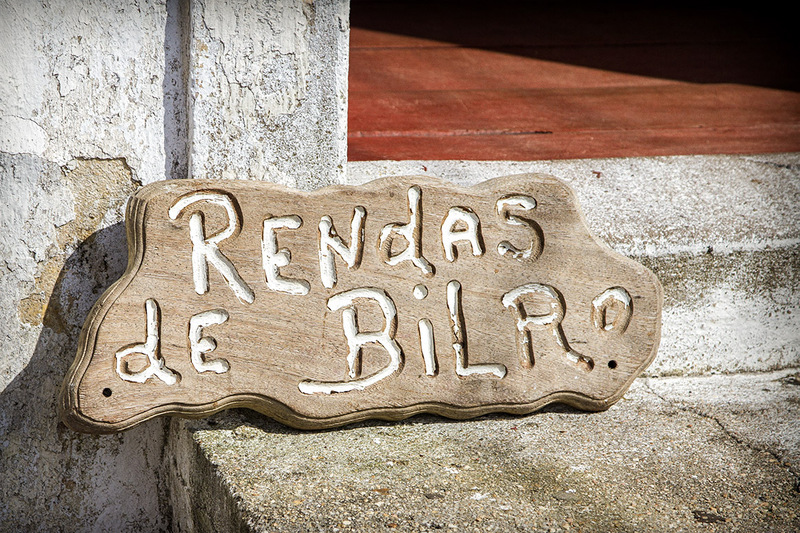 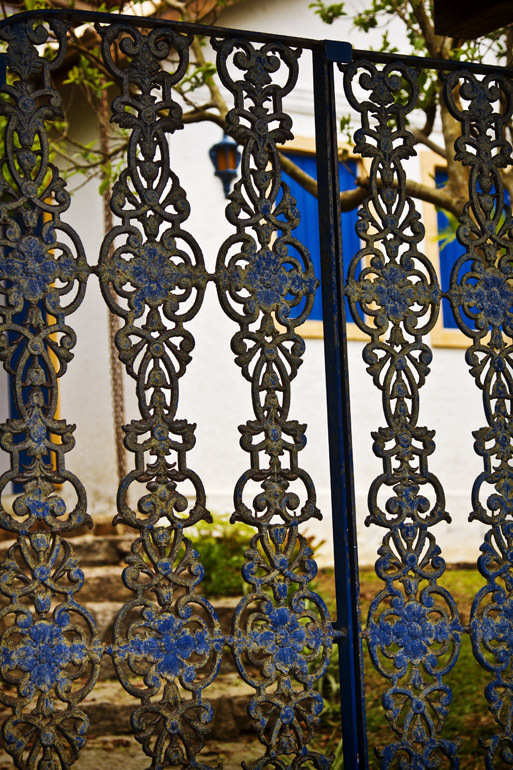 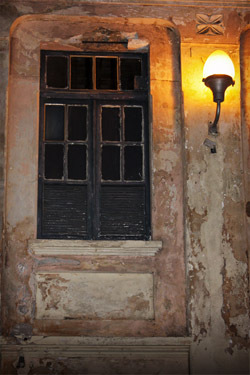 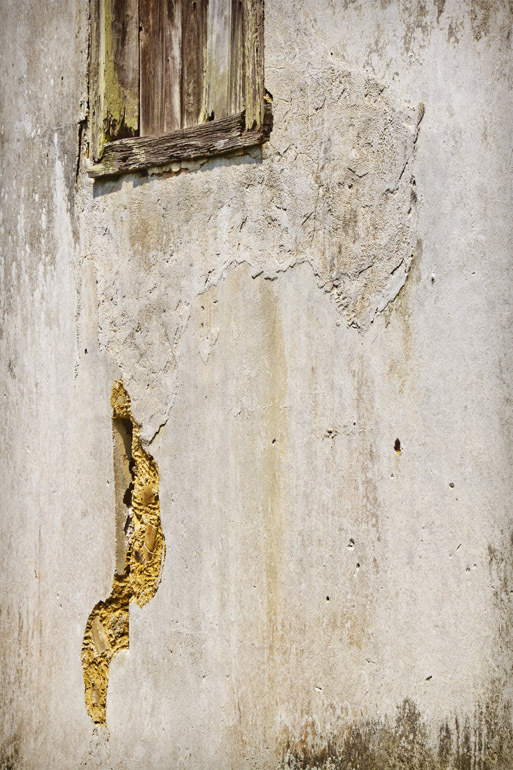 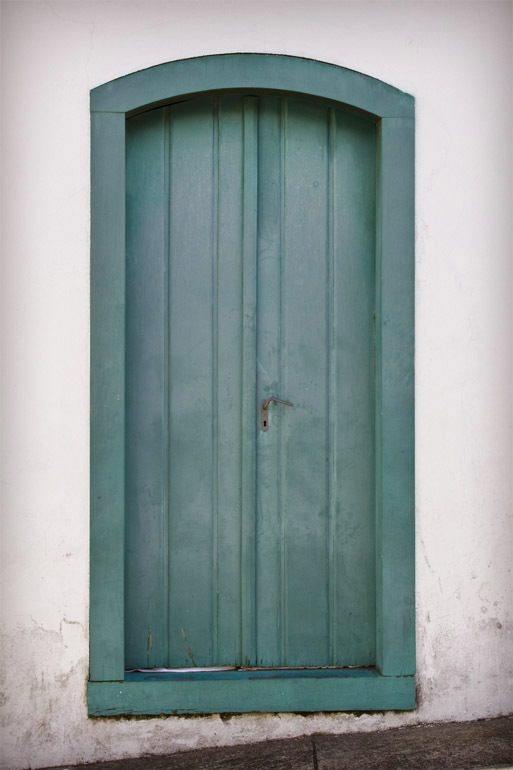 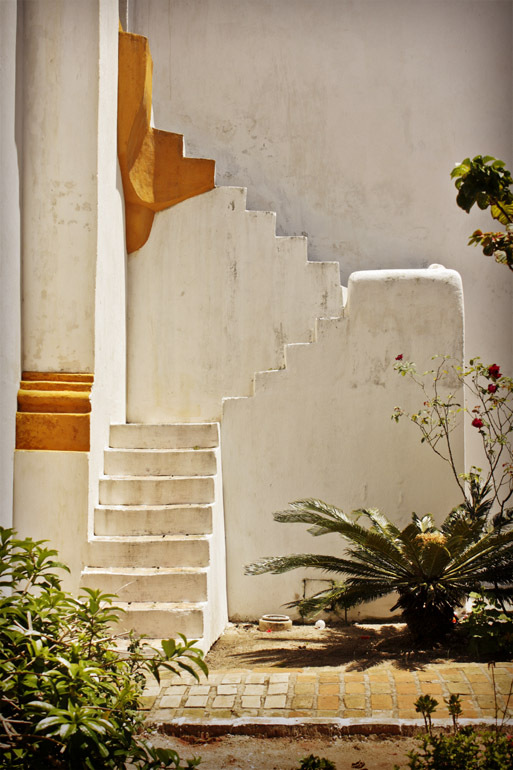 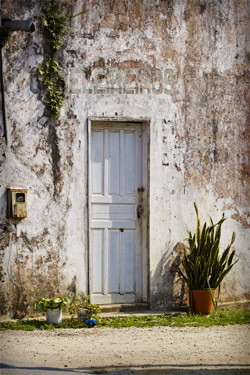 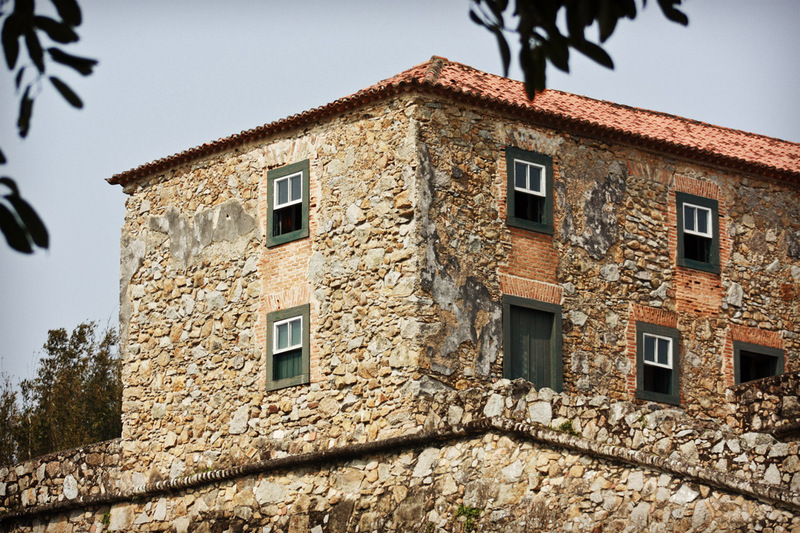 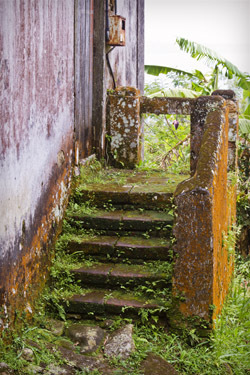 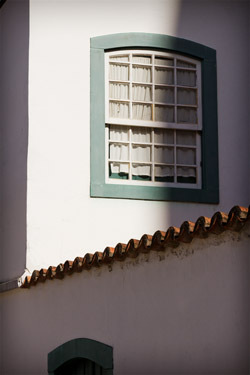 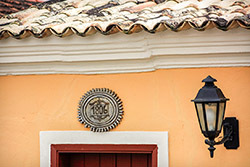 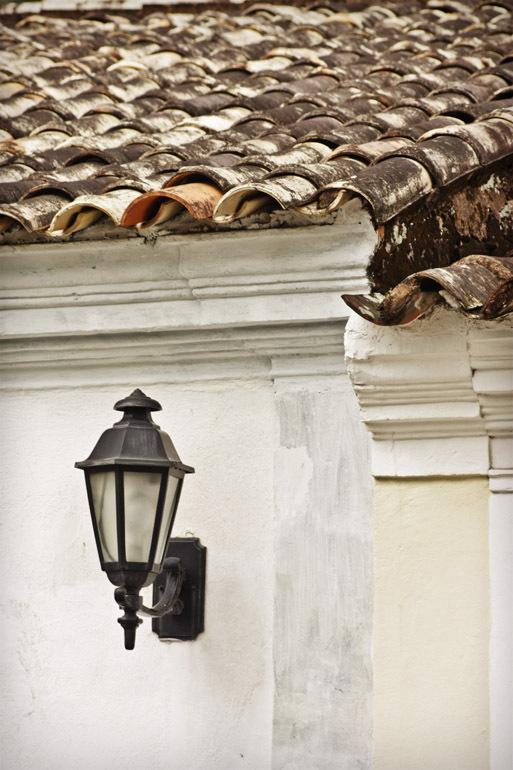 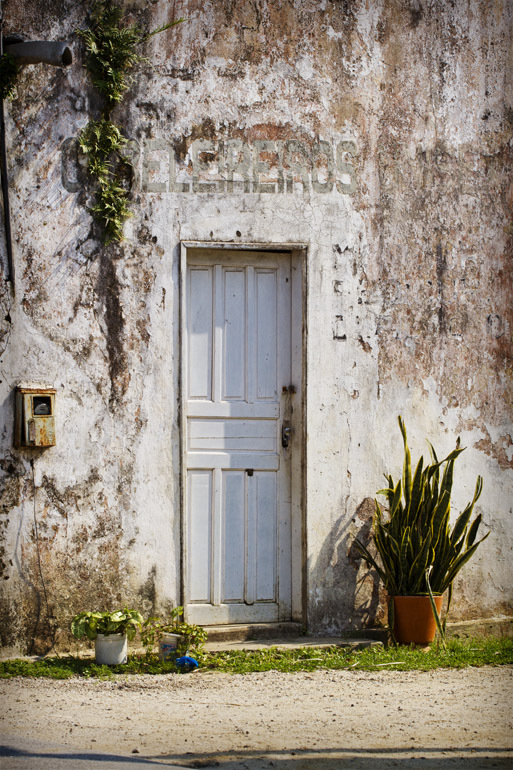 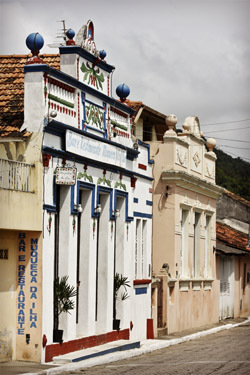 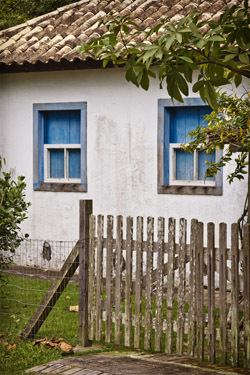 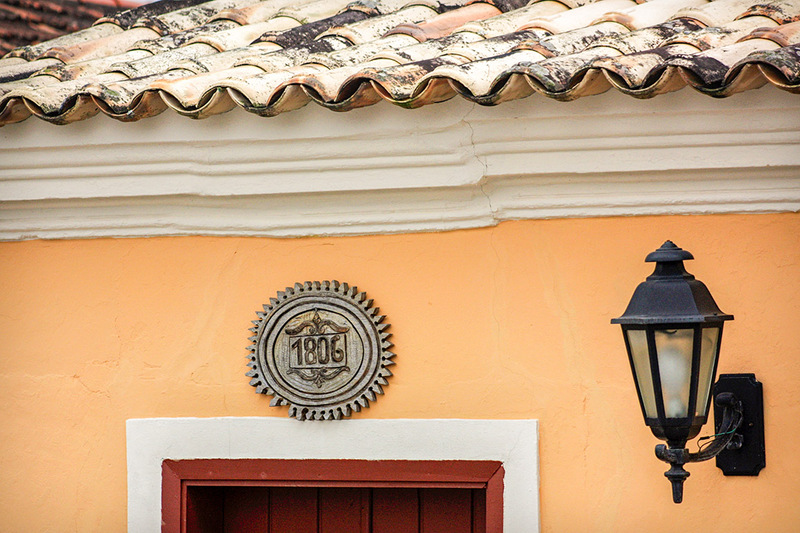 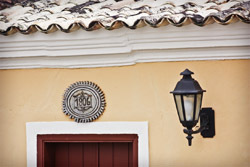 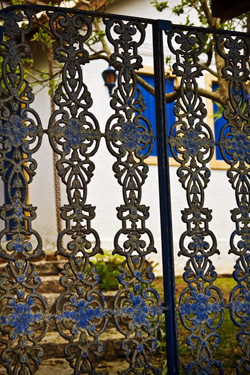 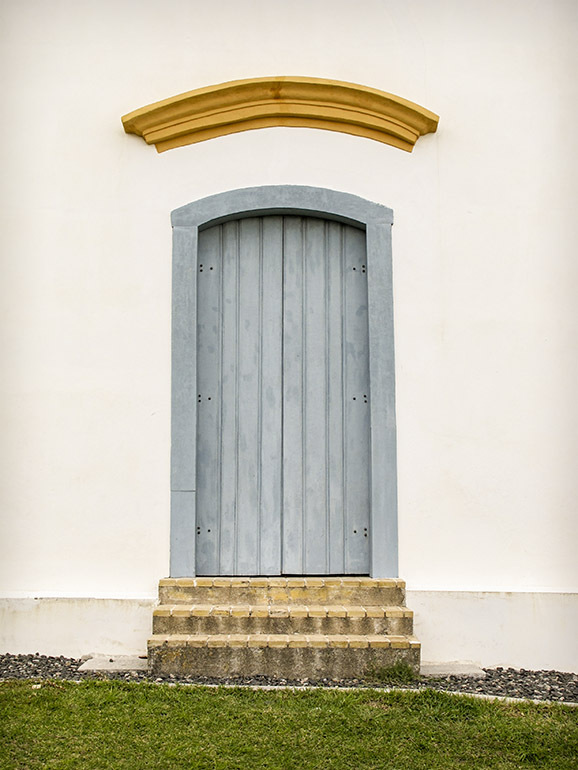 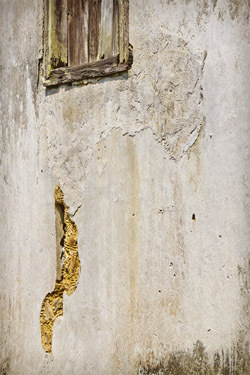 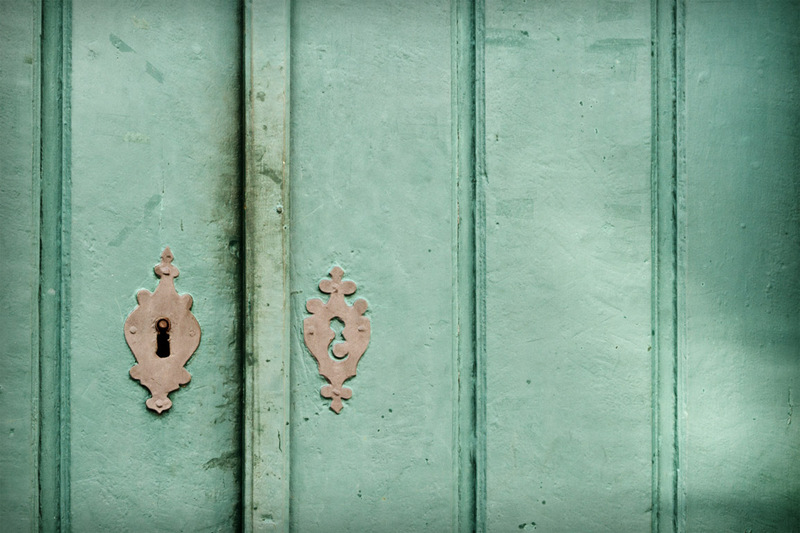 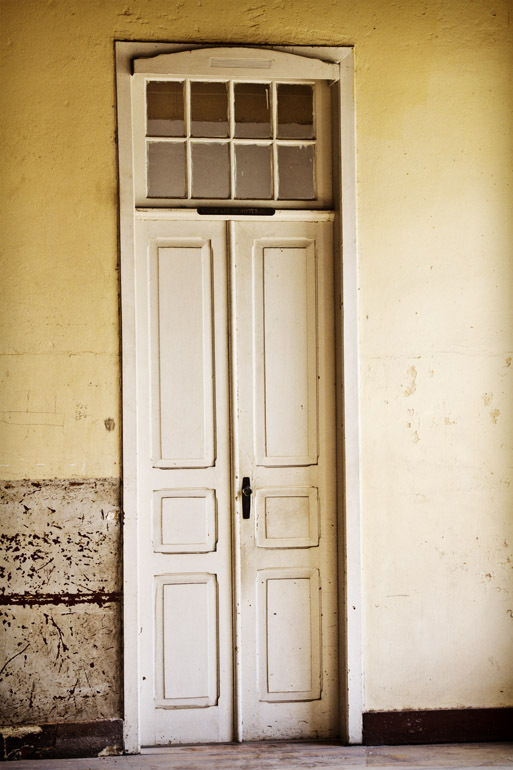 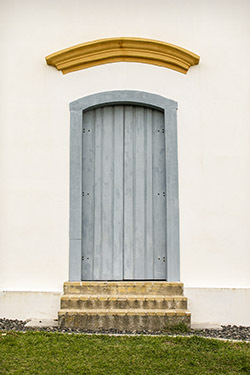 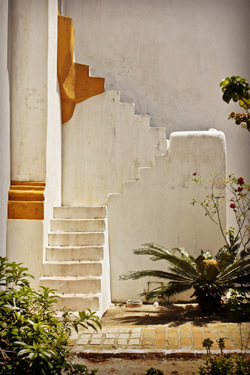 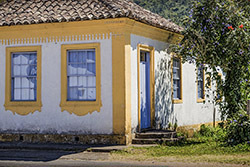 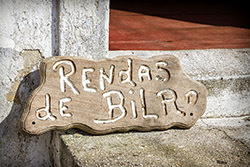 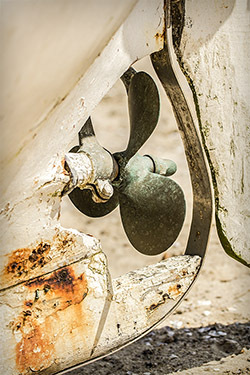 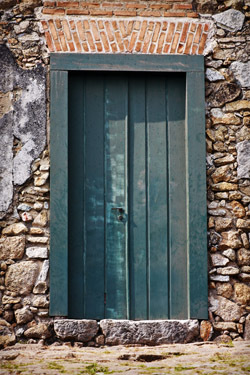 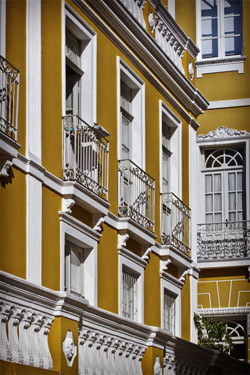 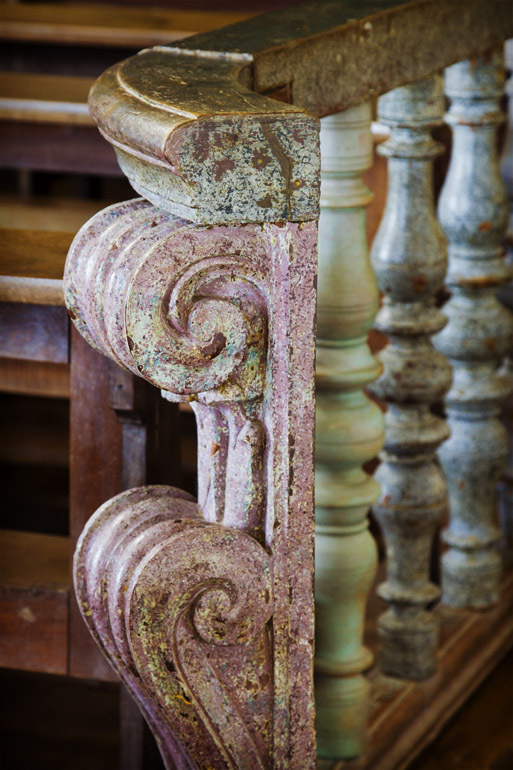 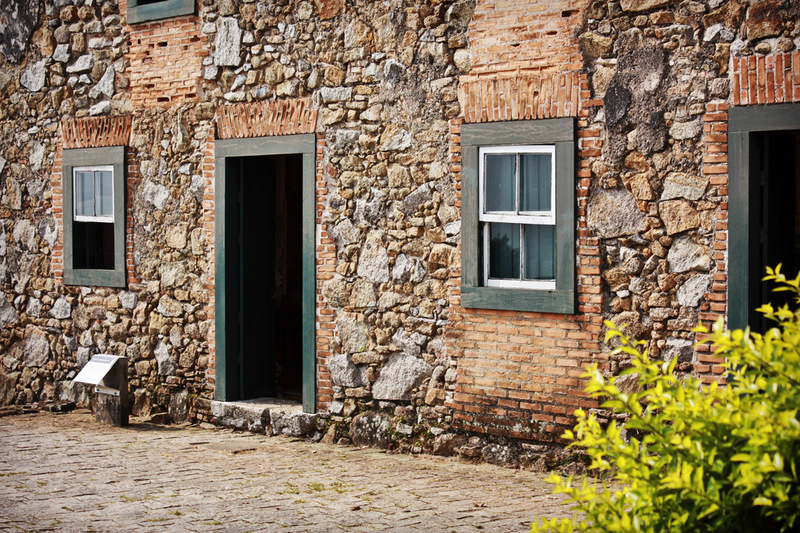 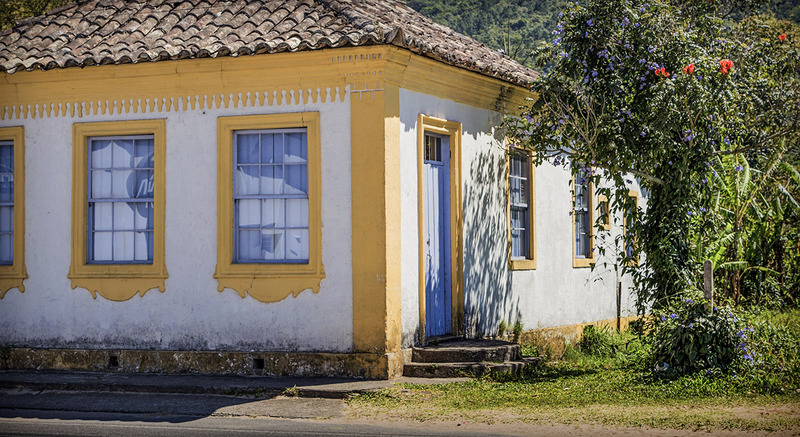 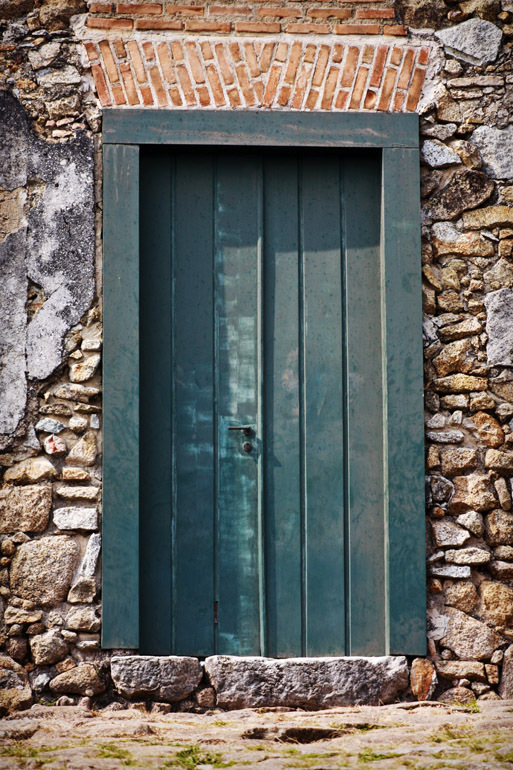 Description: Detail of old building of the Santa Catarina Island. 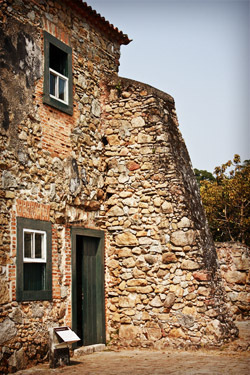 Fort of São José da Ponta Grossa. 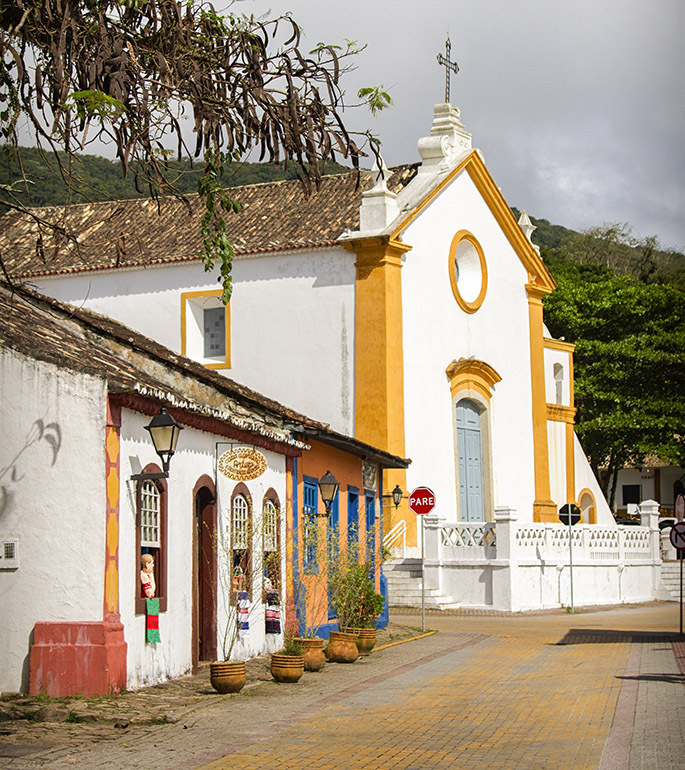 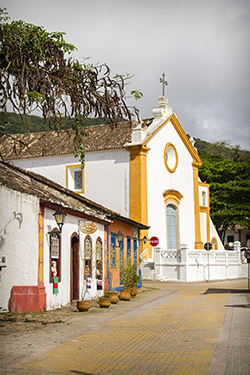 Description: Tiradentes Street in the city centre. 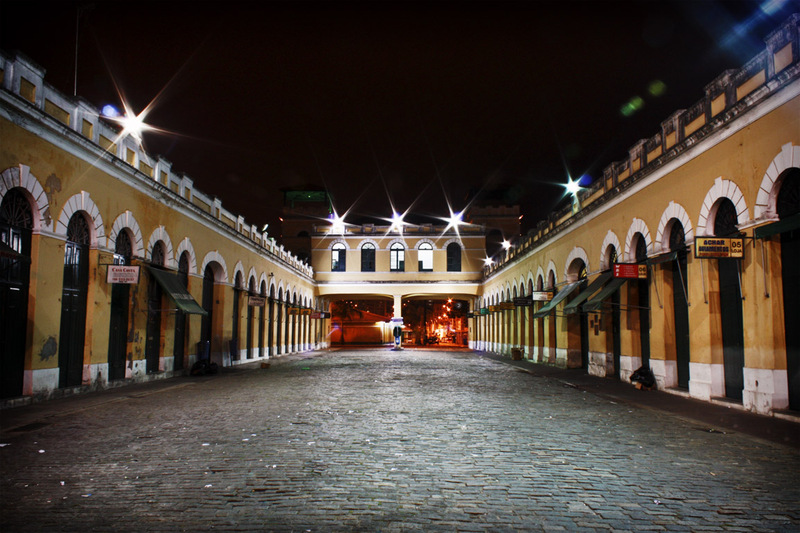 Description: Inaugurated in 1806 it is located in Ribeirão da Ilha neighborhood. 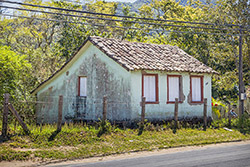 un bel mazzolino di fior ..."Immigration process that occurred in Brazil between the late nineteenth and early twentieth centuries, among other purposes, brought labor and population to occupy vacant areas, part of a policy implemented by Brazilian Empire. 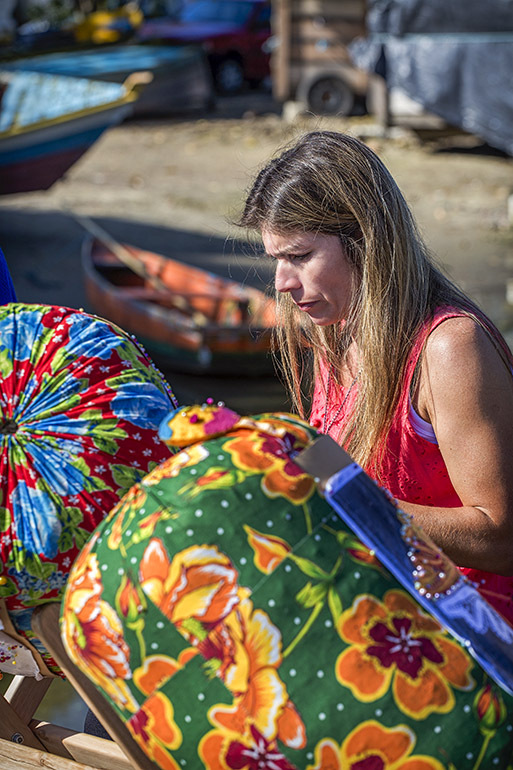 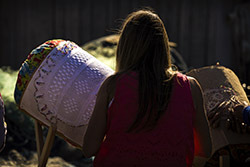 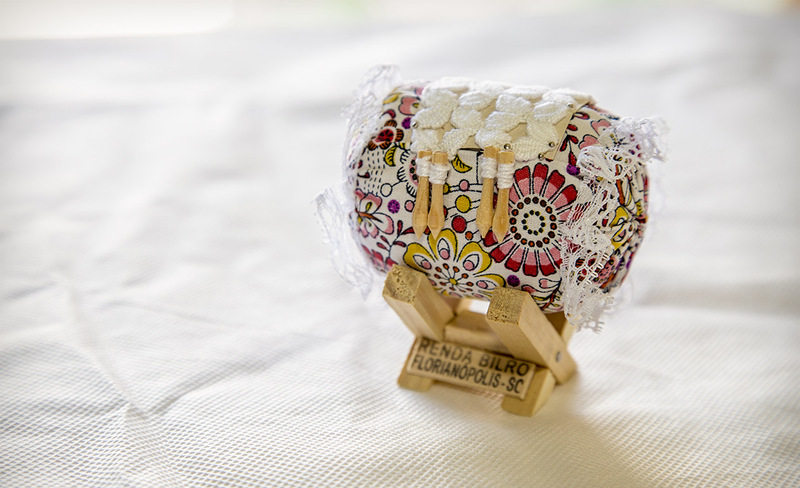 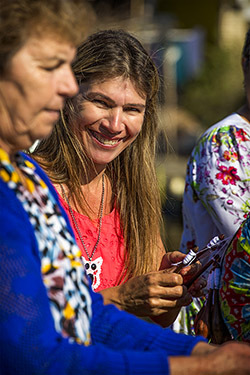 These new inhabitants came to form part of the great fusion of races and cultures that today form Brazilian people. 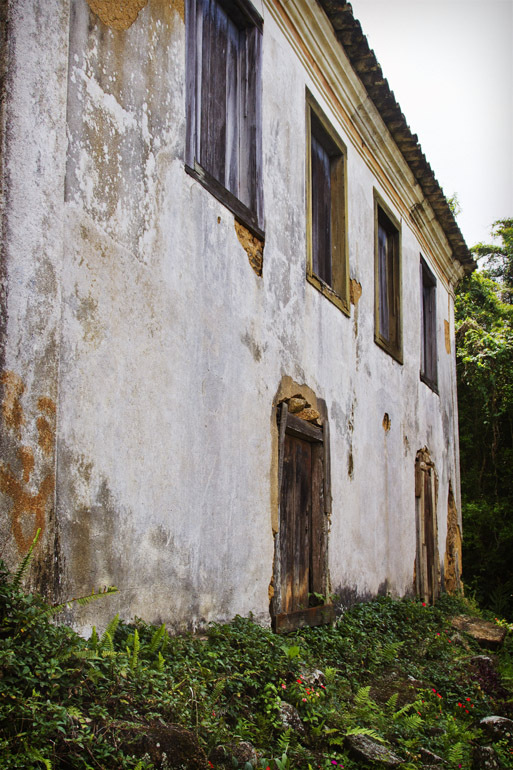 One hundred and forty years have passed since the first group of Italian families arrived in Azambuja, Pedras Grandes, Brazil. 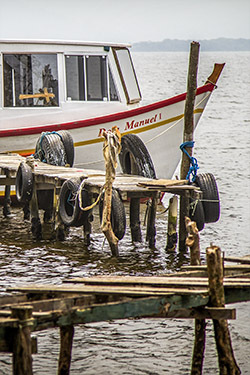 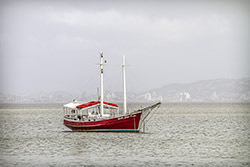 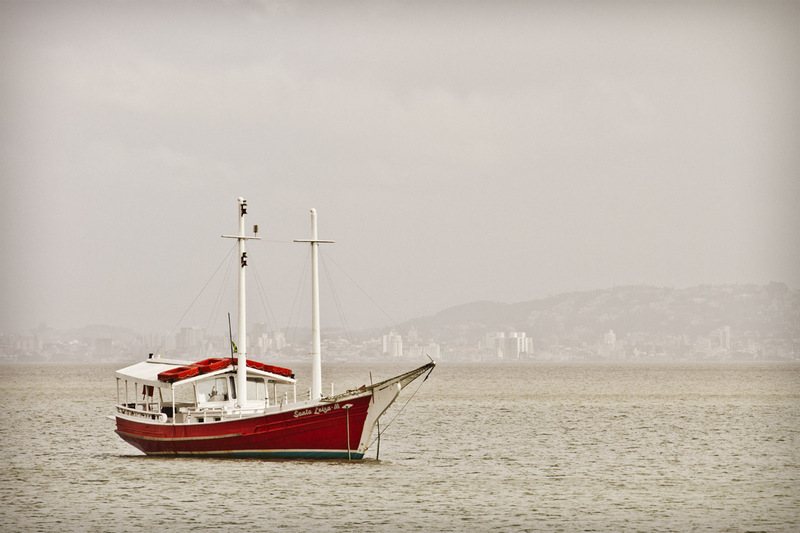 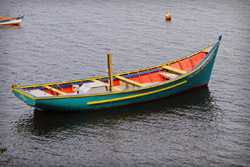 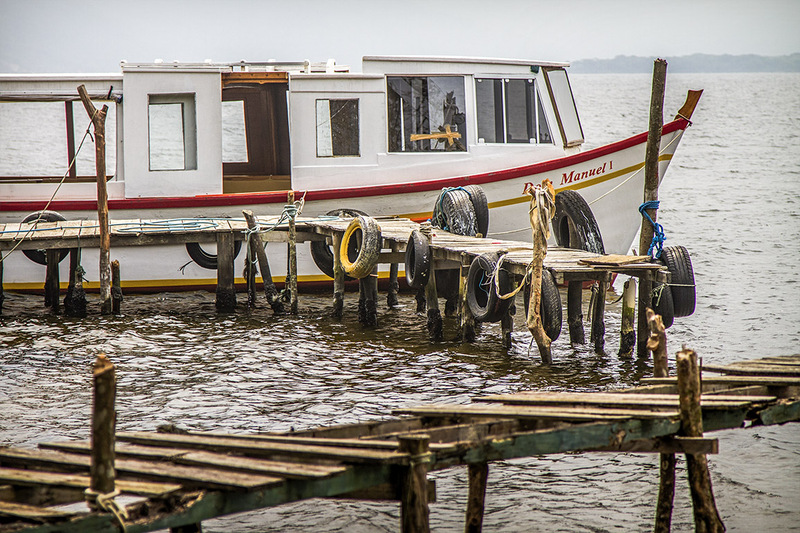 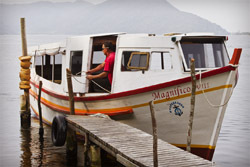 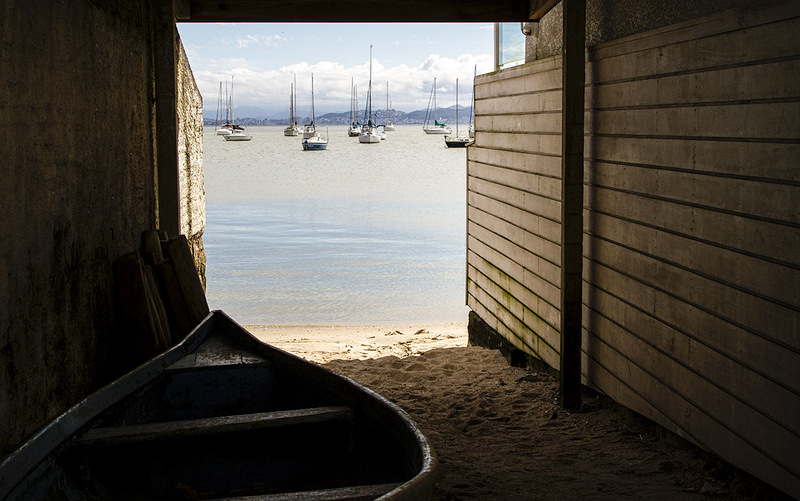 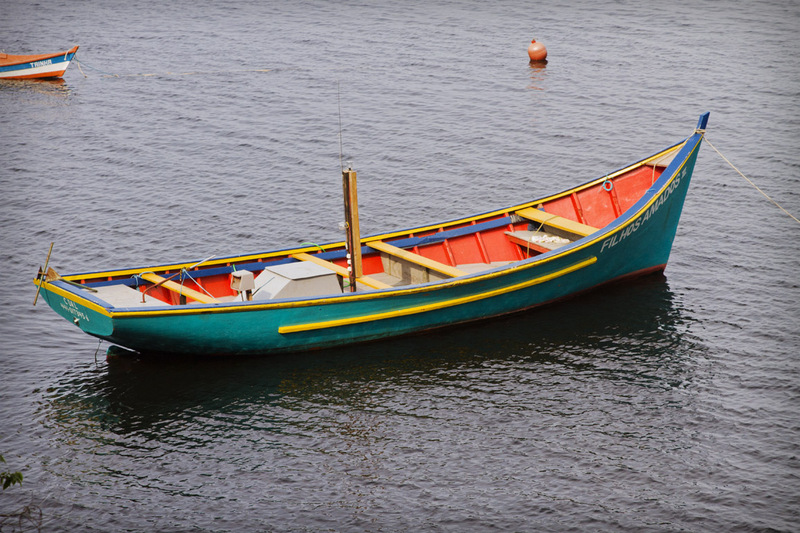 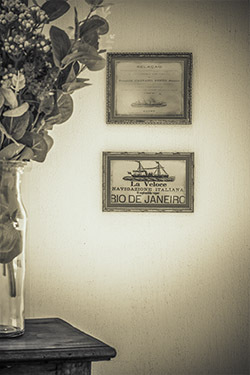 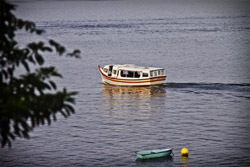 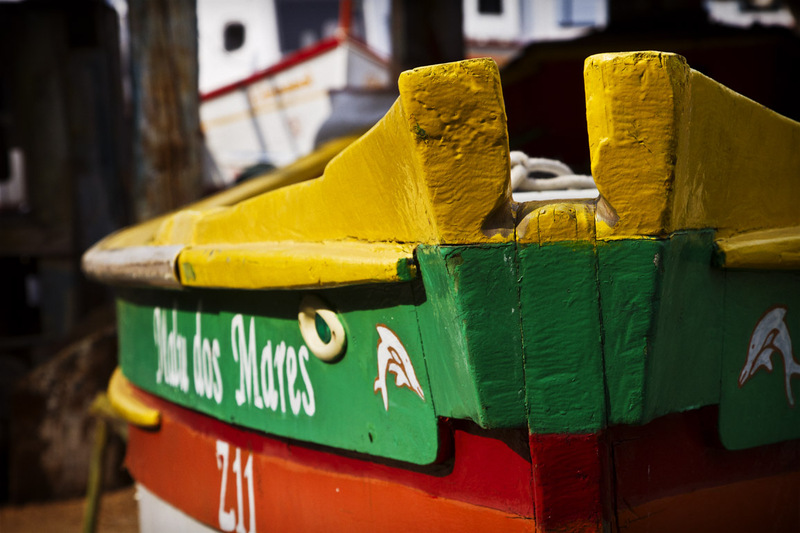 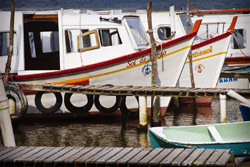 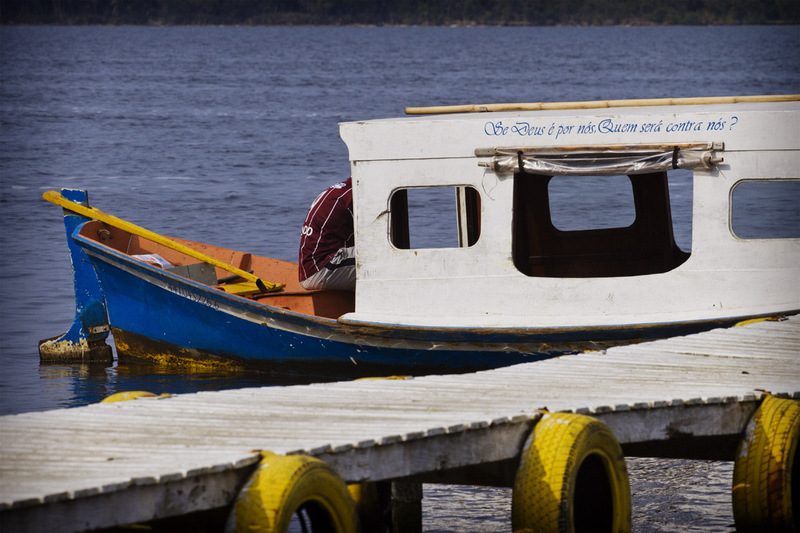 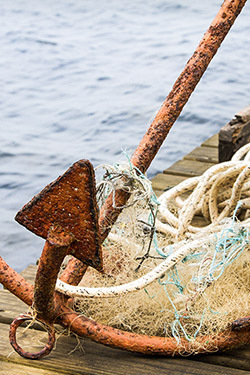 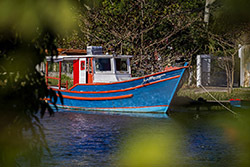 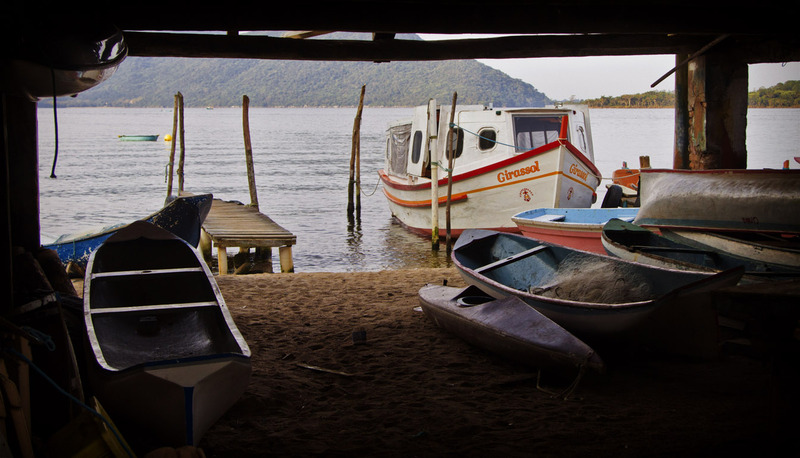 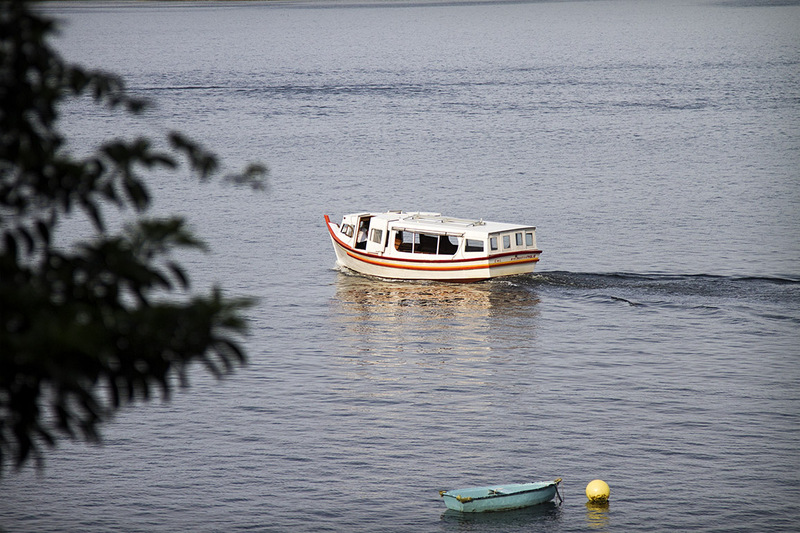 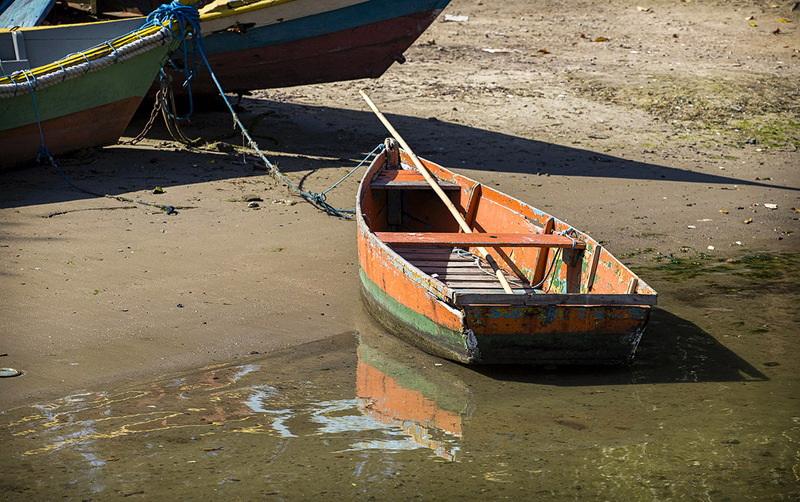 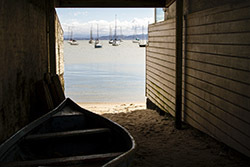 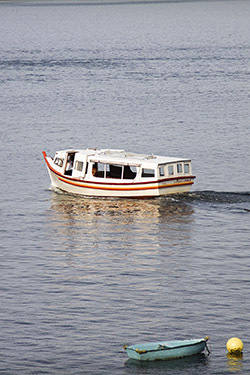 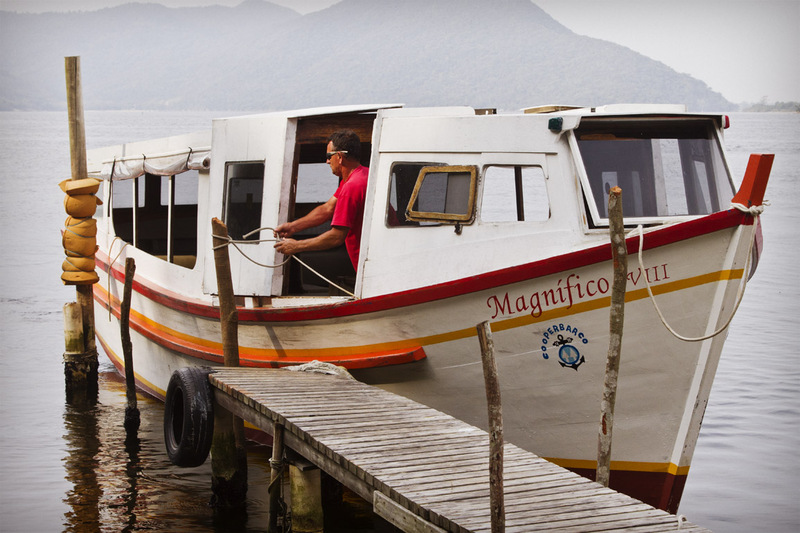 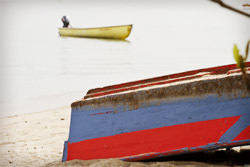 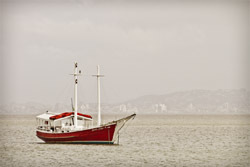 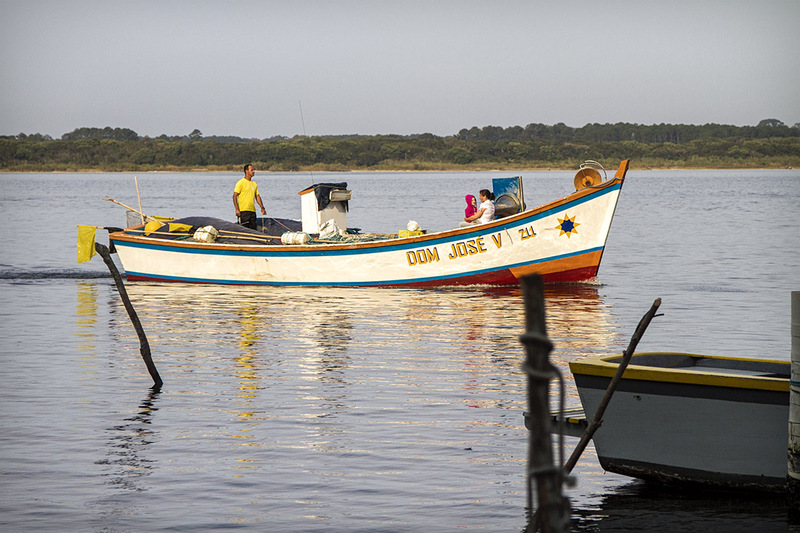 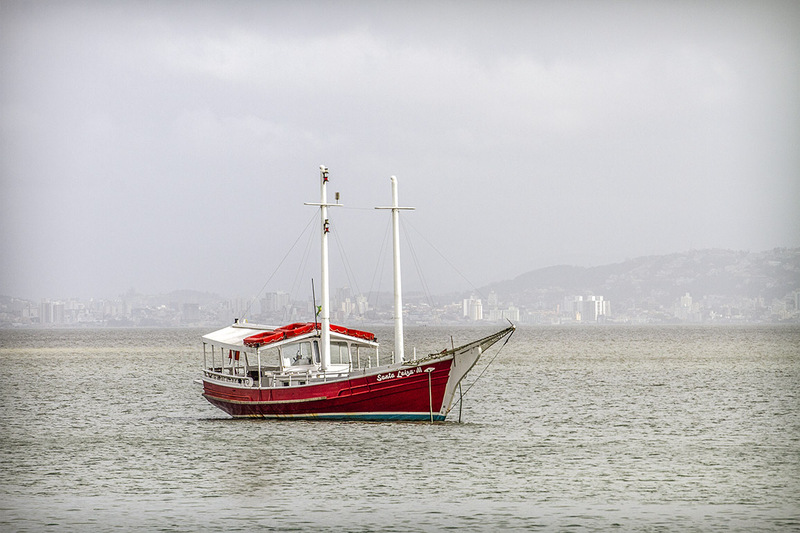 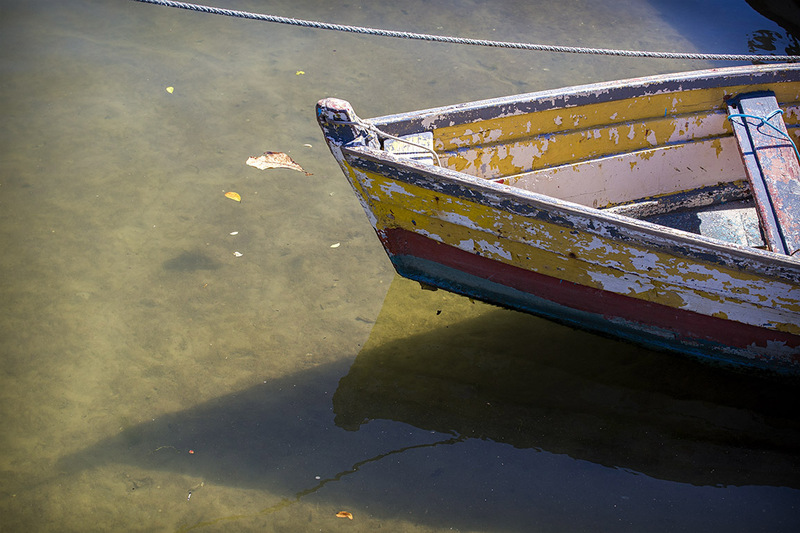 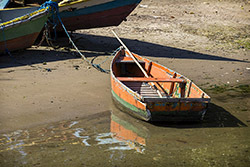 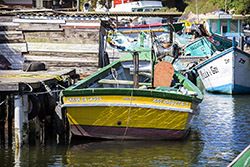 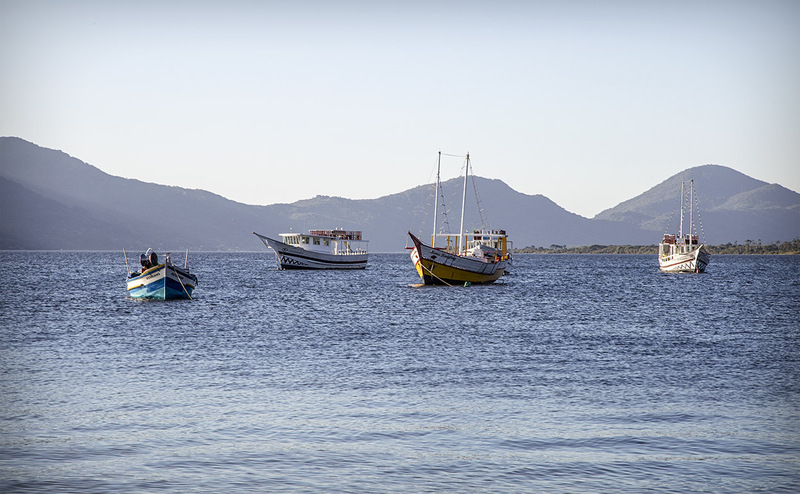 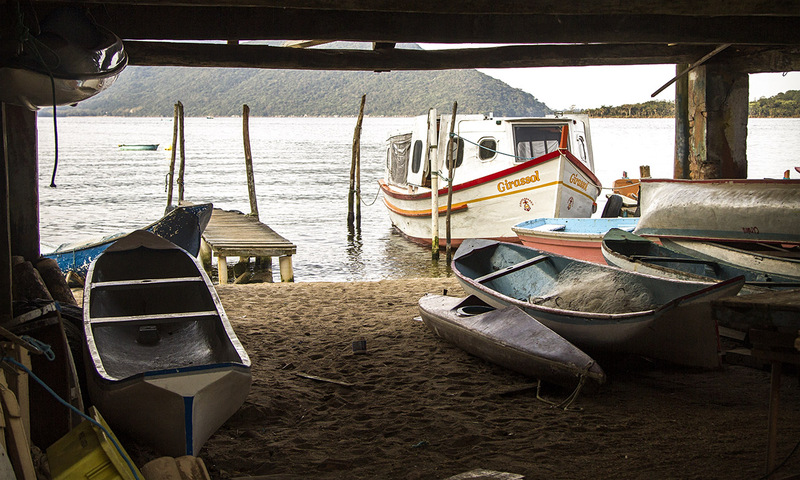 After the sea voyages in the Rivadavia and Rio de Janeiro packet boats the land route was made in Santa Catarina soil, where they came to establish their new homeland. The echoes and marks of this epic trajectory still remain everywhere in the south of Santa Catarina. 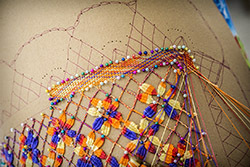 This work is a tribute to our those brave ancestors. Revisiting this and other pathways presents images of their landmarks, ther achievements and the time that has passed. 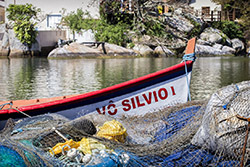 TONETTO, E. P.; GHIZZO, I.; PIROLA, L. "Colônia Azambuja: a imigração italiana no sul de Santa Catarina". 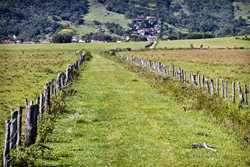 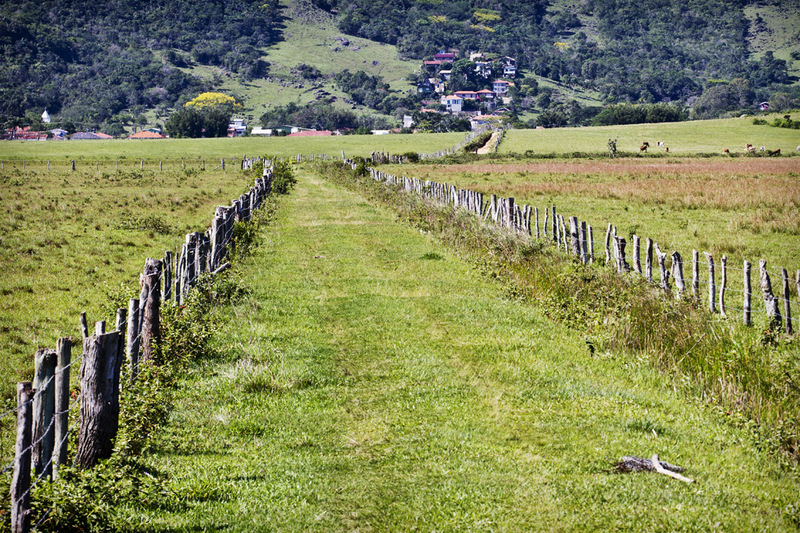 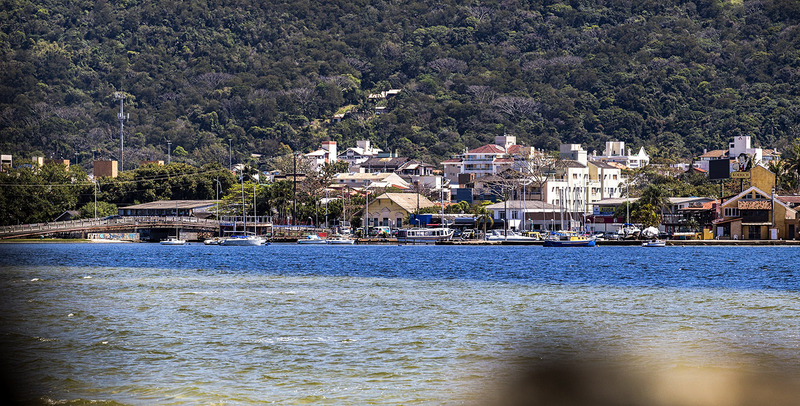 Florianópolis: EPAGRI, 2015, 211p. Description: Used in Costa da Lagoa neighborhood region. 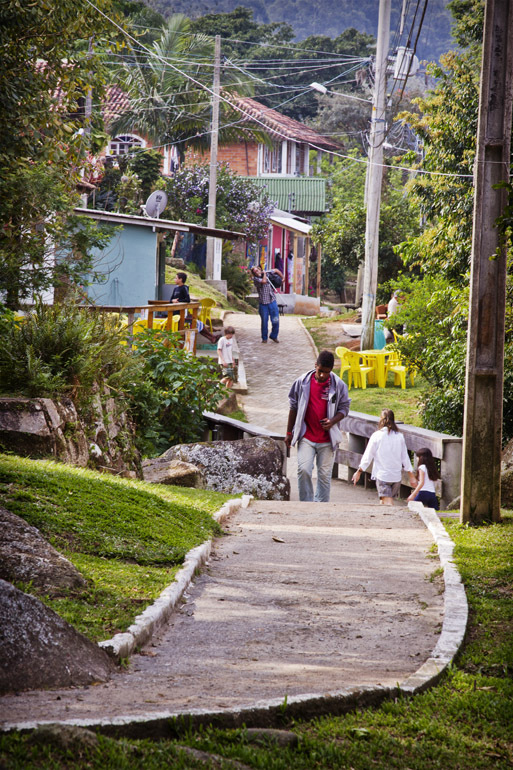 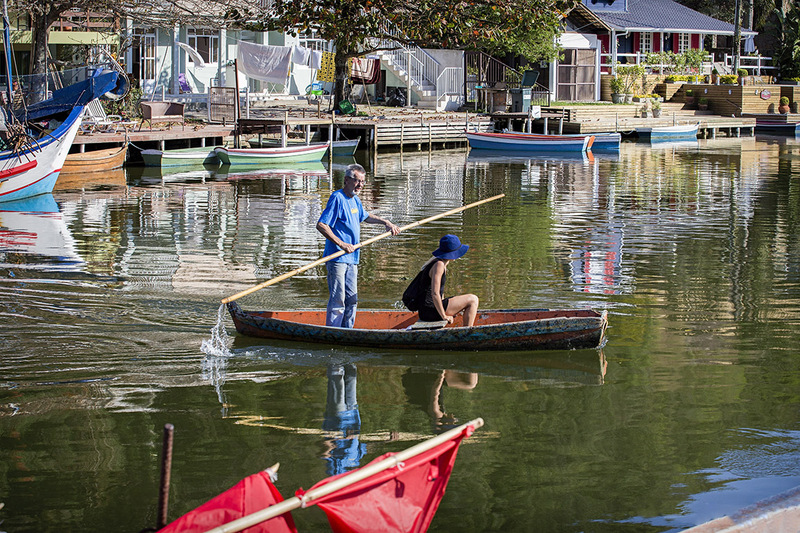 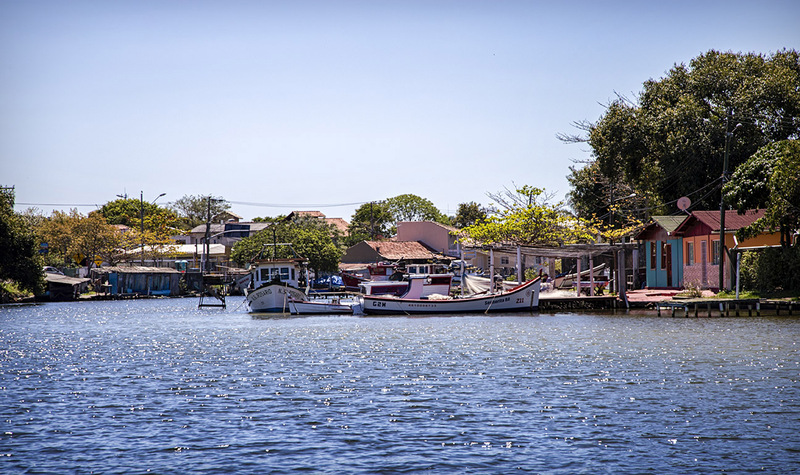 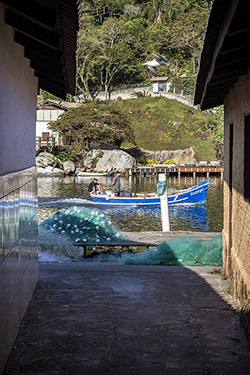 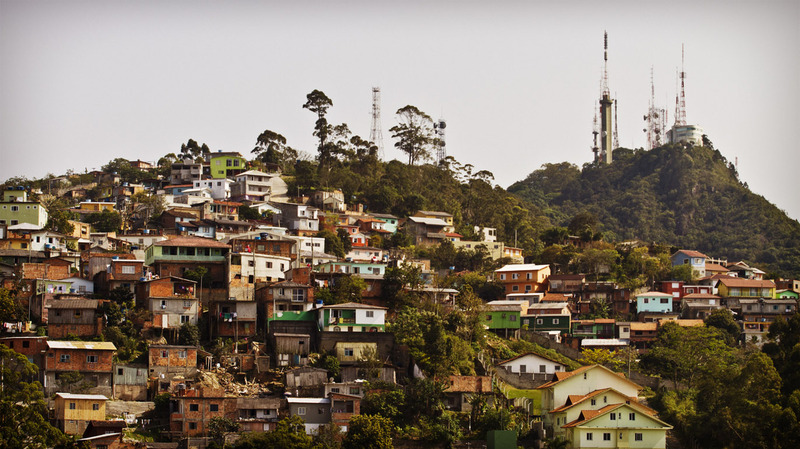 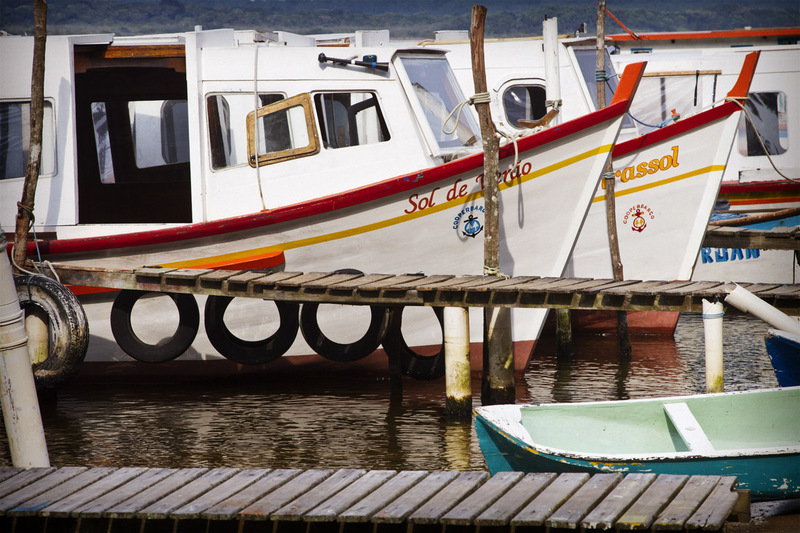 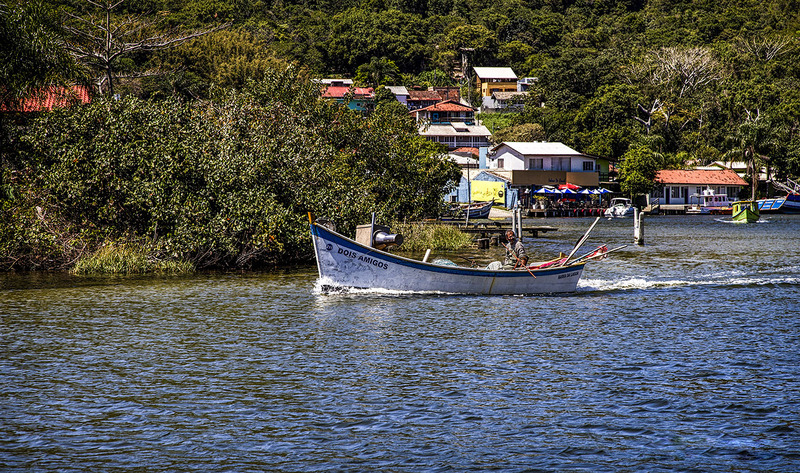 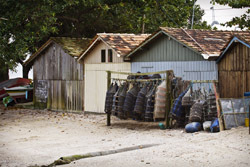 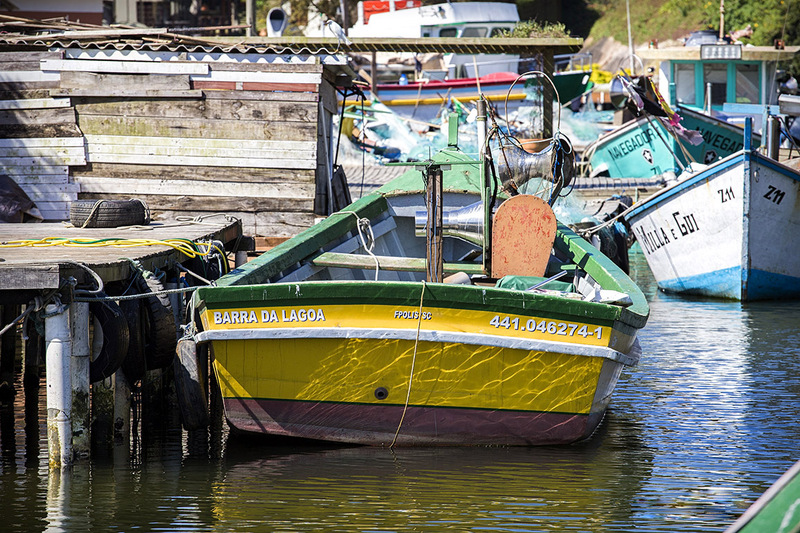 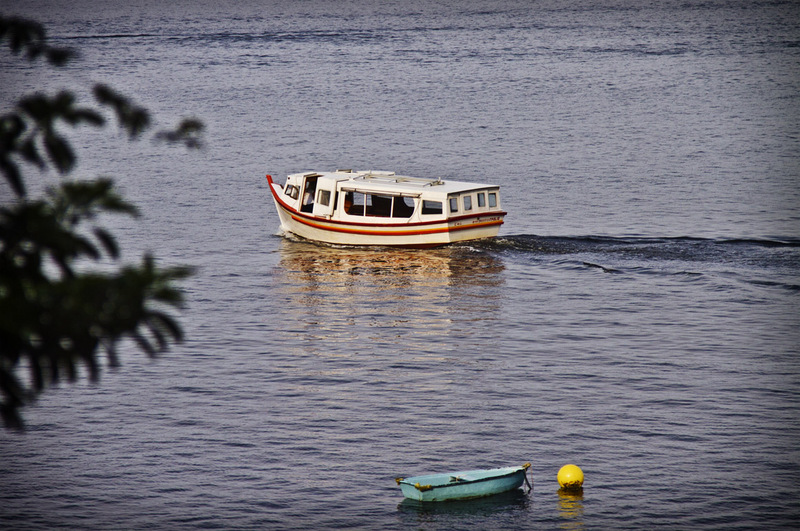 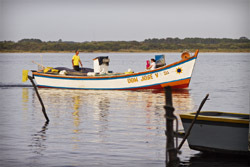 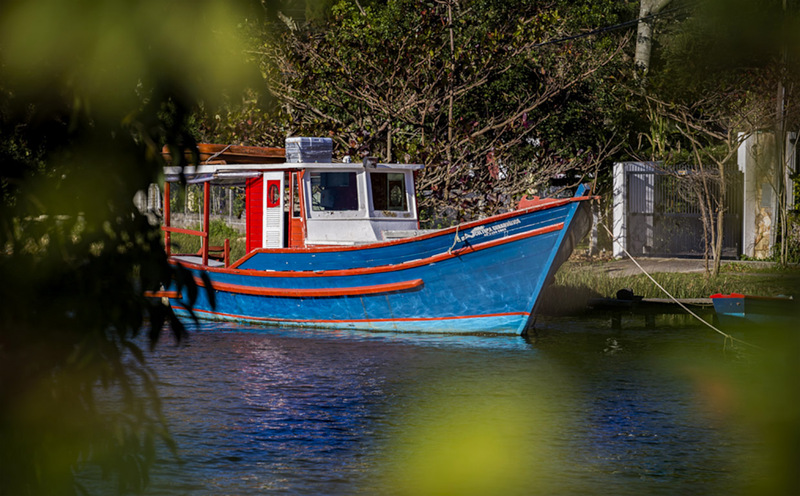 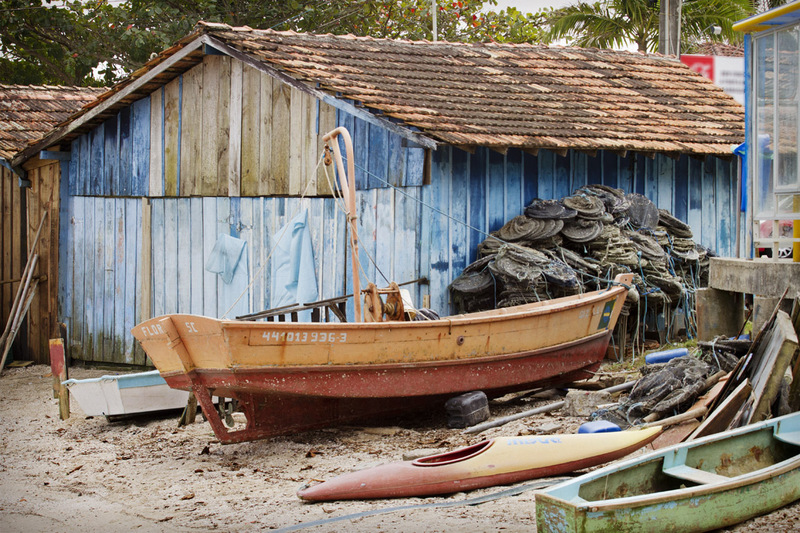 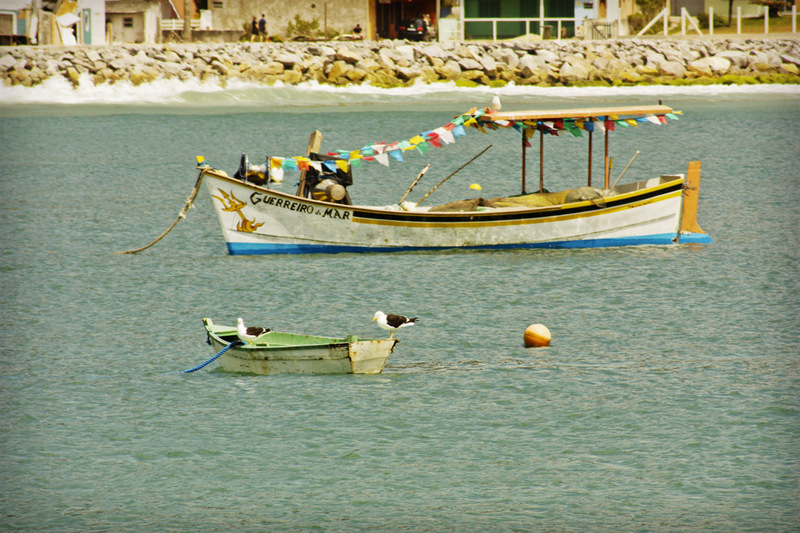 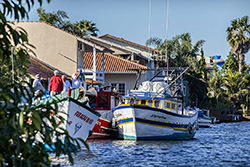 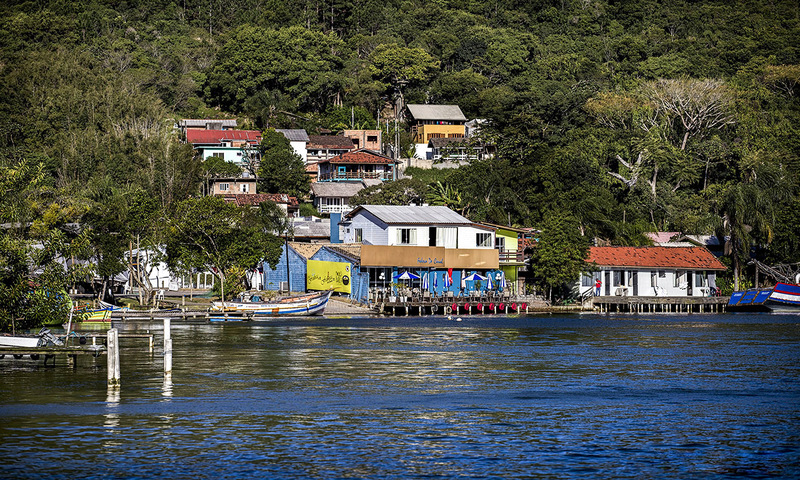 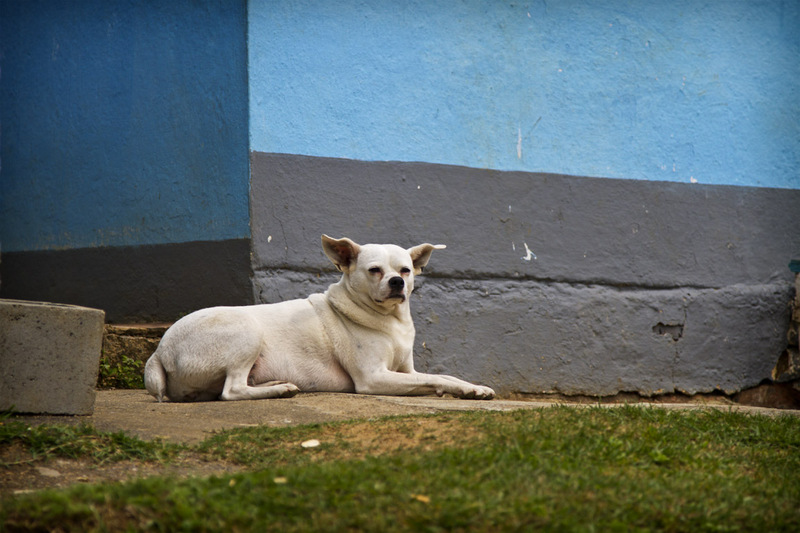 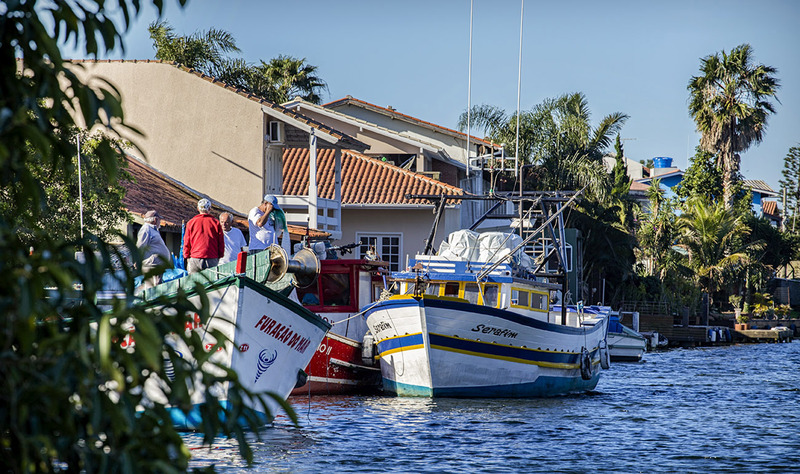 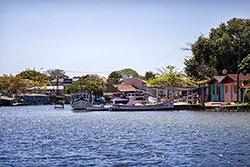 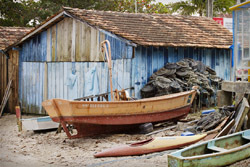 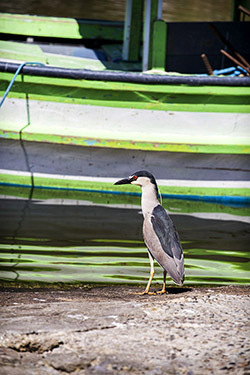 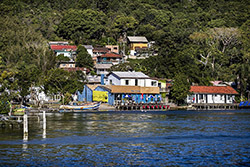 Description: Typical scene of Costa da Lagoa neighborhood. 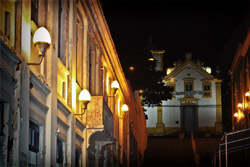 Description: Conselheiro Mafra Street in the city centre. 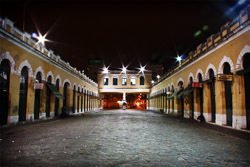 Description: The present market was built in two stages: the first part in 1899 (right side) and the second in 1915 (left side). 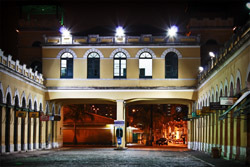 Description: Headquarters of the General Command of the Military Police of Santa Catarina. 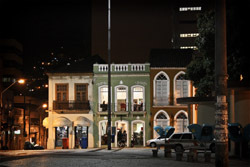 Description: Located at XV Novembro square in the city centre. Description: In this photograph Mrs. Lindacir Padilha Pires weaving bobbin lace. She integrates the Rio Vermelho lacemakers group. Description: The beginning of its construction was in 1739 and lasted for many years. 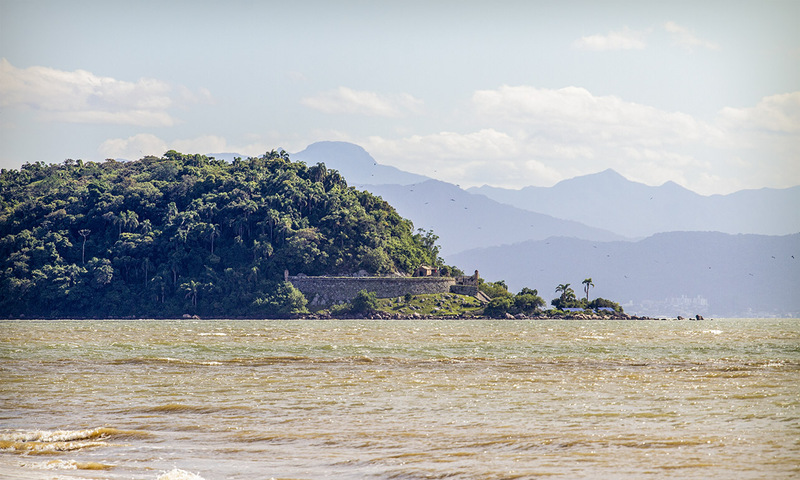 It was part of defensive triangle of the North of Santa Catarina Island in the first half of the eighteenth century. 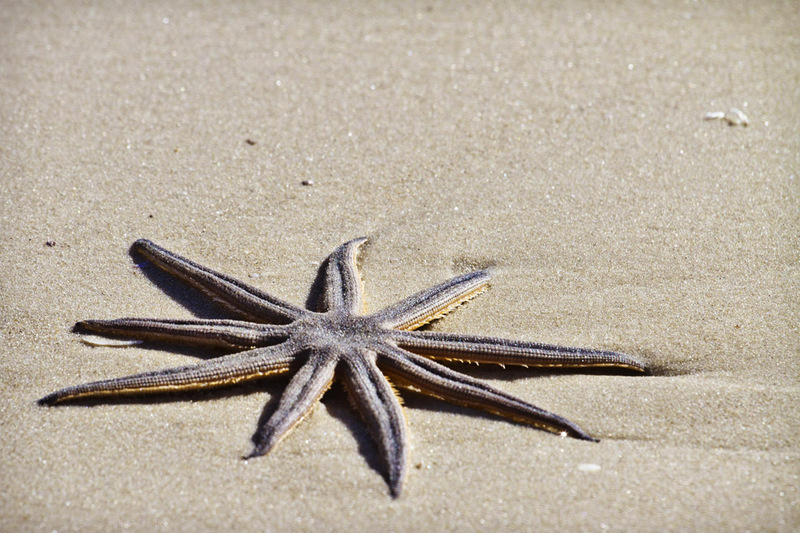 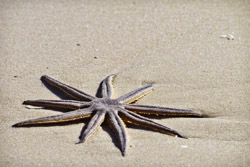 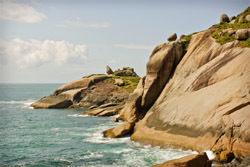 It is located at Anhatomirim island. 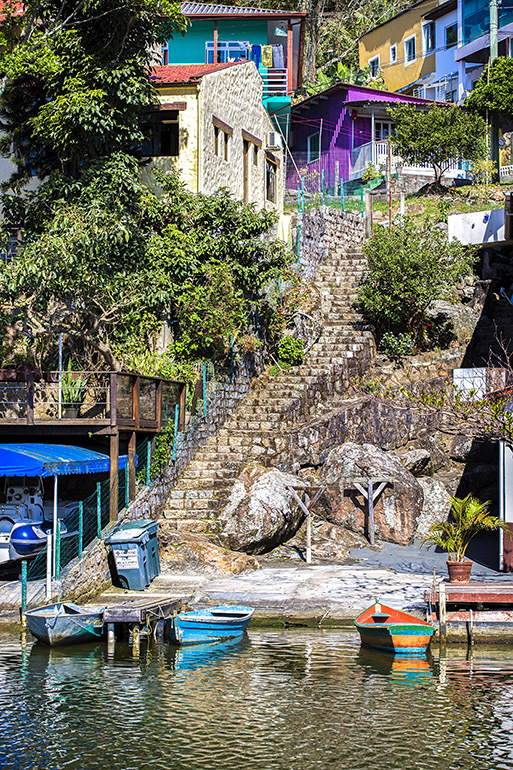 Description: Anchorage near the typical restaurants of Costa da Lagoa neighborhood. 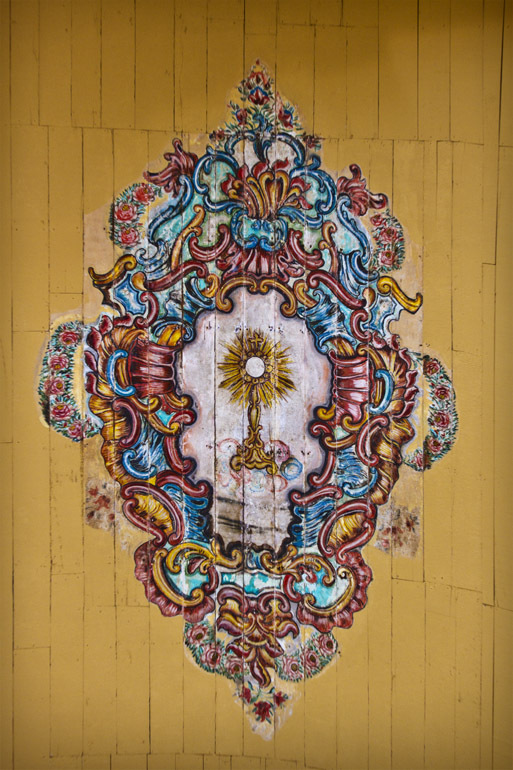 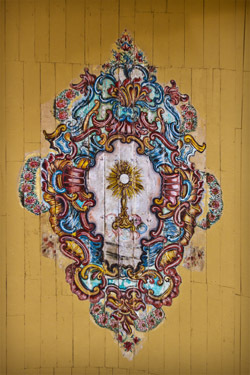 Description: Painting on the ceiling of Nossa Senhora das Necessidades Church in Santo Antônio de Lisboa neighborhood. 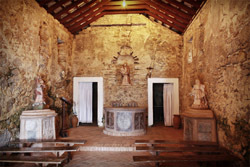 This church was built between 1750 and 1756. 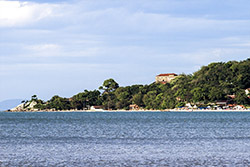 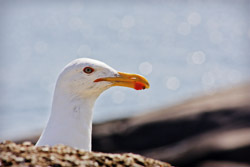 Description: Place: Santo Antônio de Lisboa beach. 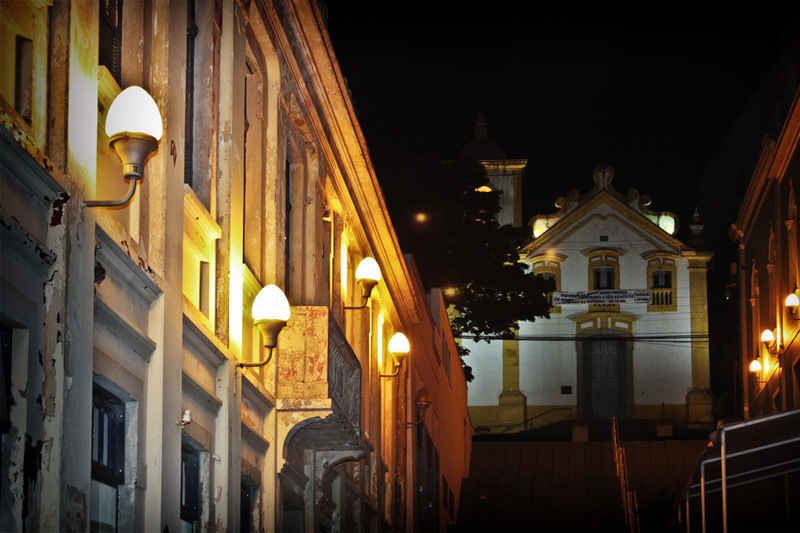 Description: Trajano Street in the city centre. 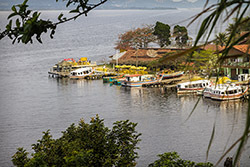 Description: From 1877, at the beginning of the immigration to the south of Santa Catarina, until 1890, there was not an infrastructure to receive the passengers who passed through Desterro port. 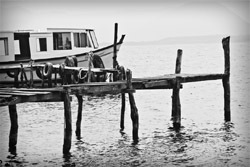 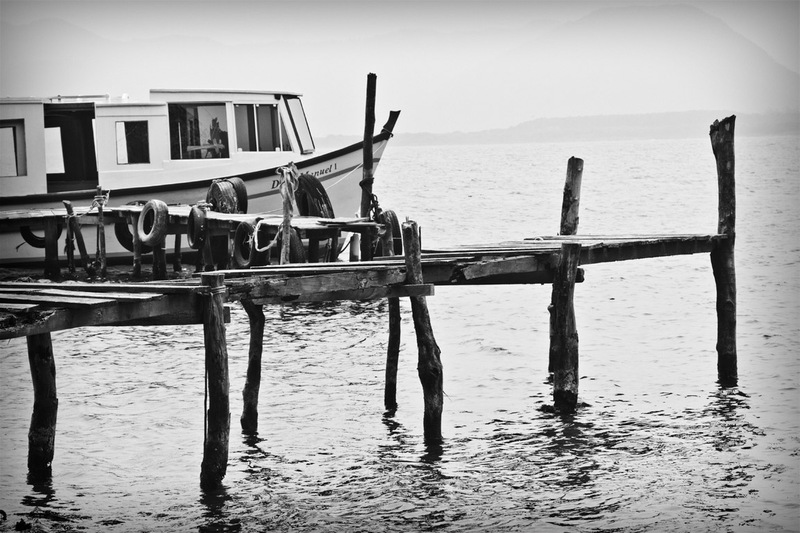 During the period that they were waiting for the boats to Laguna they remained in the vicinity of the docks. 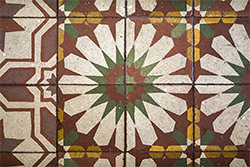 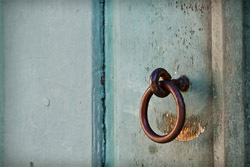 It was only at the end of 1889 that negotiations began for the construction of a place to house these immigrants: a house was acquired, reformed and adapted for that purpose. 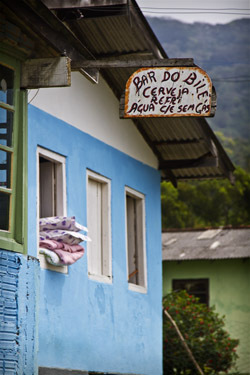 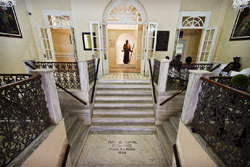 It was known as Immigrant Hostel of `Sacco do Padre`. 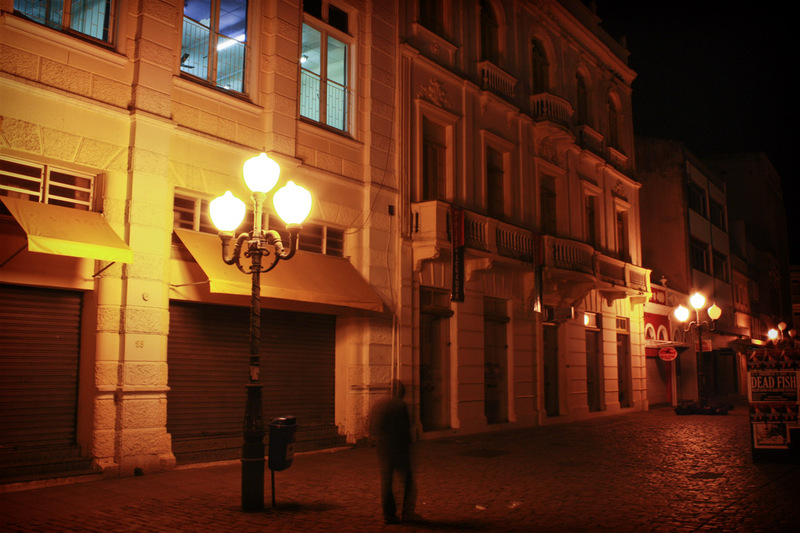 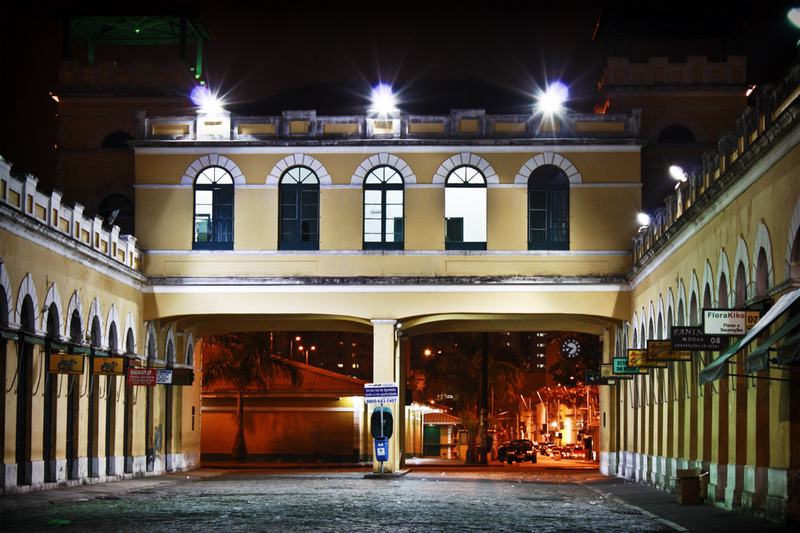 The building called "Domingos Fossari" was used since 1890 as Hostel of Imigrantes and since 1990 as Tourist Portal of Florianópolis. 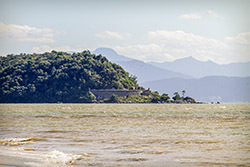 It is currently used by the Municipal Guard of Florianópolis. 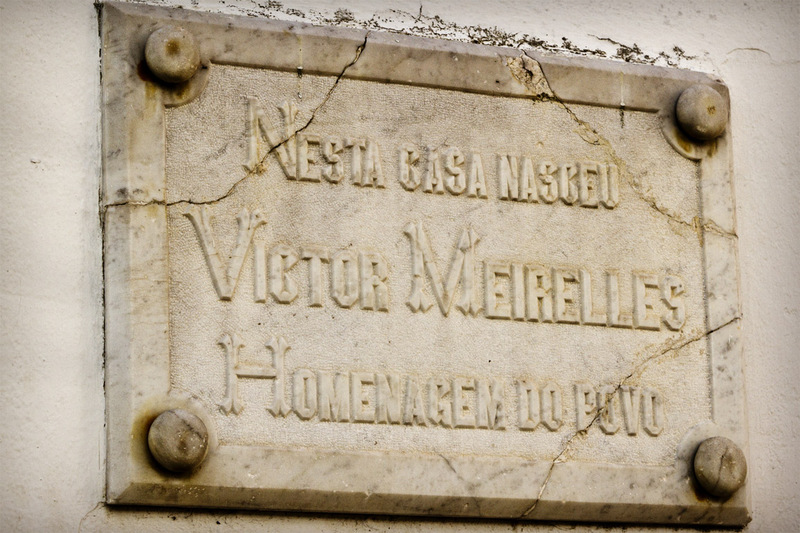 Description: Birthplace (August 18, 1832) of the painter, designer and teacher Victor Meirelles de Lima. 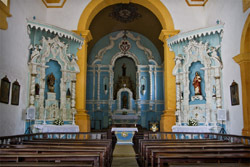 Author of historical paintings, portraits, panoramas and most ot the popular Brazilian screens, as the "First Mass in Brazil." 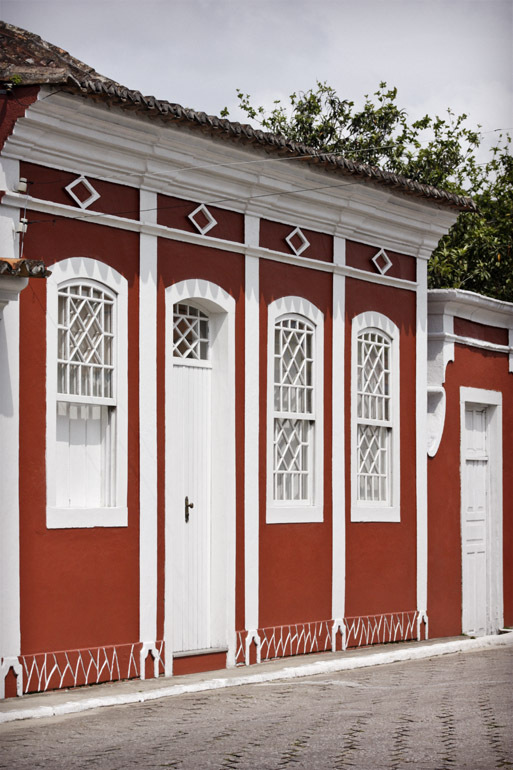 The house is one of the few buildings of nineteenth-century style clearly preserved in Florianópolis Centre. 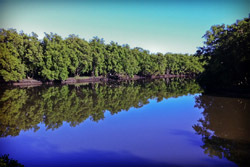 Description: Mangrove located in the Itacorubi neighborhood. 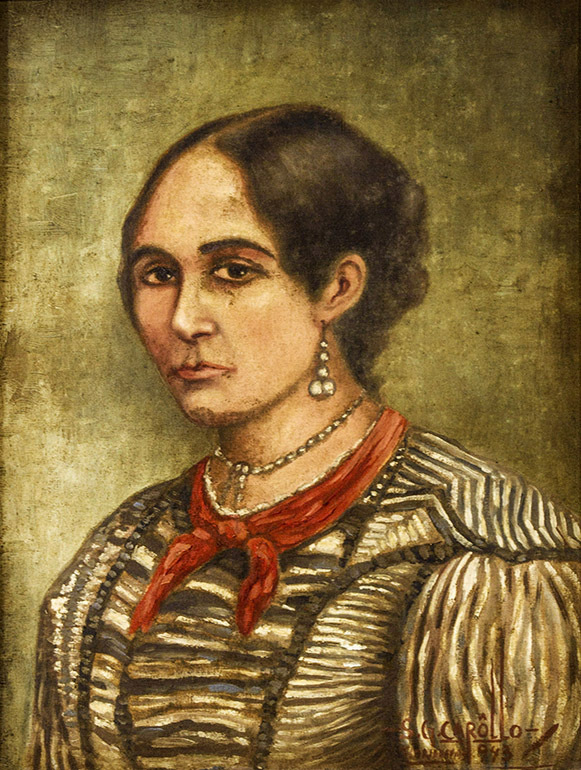 Description: Oil on canvas from 1943, the work of the Brazilian painter Sobragil Gomes Carollo. 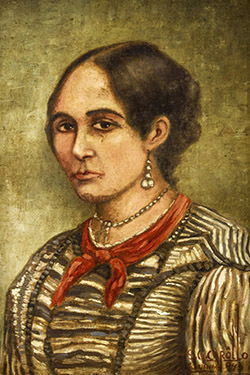 Born in Alegrete in 1896, studied at the National School of Fine Arts in Rio de Janeiro, and later in Paris, France. 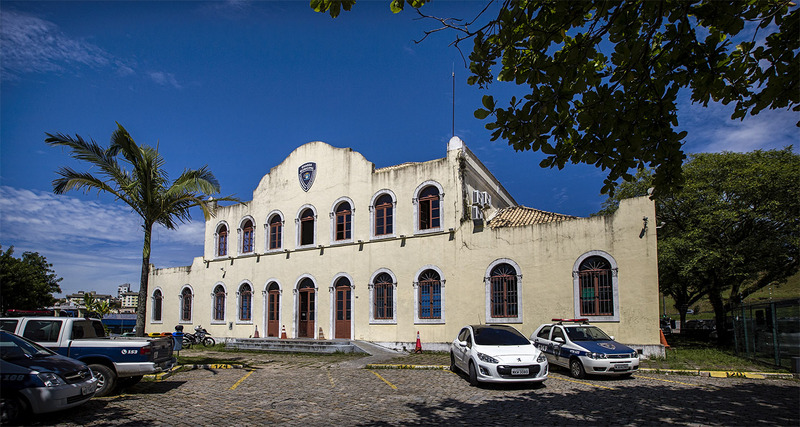 Collection of the Headquarters of the General Command of the Military Police of Santa Catarina. 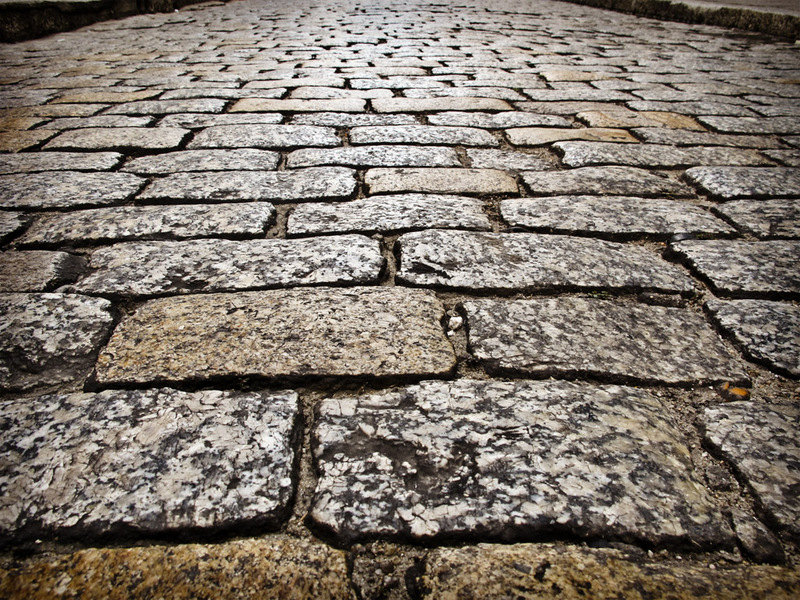 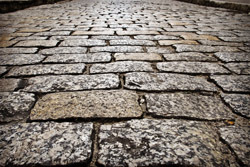 Description: The paving of the square is stone. 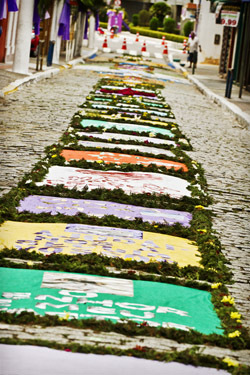 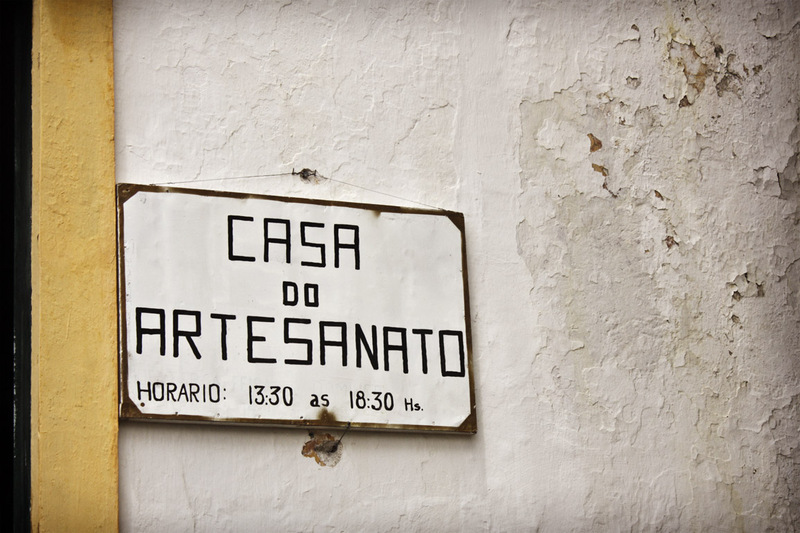 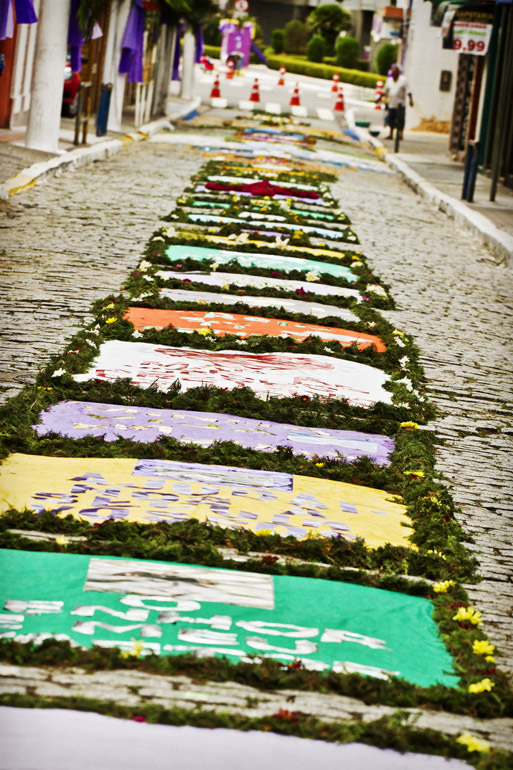 It is one of the oldest streets of Santo Antônio de Lisboa neighborhood. 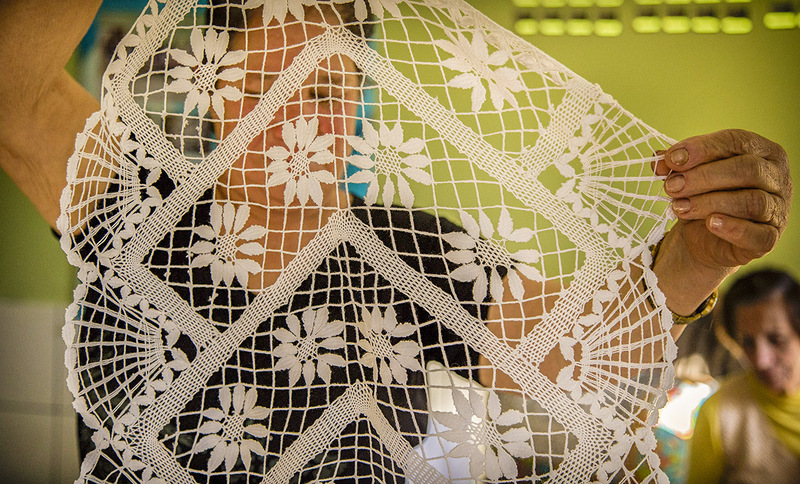 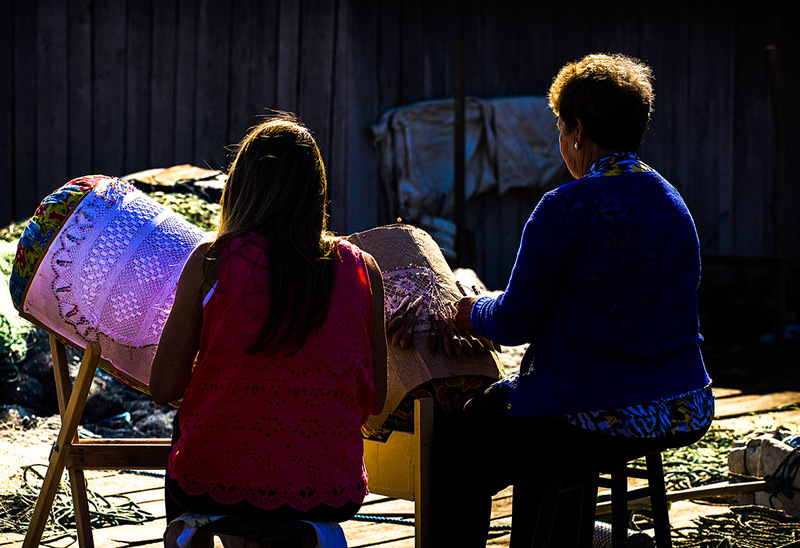 Description: In this photograph Mrs. Ruth Gonçalves Martins and her daughter Fernanda weaving bobbin lace. 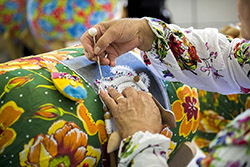 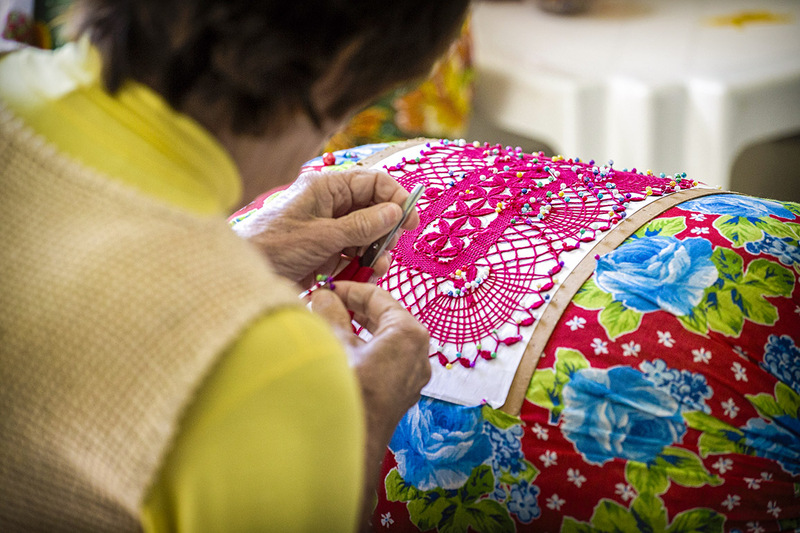 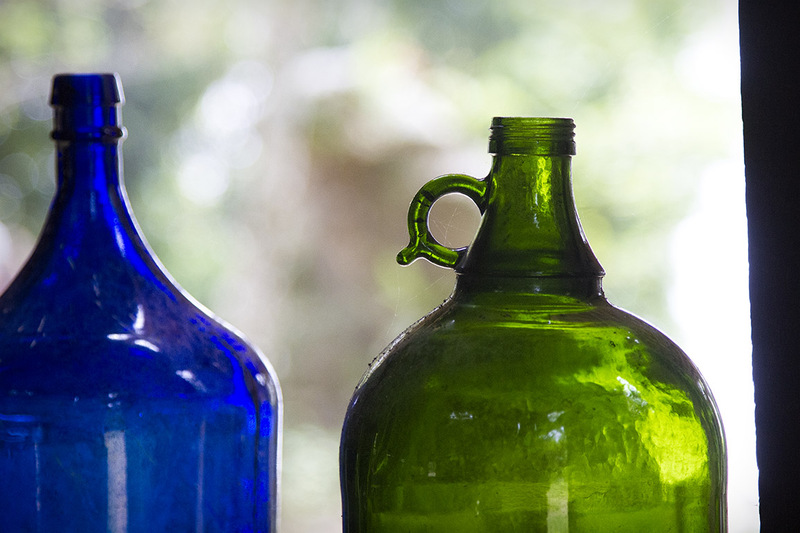 They integrate the Rio Vermelho lacemakers group. 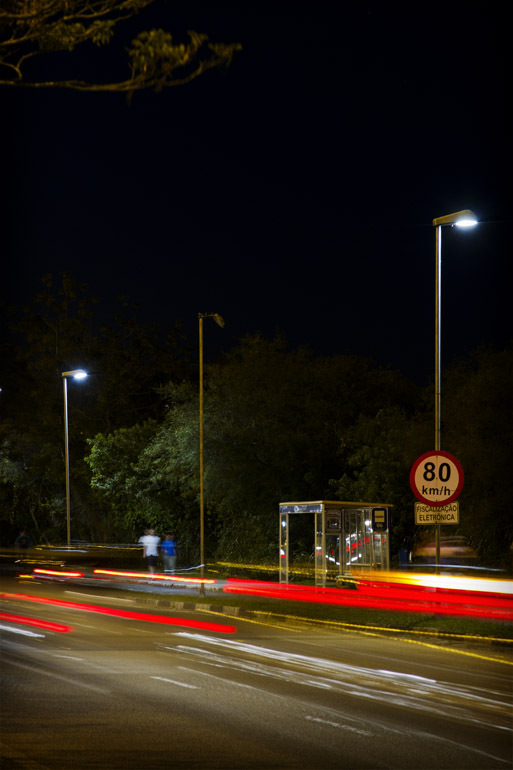 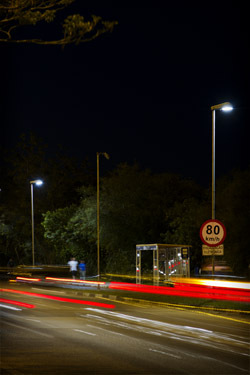 Description: Night view. 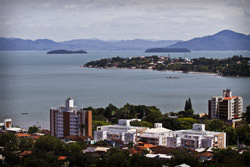 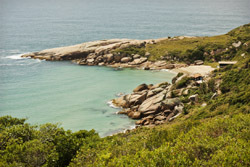 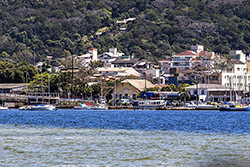 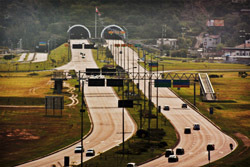 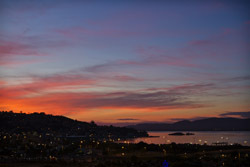 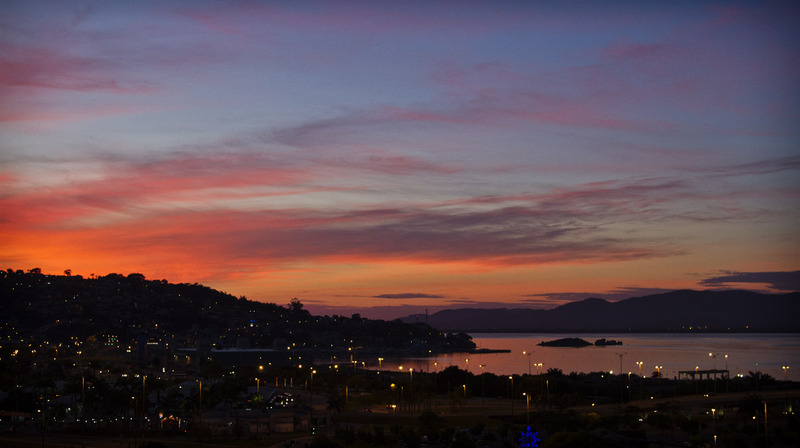 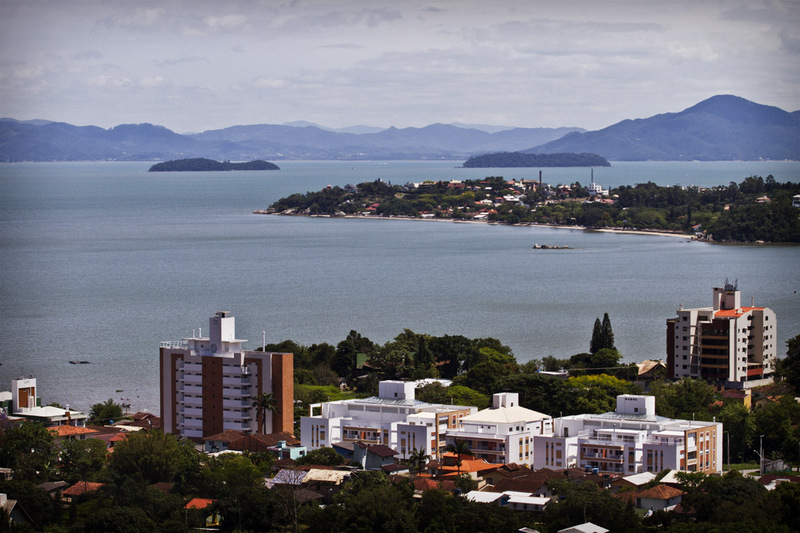 The bridge connects the mainland and the island town of Florianopolis part. 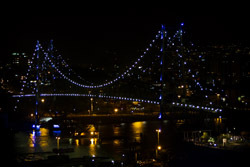 It is one of the largest suspension bridges in the world and the largest in Brazil. Its construction began on November 14, 1922 and was inaugurated on May 13, 1926. 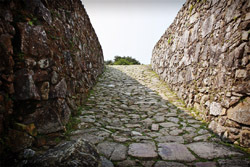 He is currently closed for the passage of pedestrians or vehicles due to a reform of its structure. 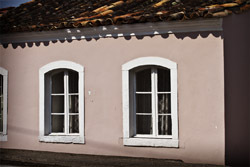 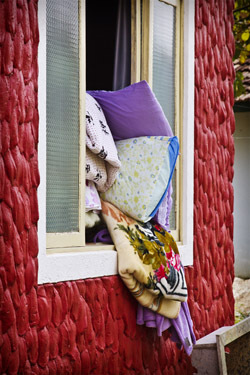 Description: Clay sculpture traditionally placed in residential windows. 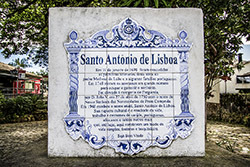 Place: Santo Antônio de Lisboa neighborhood. 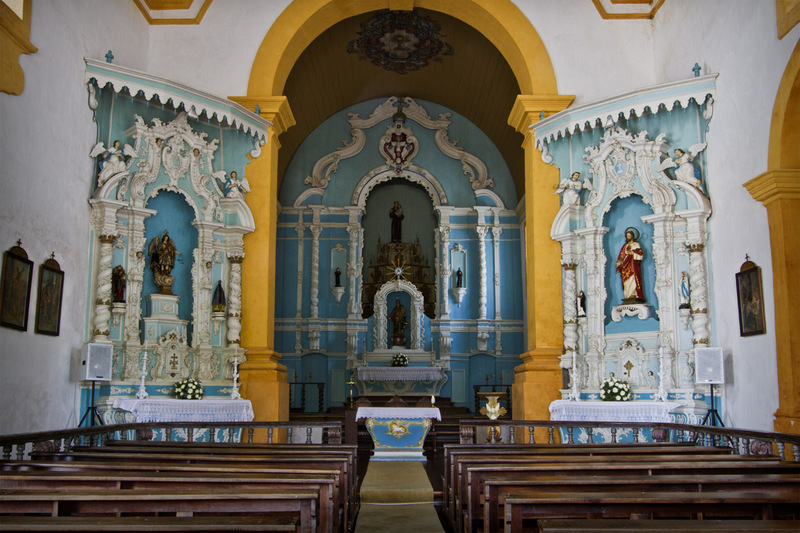 Description: Nossa Senhora do Rosário Church and São Benedito, located at Marechal Guilherme Street in the city centre. Description: Sink holy water of Nossa Senhora das Necessidades Church in Santo Antônio de Lisboa neighborhood. 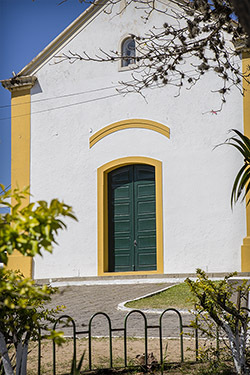 This church was built between 1750 and 1756. Description: It is located in Namorados Square. 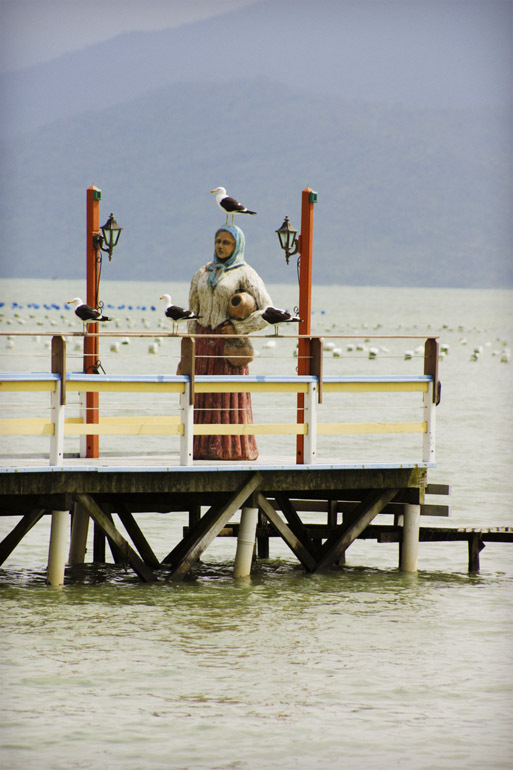 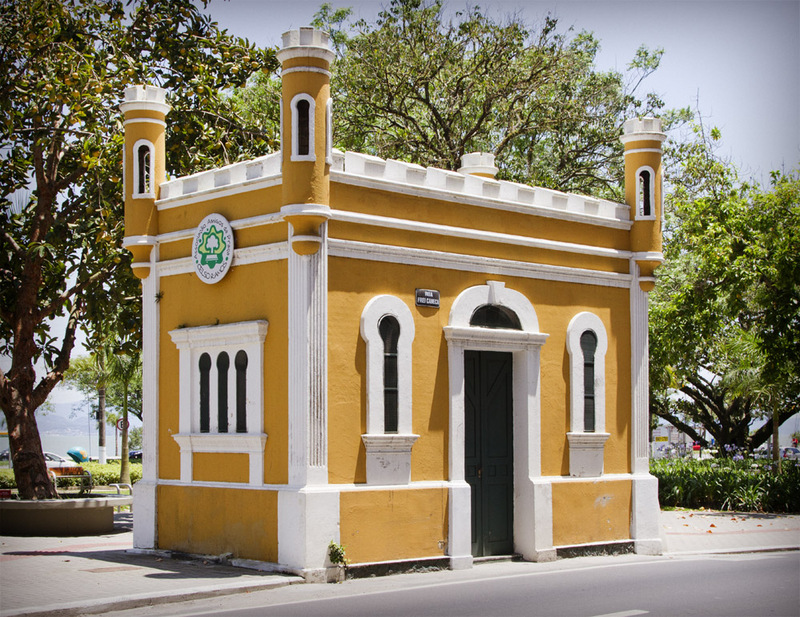 It is part of the first Sewage System of Florianópolis. 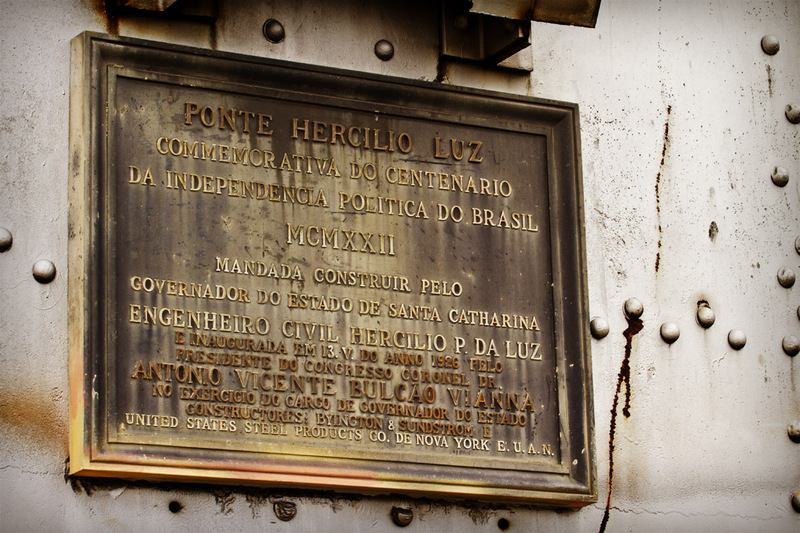 It was inaugurated on 11.07.1916.